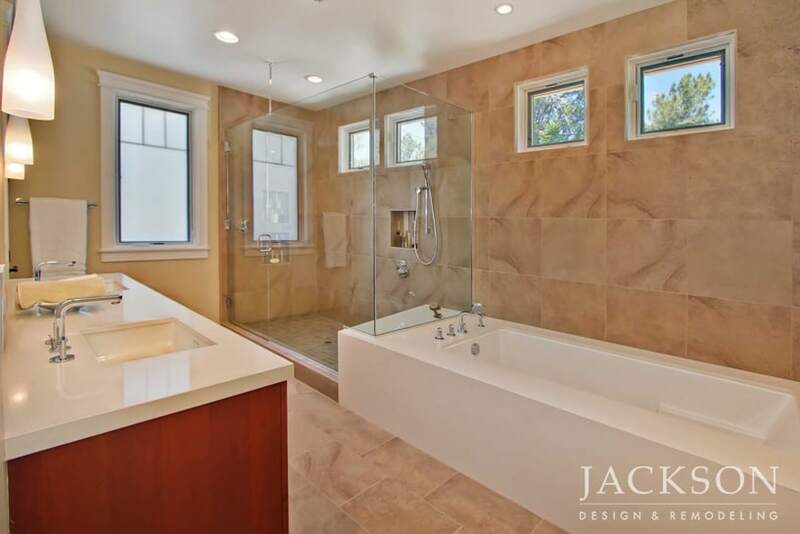 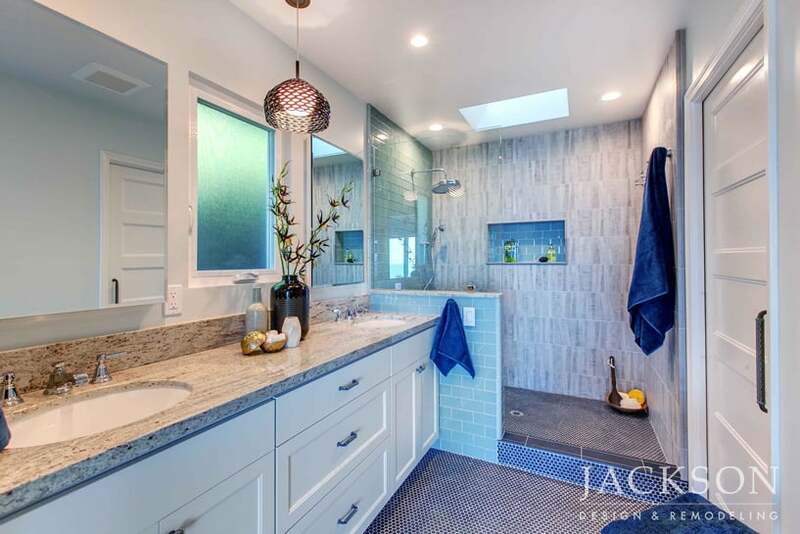 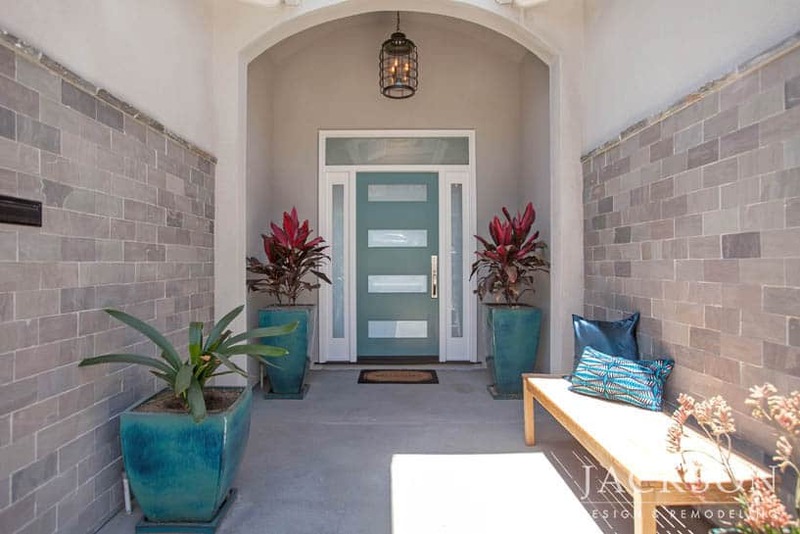 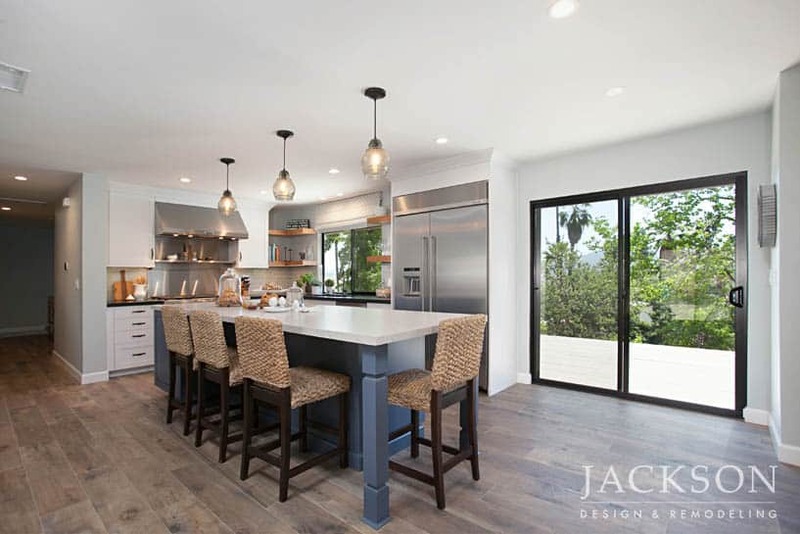 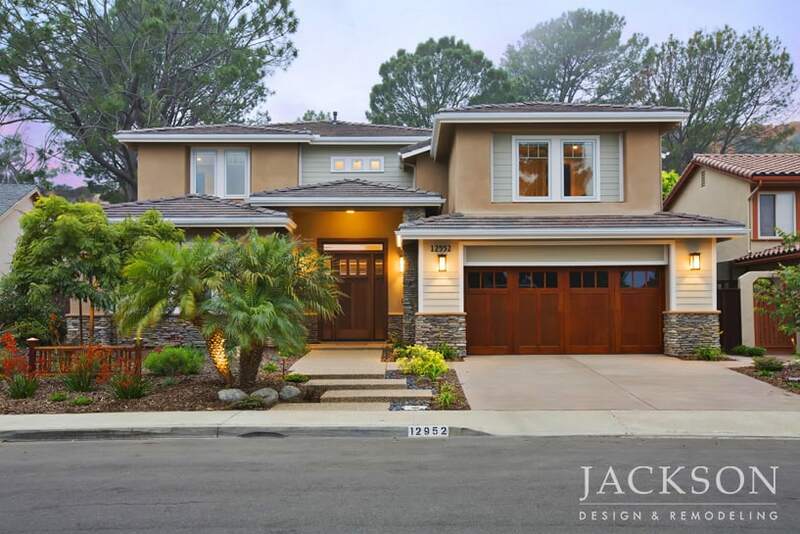 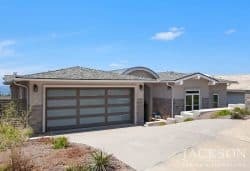 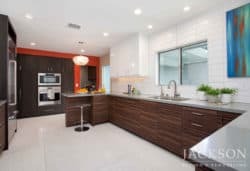 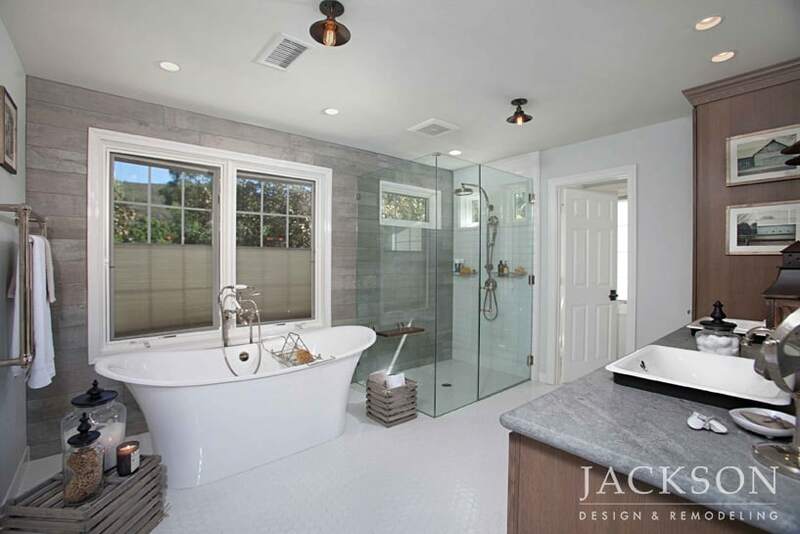 A San Diego whole home remodel should make you feel more comfortable and energized in your home with a whole house renovation that suits your lifestyle needs today. 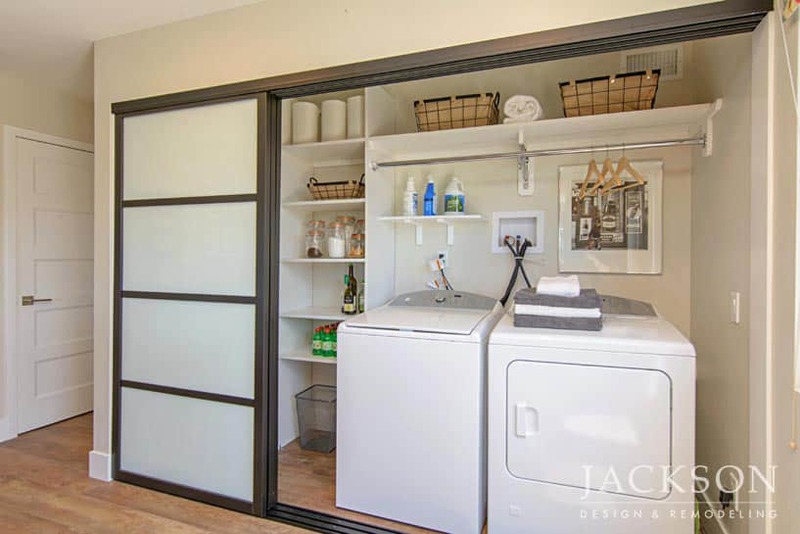 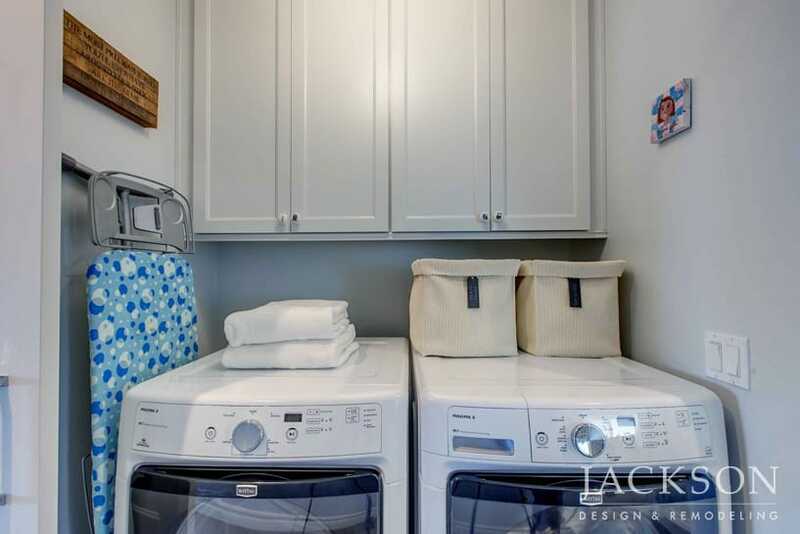 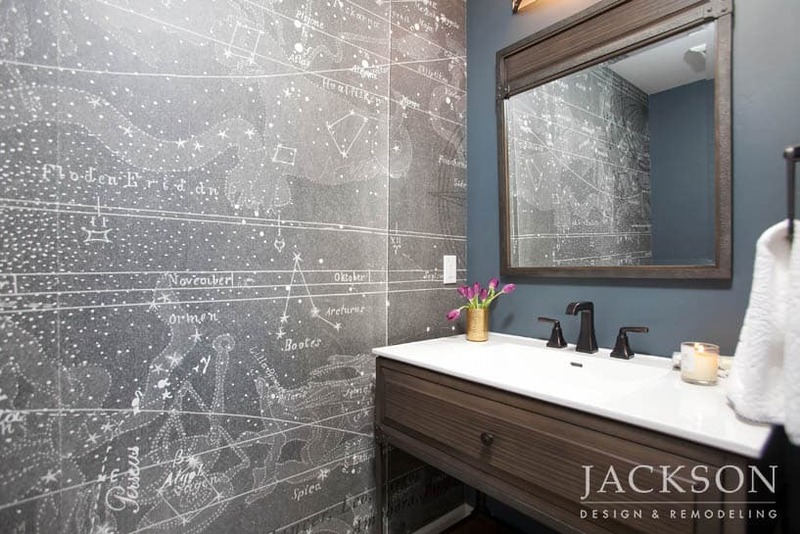 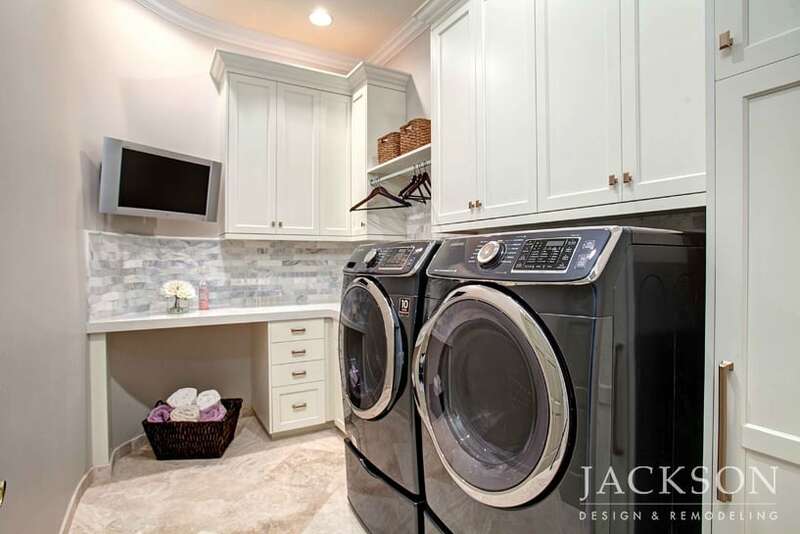 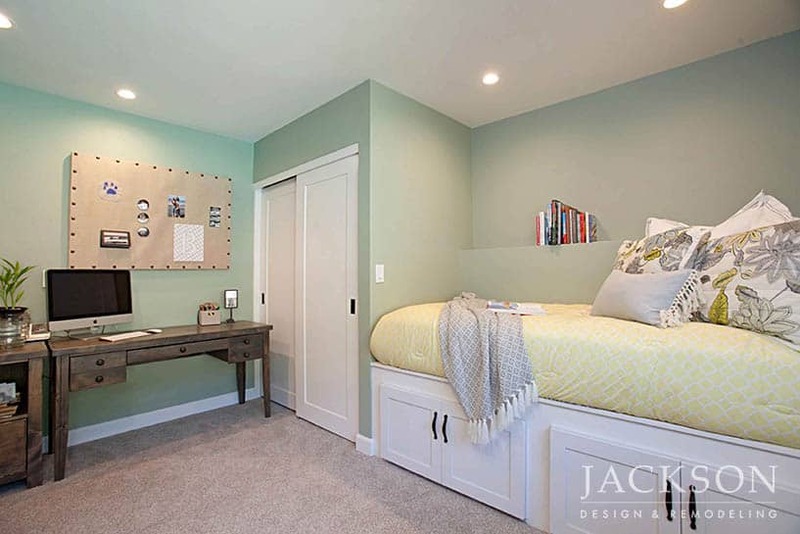 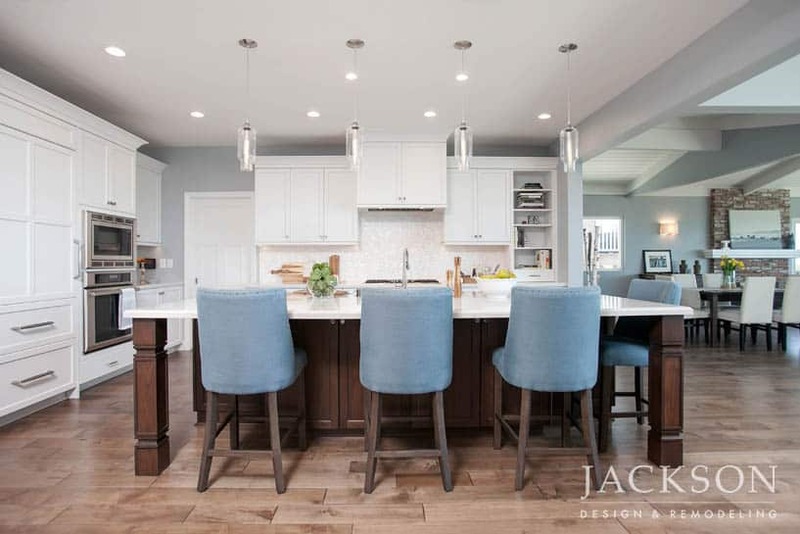 We guide you to choices that will make your space feel authentically personal, while achieving the practical functionality you need in your whole home remodel. 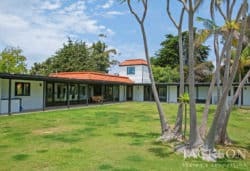 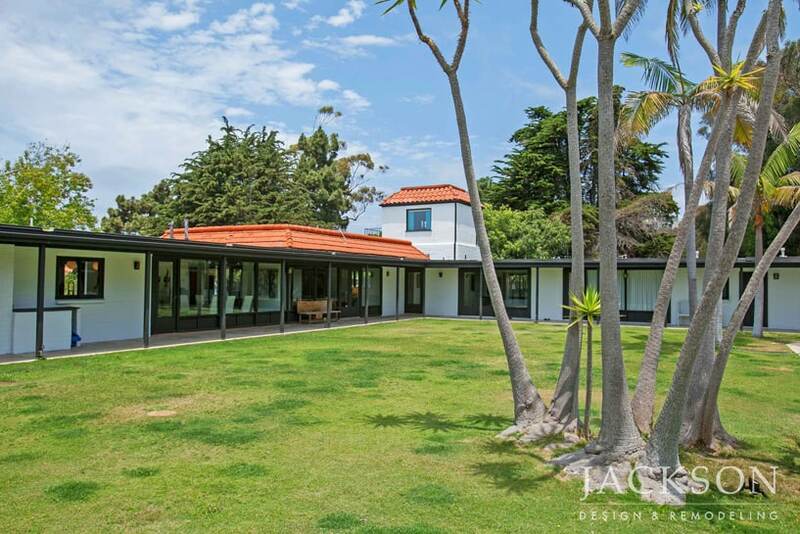 With lines and colors inspired by the artist Mondrian, the architecture of this striking home seems to reach toward the nearby ocean from every angle. 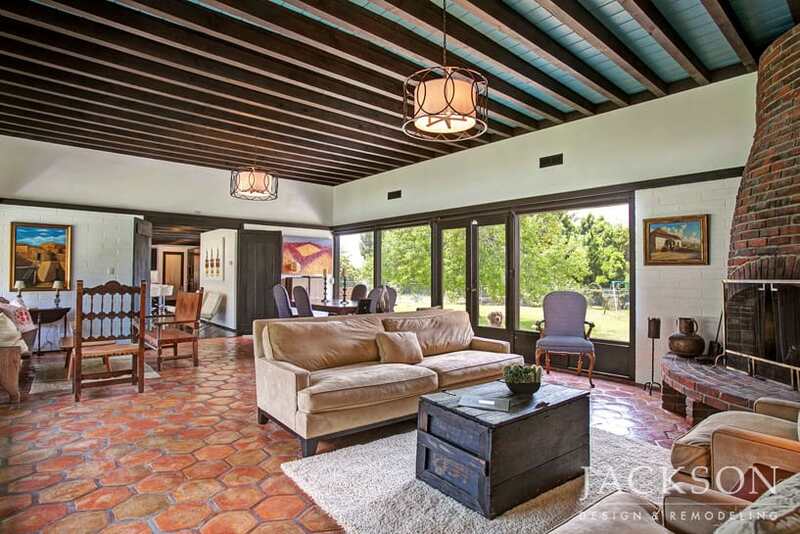 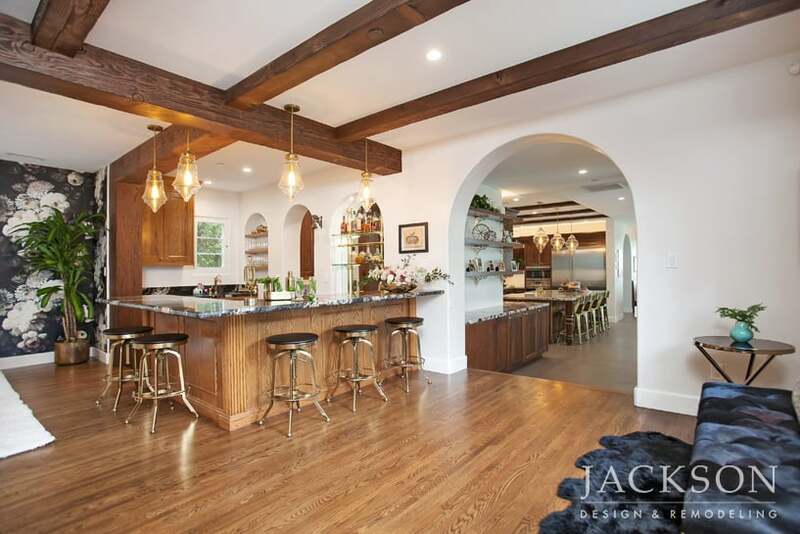 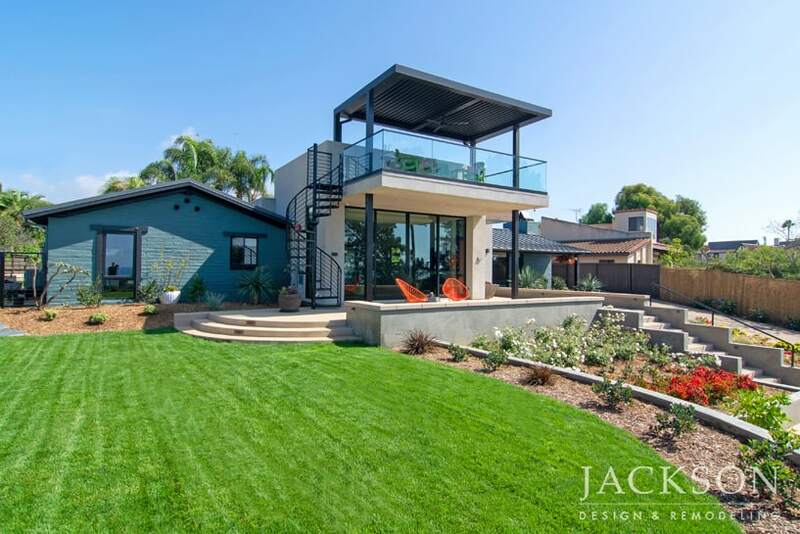 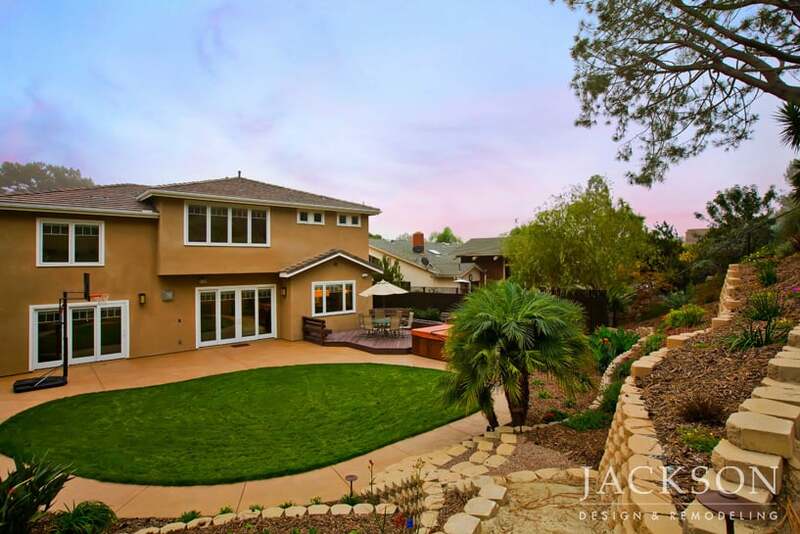 Retaining the existing adobe structure within the extensive whole home remodel makes an innovative design statement balancing original character with exciting modern ideas. 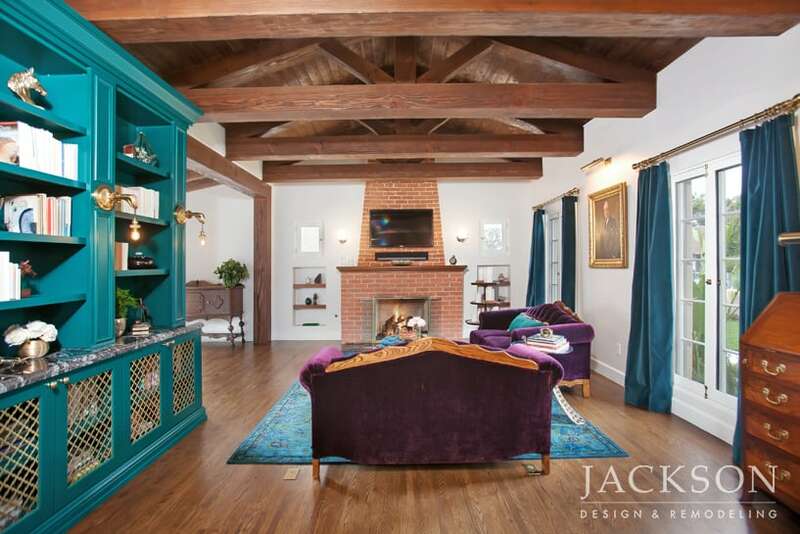 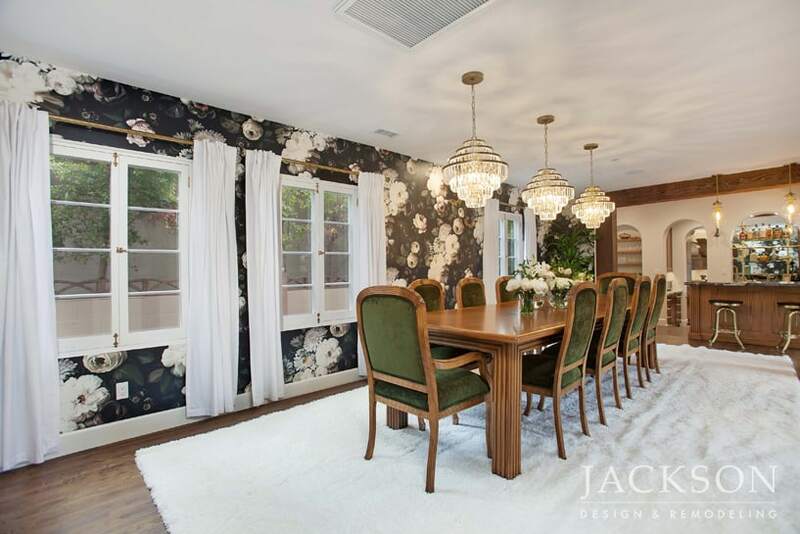 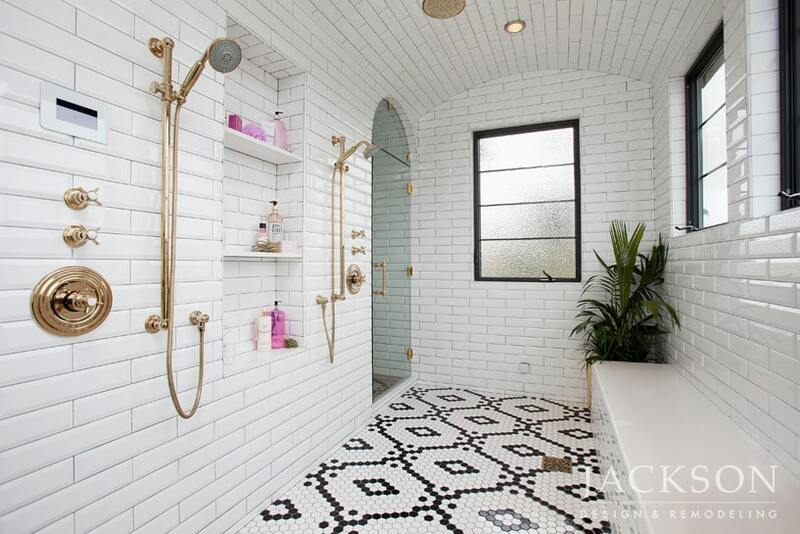 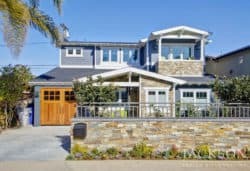 This historic home, originally built in the 1920s to mimic the Old Hollywood homes of the time, was dramatically transformed for a young family while retaining its essential glamour and character. 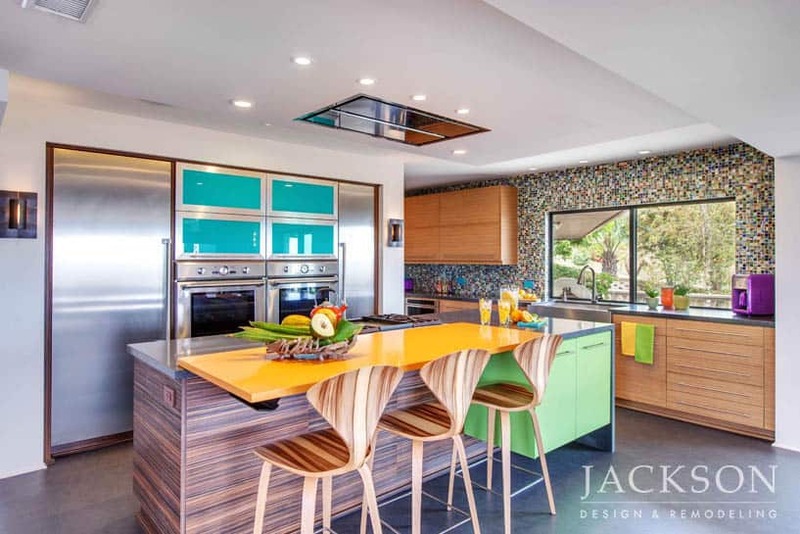 Throughout the expansive home each space has a distinct personality which adds to an overall sense of colorful personal expression and vibrant family living. 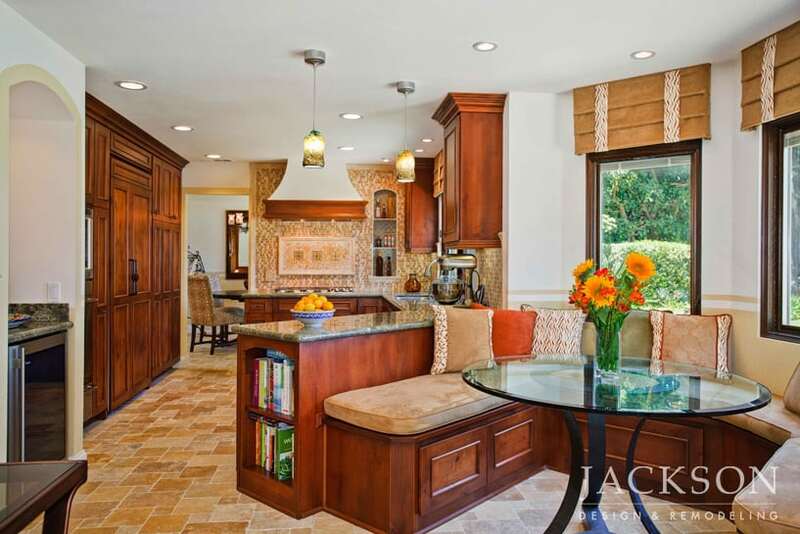 After 15 years, our clients needed their home to adapt to changing family dynamics. 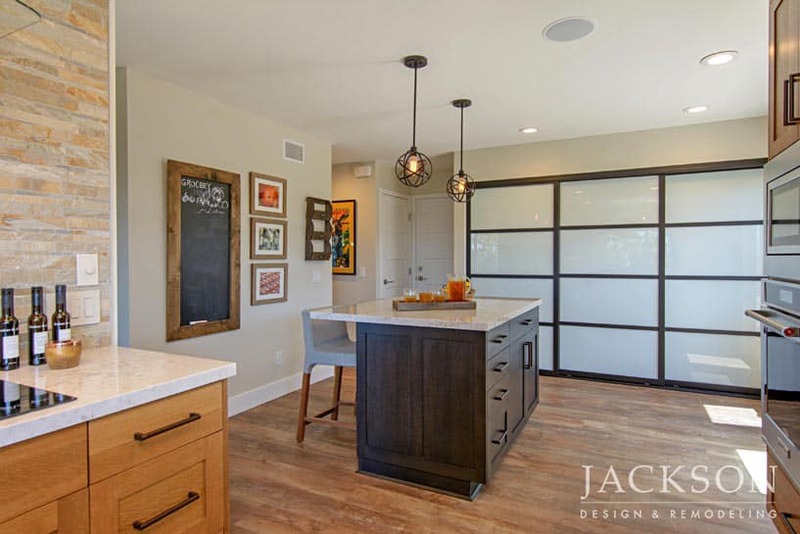 Three generations now easily join together to enjoy the comfortable and appealing surroundings of their award winning home. 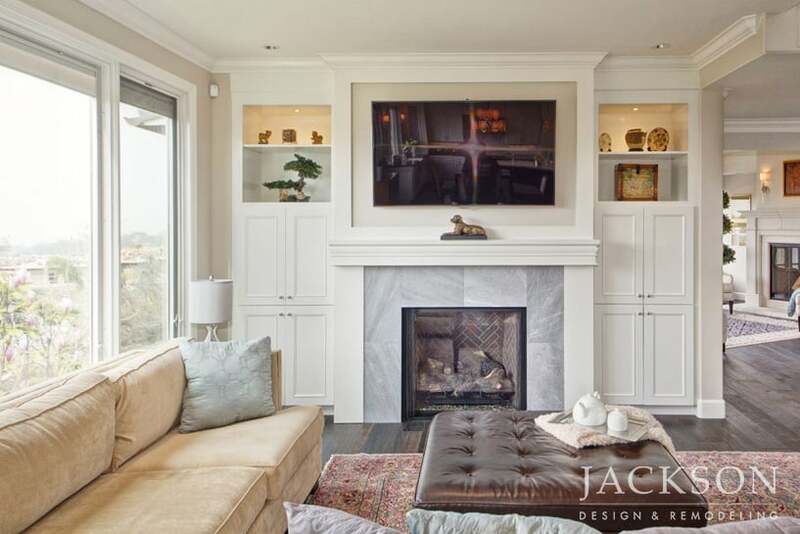 This hillside home with captivating views is the dream of a couple who wanted a beautiful home to grow old in together and to enjoy now with their teenager and beloved rescue Labradors. 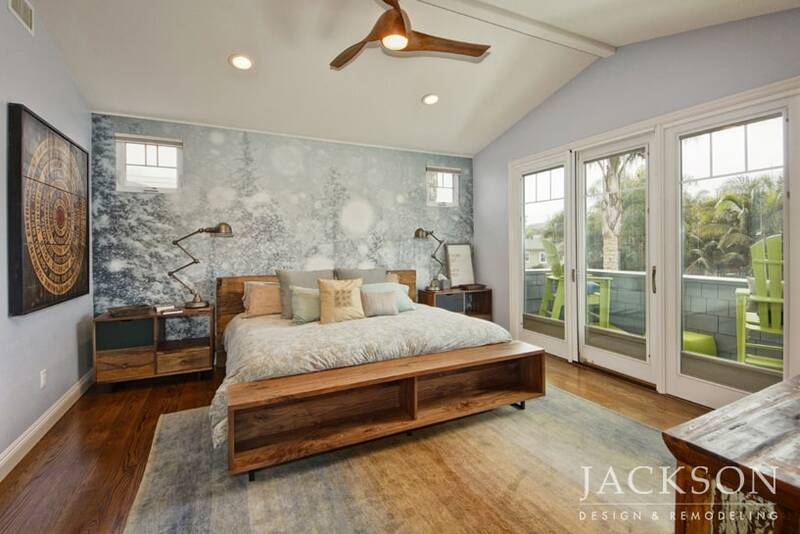 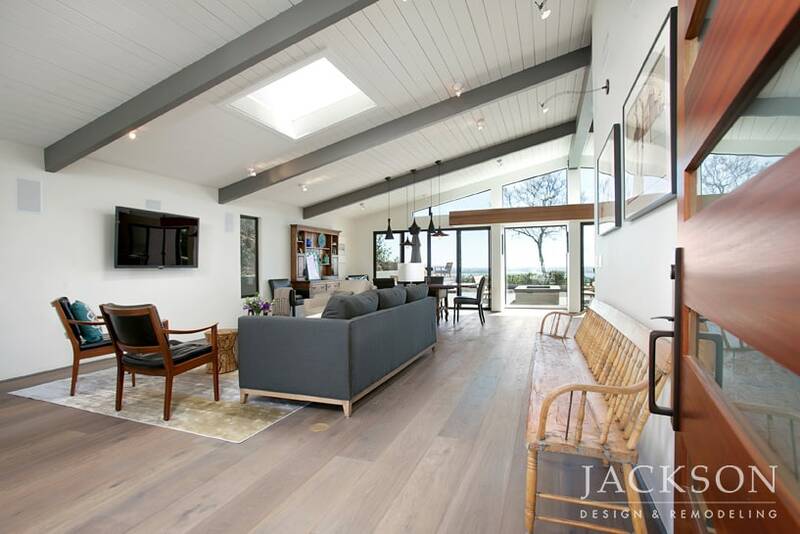 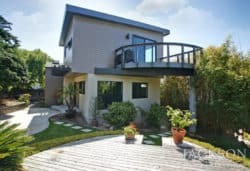 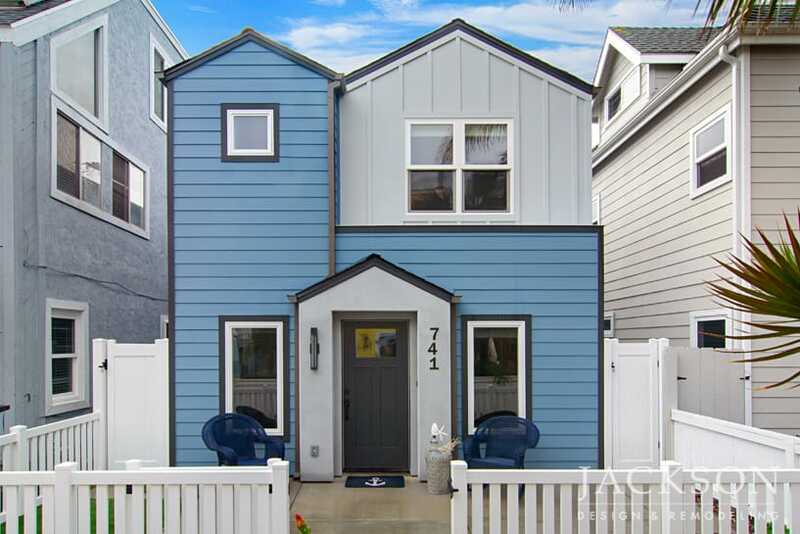 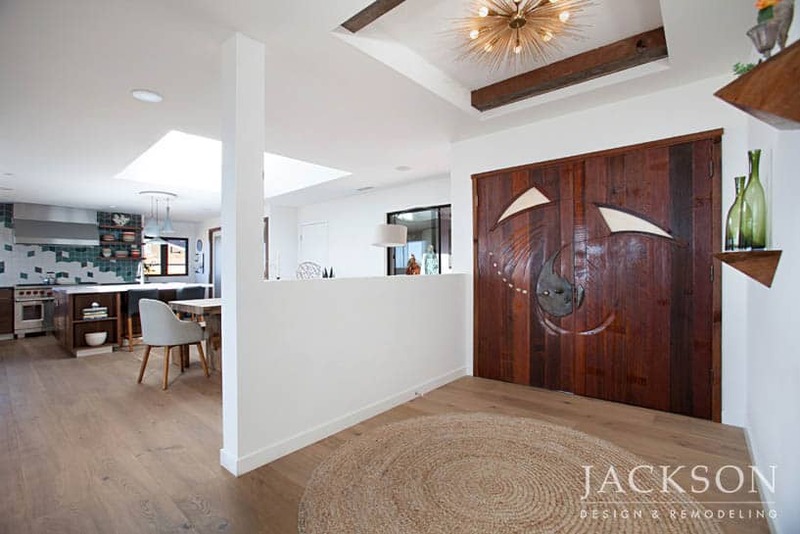 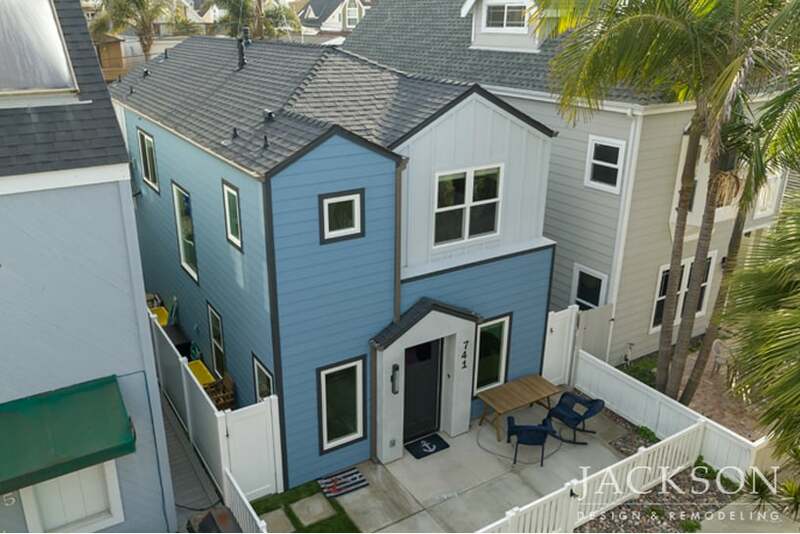 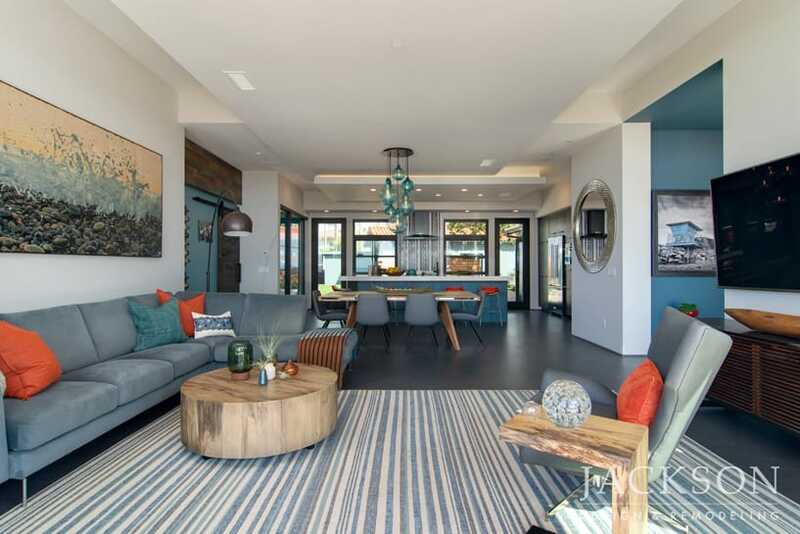 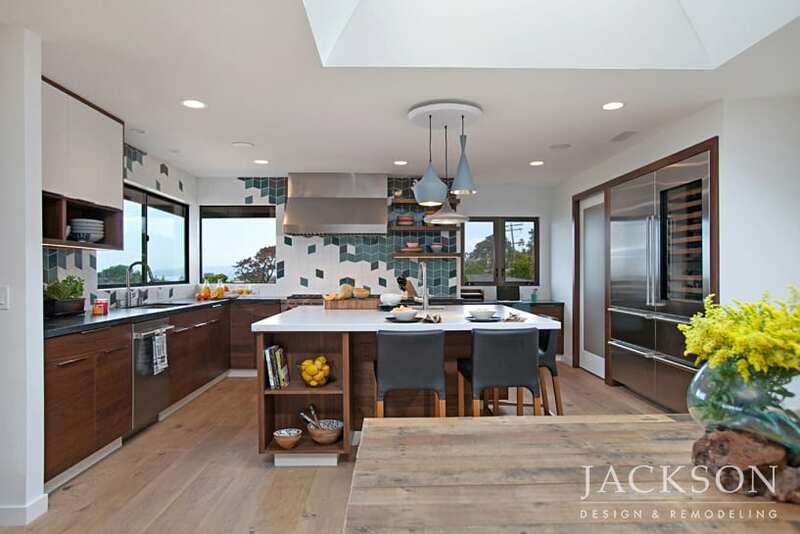 Designed for a young professional couple with a growing family, this Ocean Beach home is infused with personal expression. 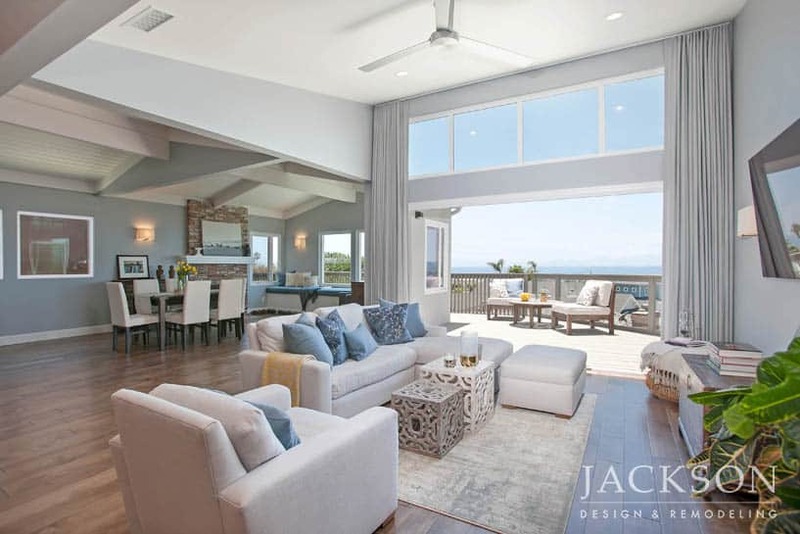 The new design takes advantage of panoramic ocean views. 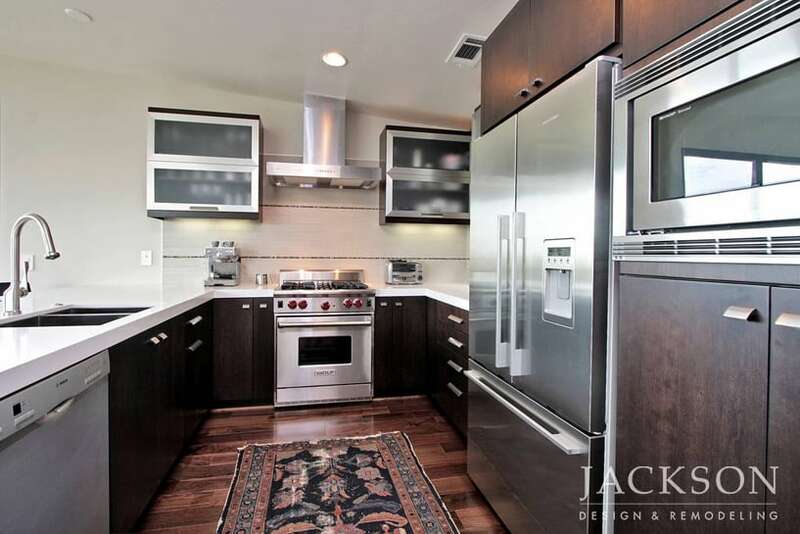 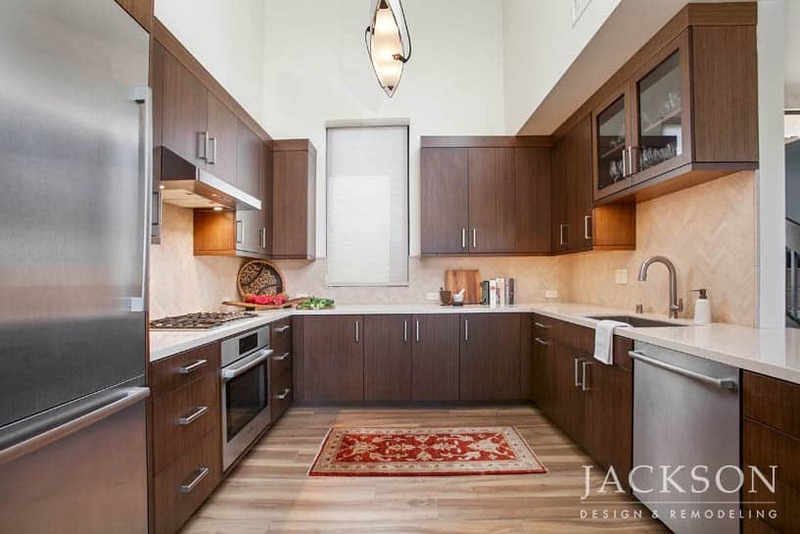 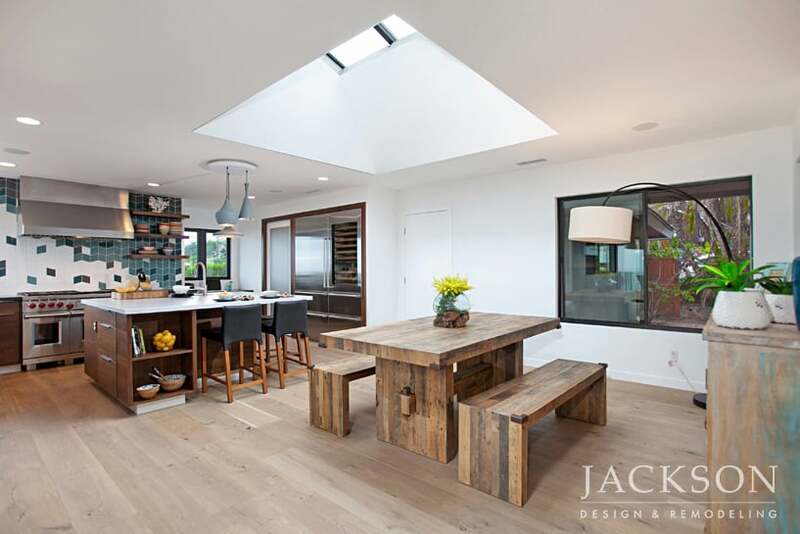 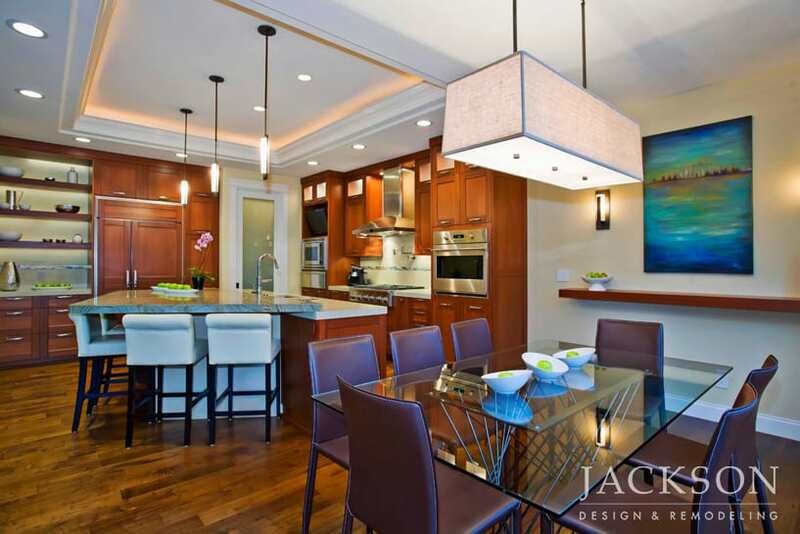 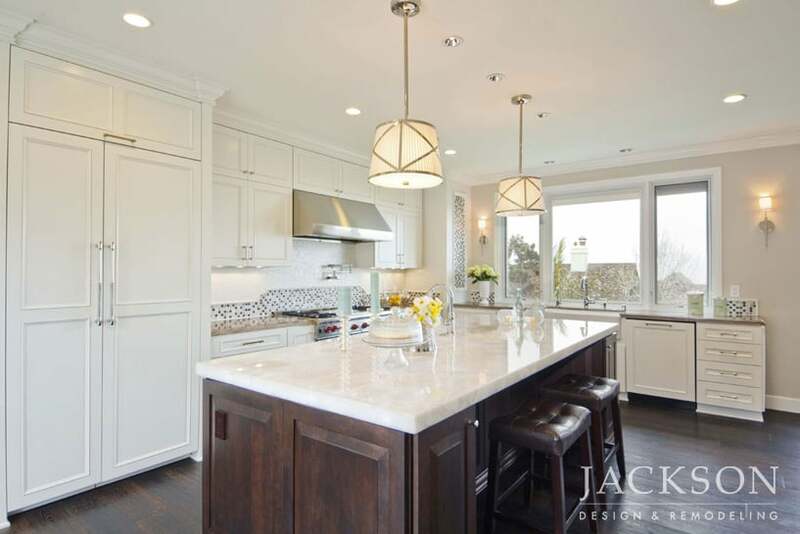 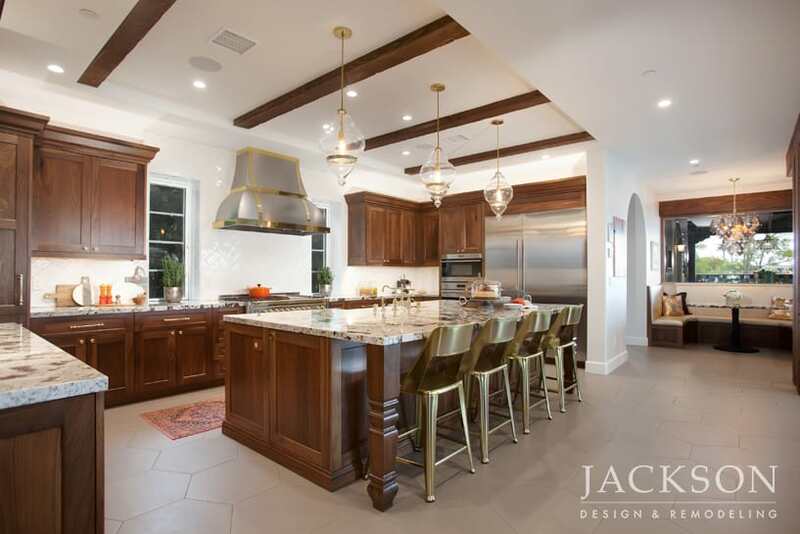 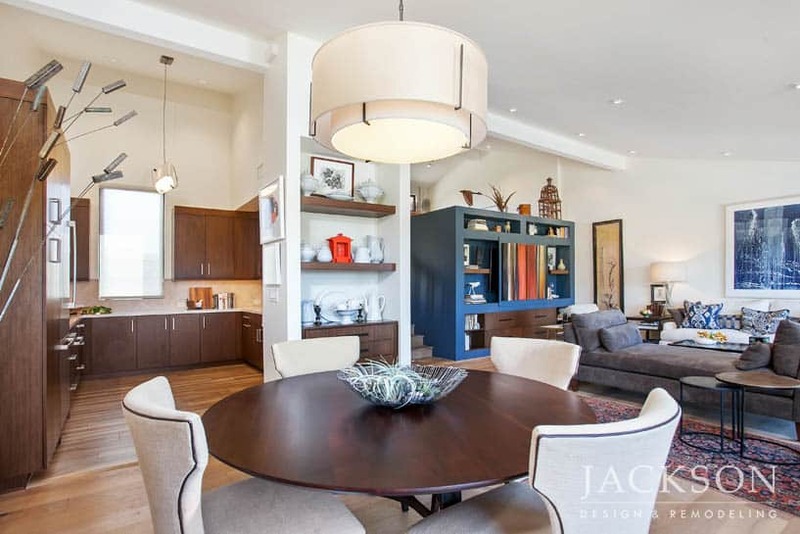 The kitchen, dining and living space are now encompassed in an expansive, airy design. 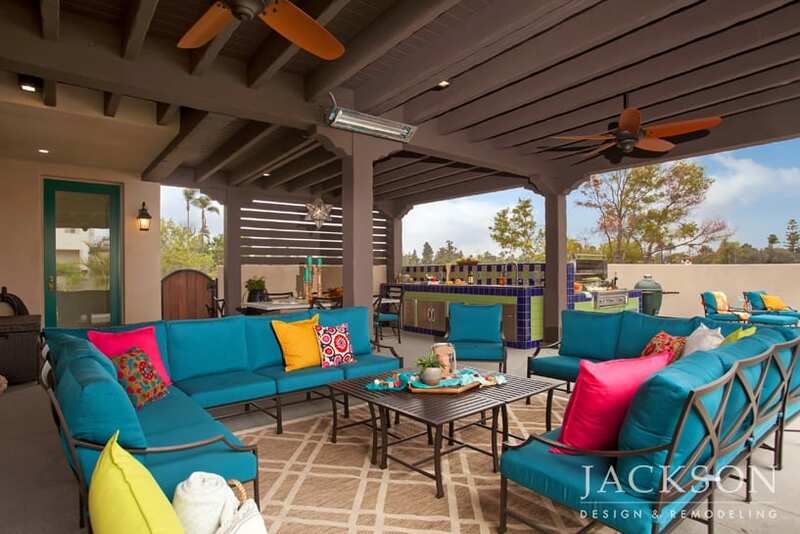 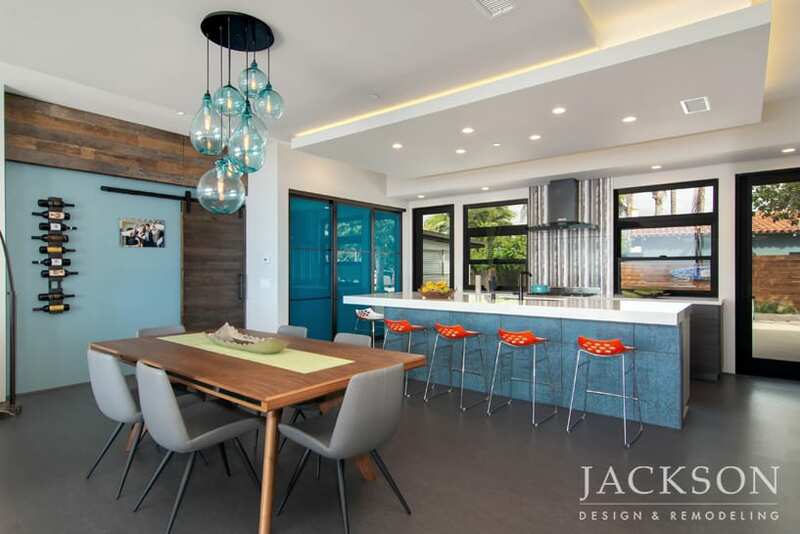 Inspired space planning, artistic details, and an energetic color palette make this a home for a family to appreciate for a lifetime. 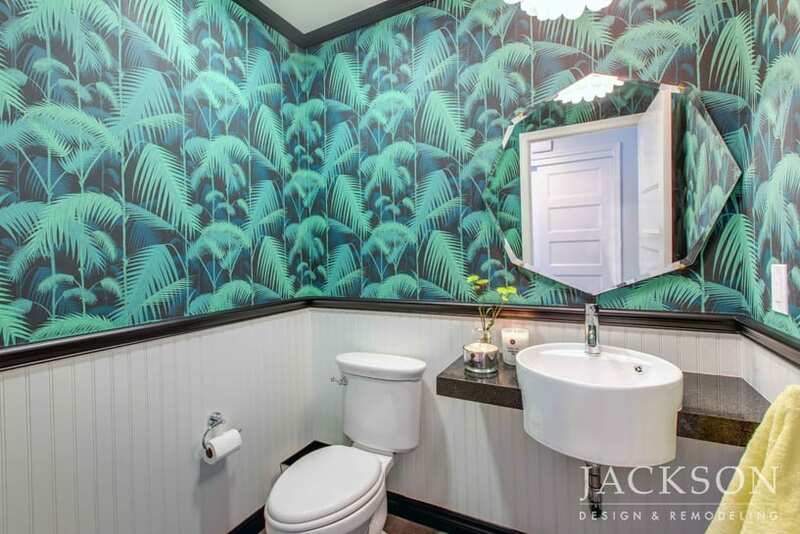 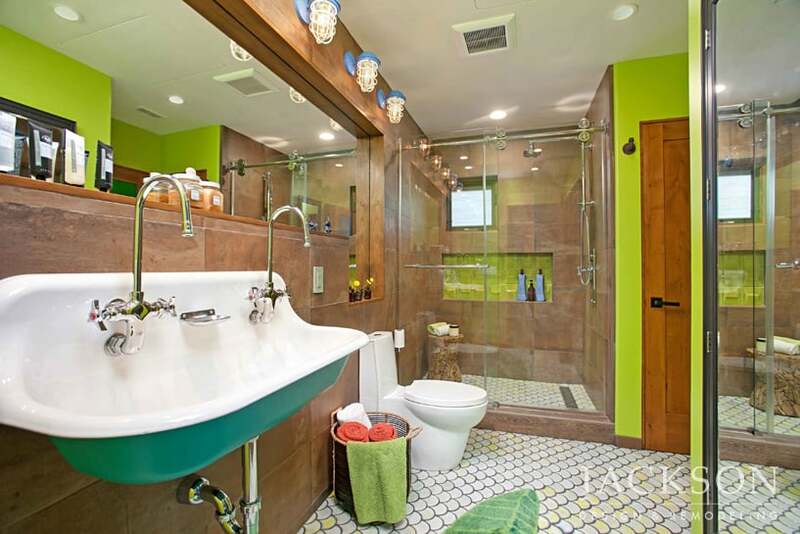 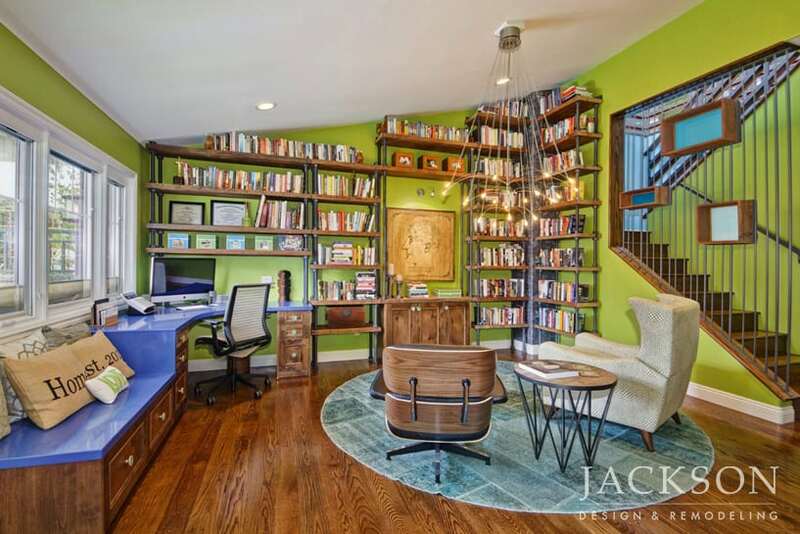 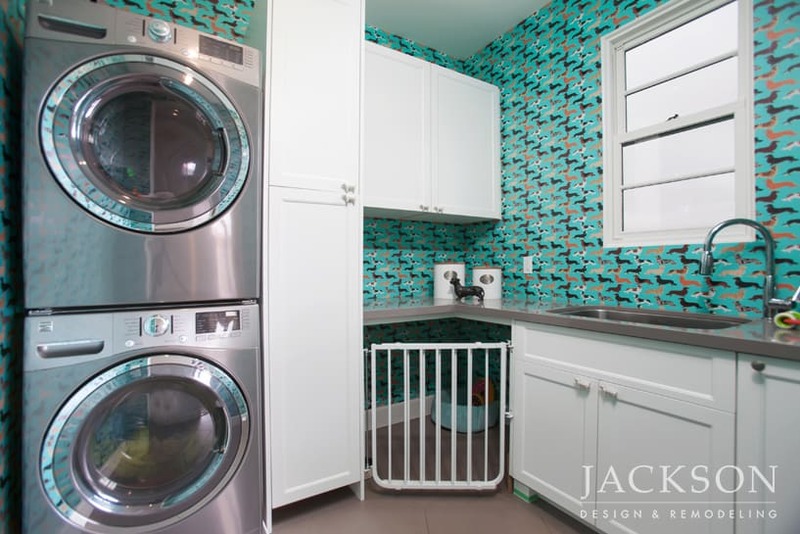 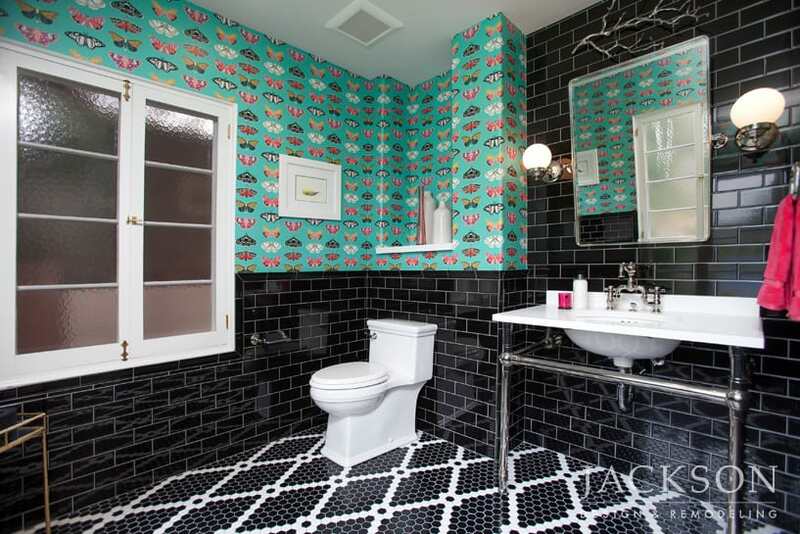 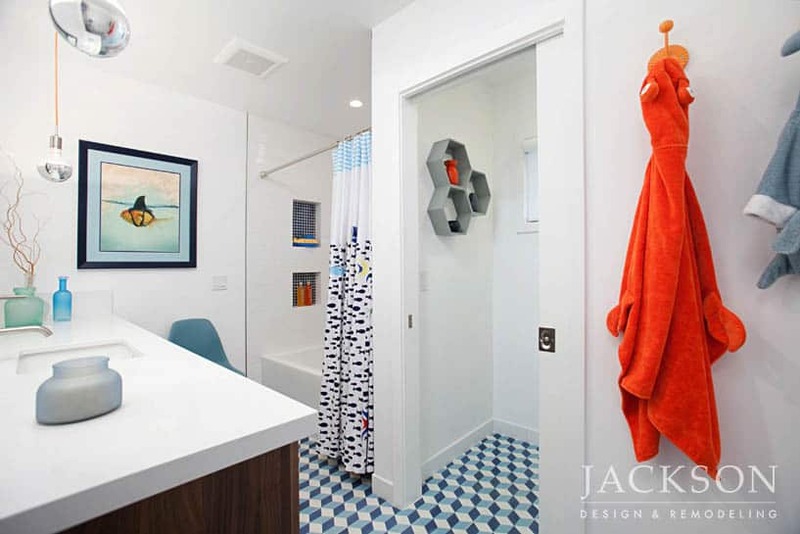 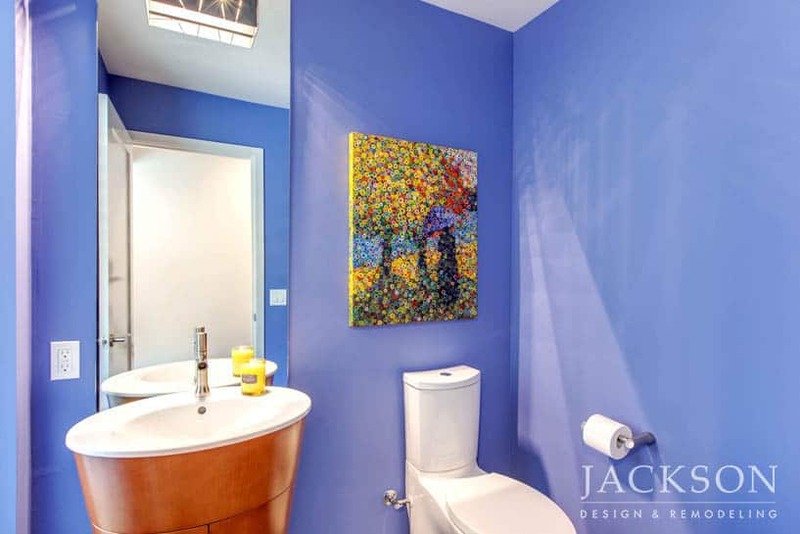 When this young couple bought their first home they envisioned a colorful, stimulating space. 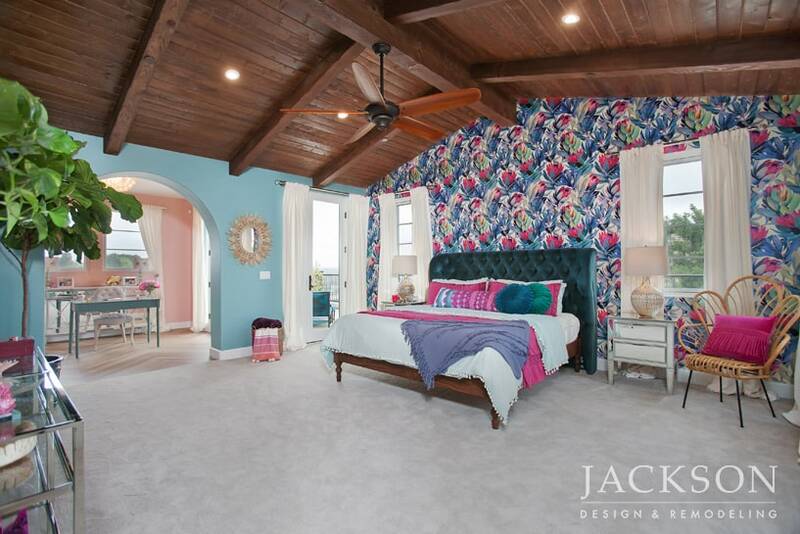 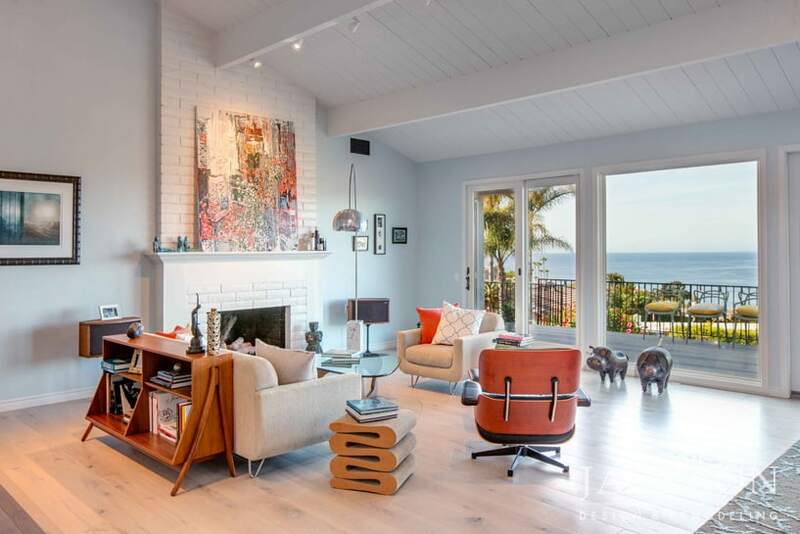 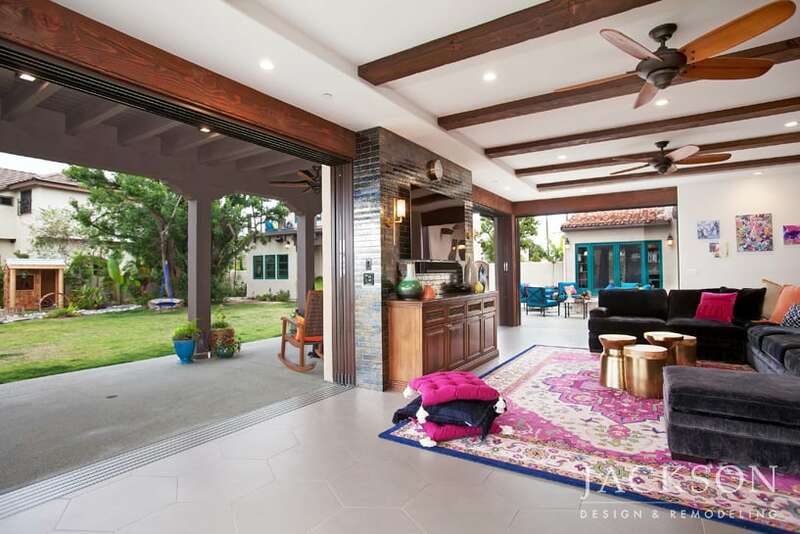 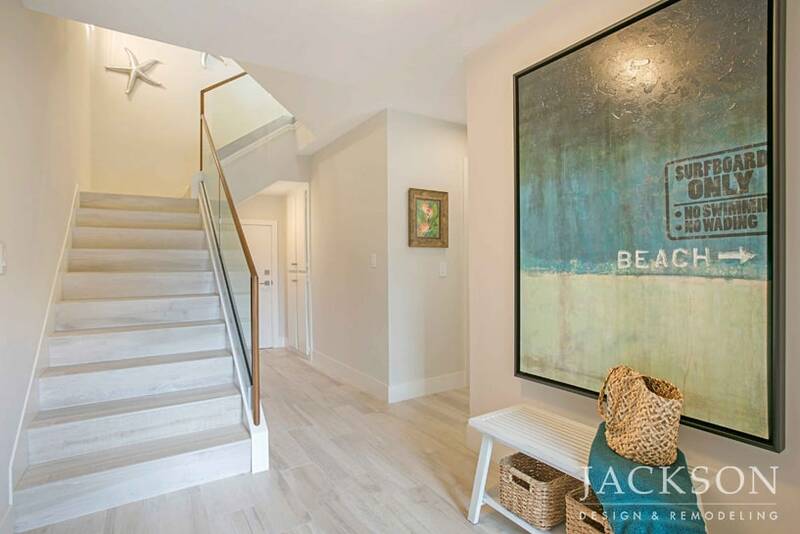 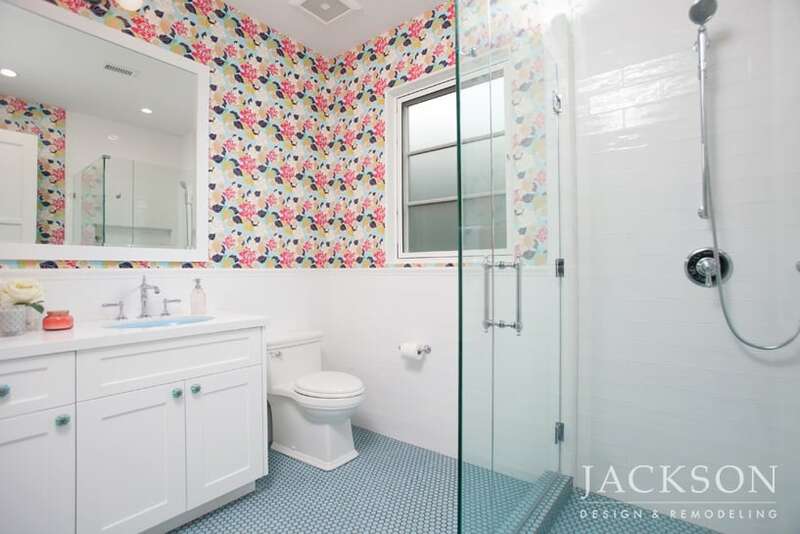 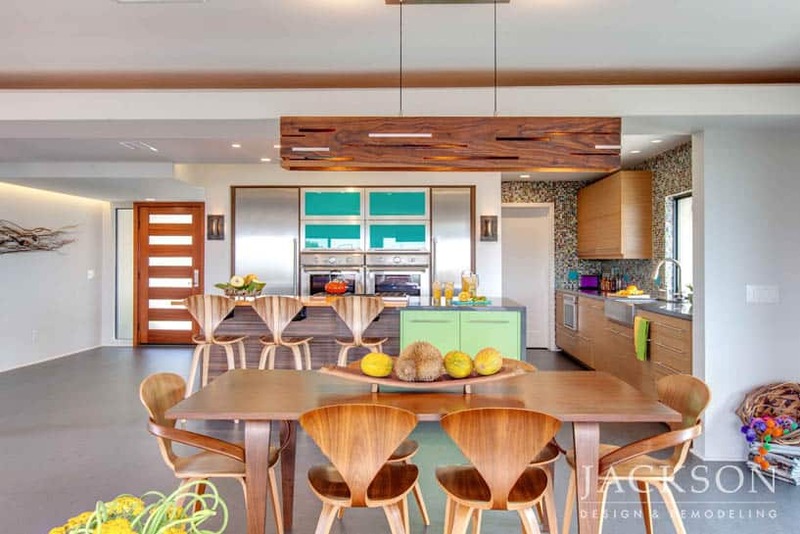 Beige was banished in favor of vivid color and a progressive vintage attitude in this beachside home. 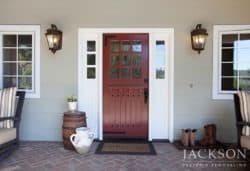 Starting with its welcoming Dutch front door in vivid red accented with a family heirloom barrel, the new style throughout this memorable Modern Farmhouse masterfully blends authentic rustic detail with the clean lines of modern design. 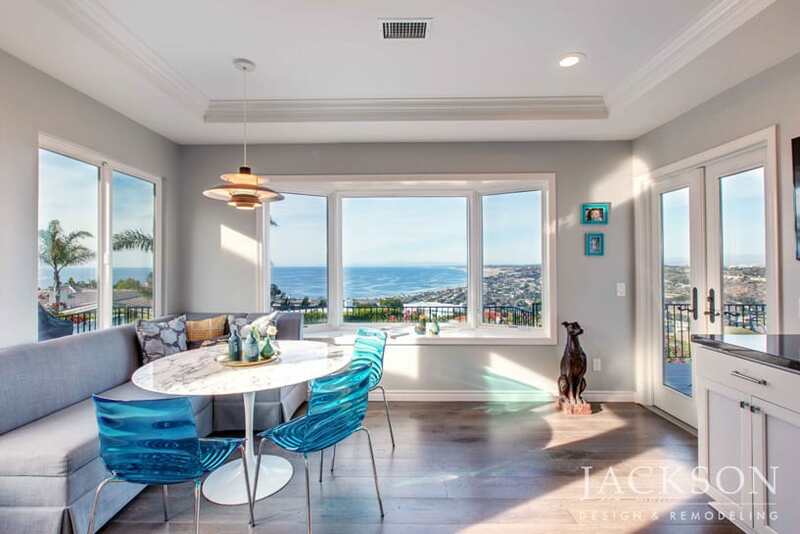 Combining sophisticated elements of contemporary and classic design, this stunning seaside home boasts a gorgeous coastline view. 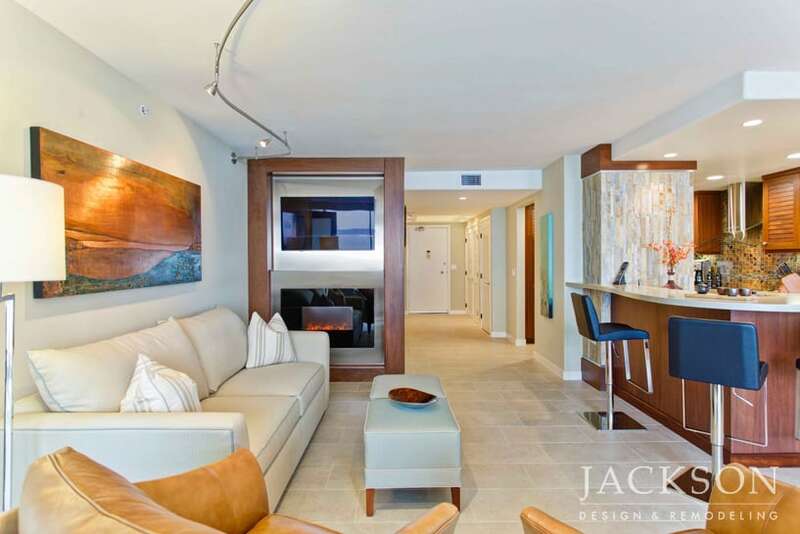 Subtle colors and clean lines give the vista center stage. 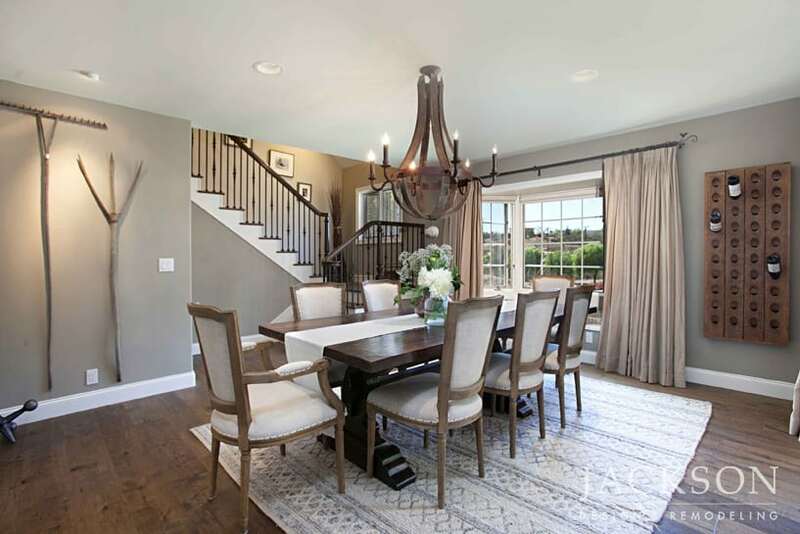 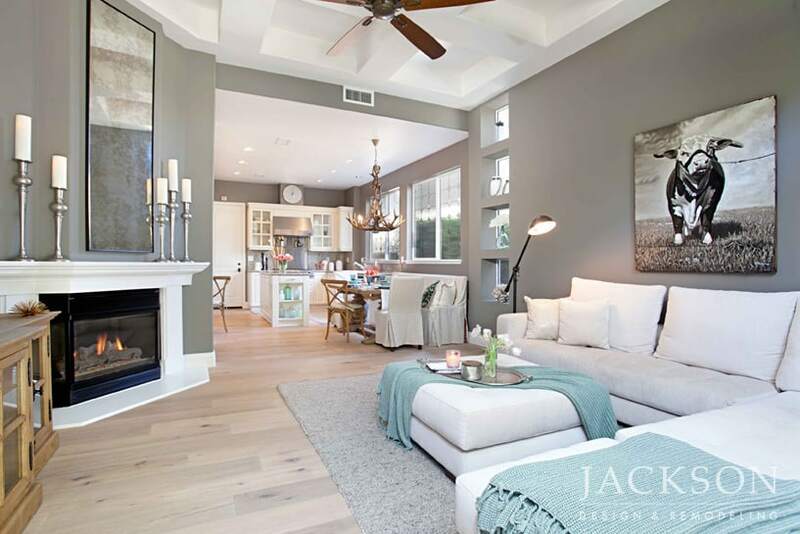 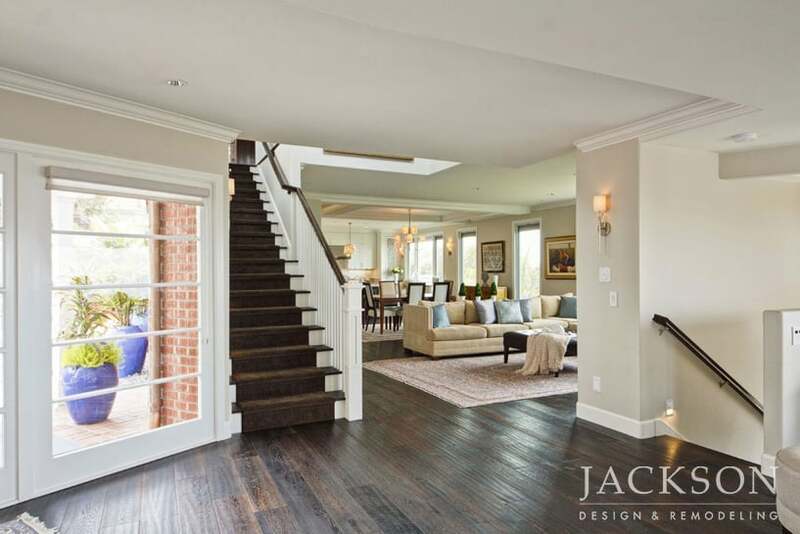 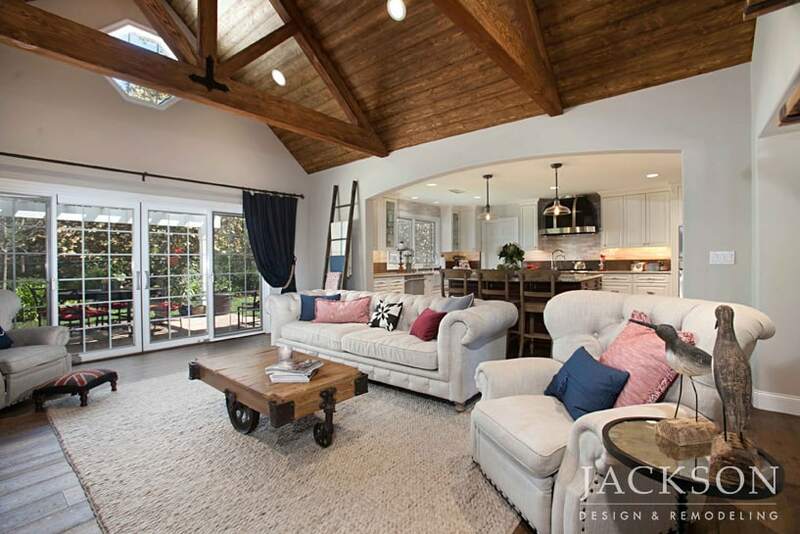 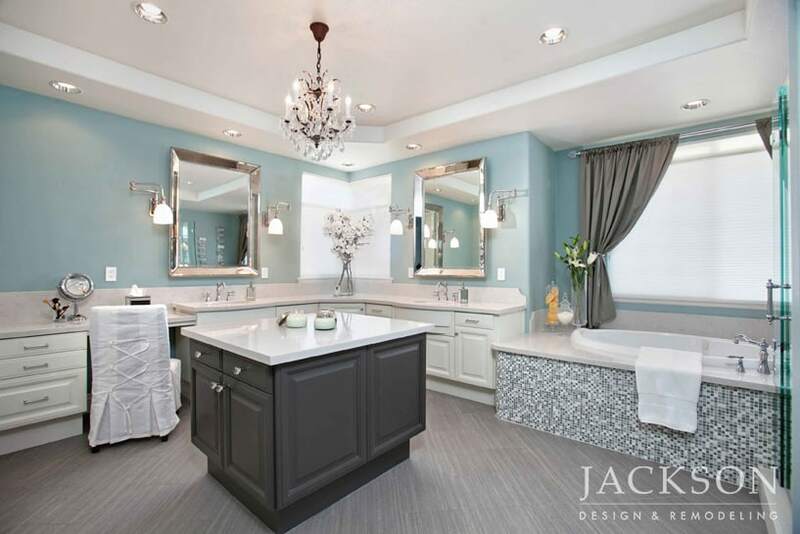 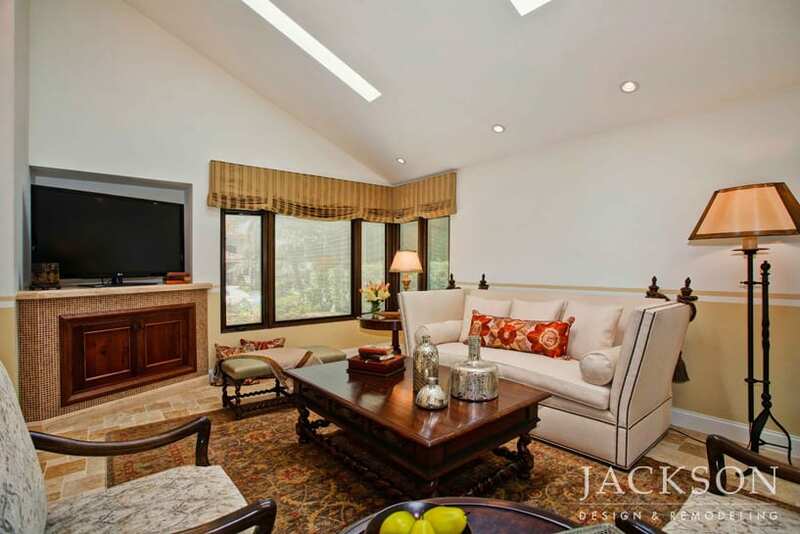 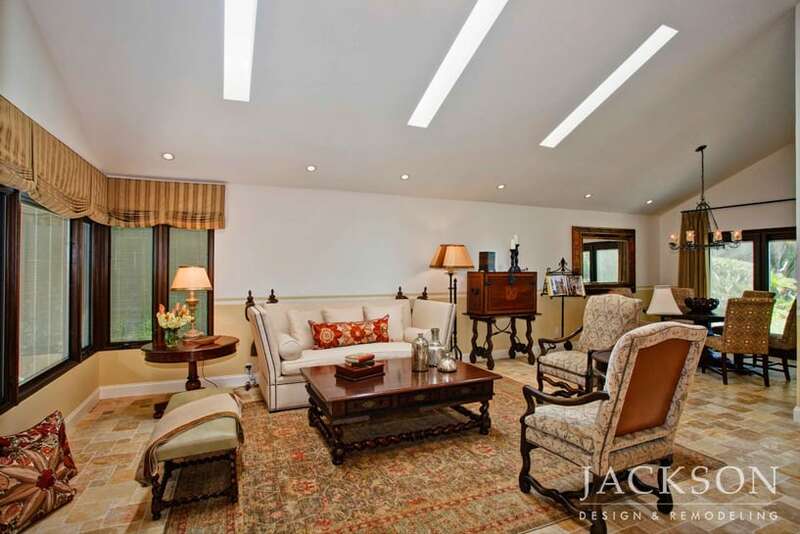 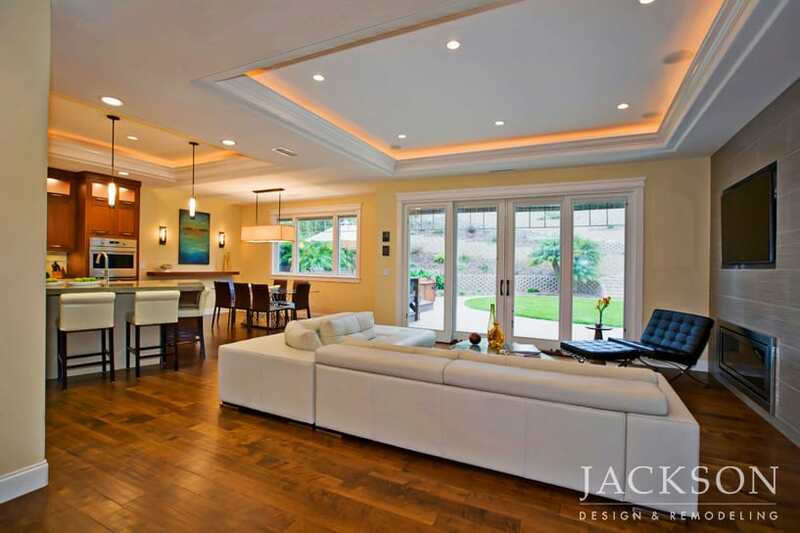 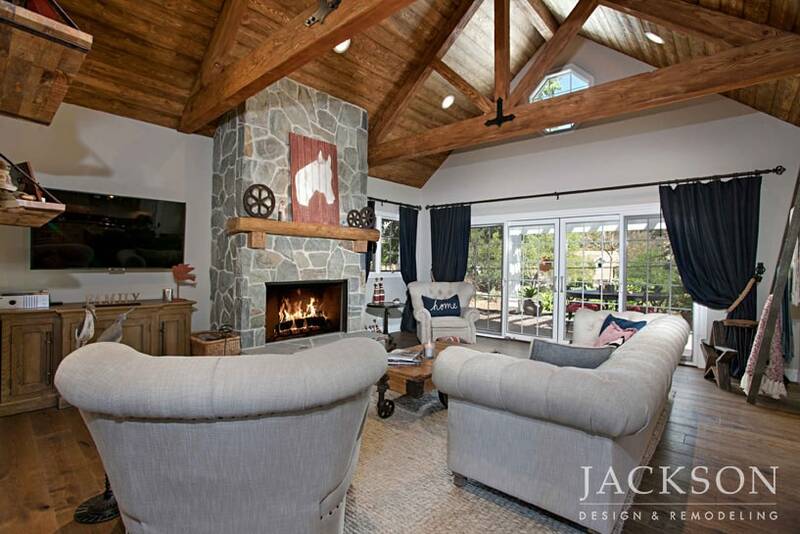 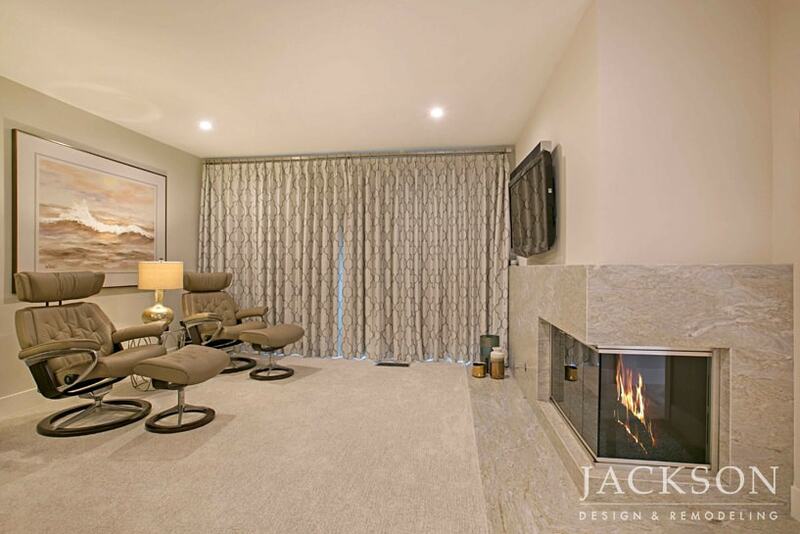 Thoughtful design offers comfort for a young family and elegance for entertaining in style. 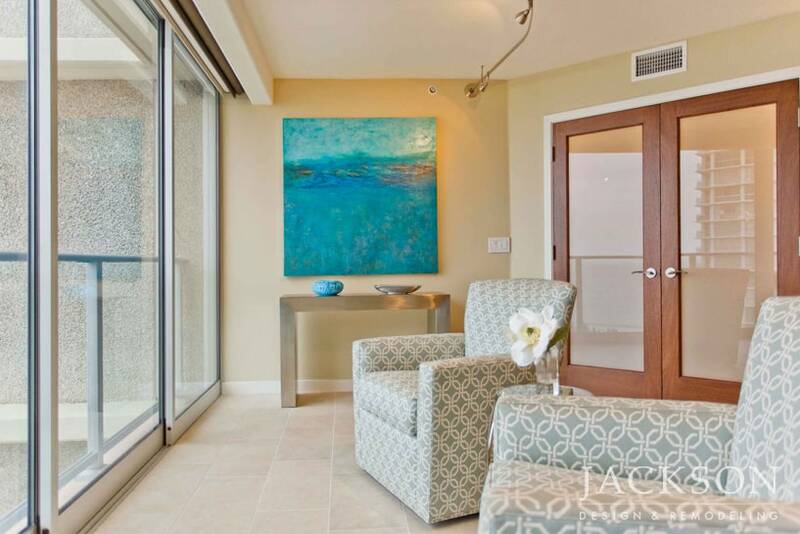 Empty nesters who relocated from the East Coast to the West Coast to be closer to their two children, the owners of this condo wanted to live in a space reflective of their creative lifestyles. 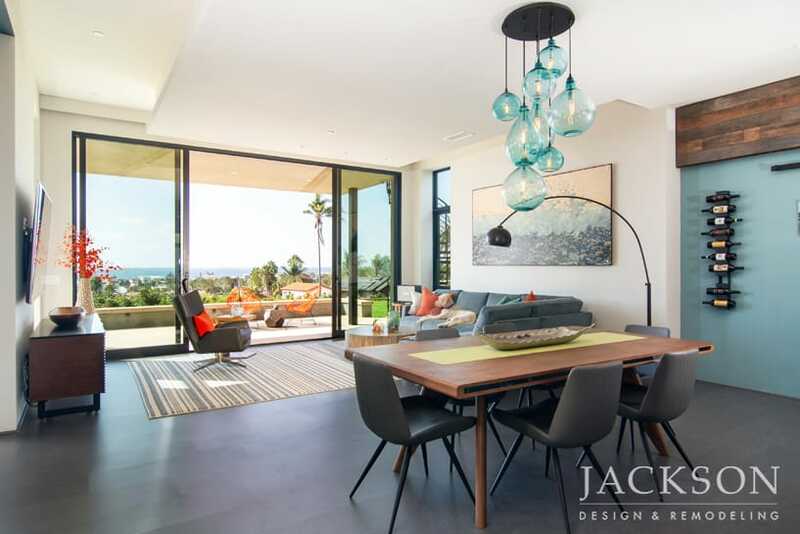 The design now allows the couples treasured art collection to shine and brings New York to San Diego with an imaginative approach. 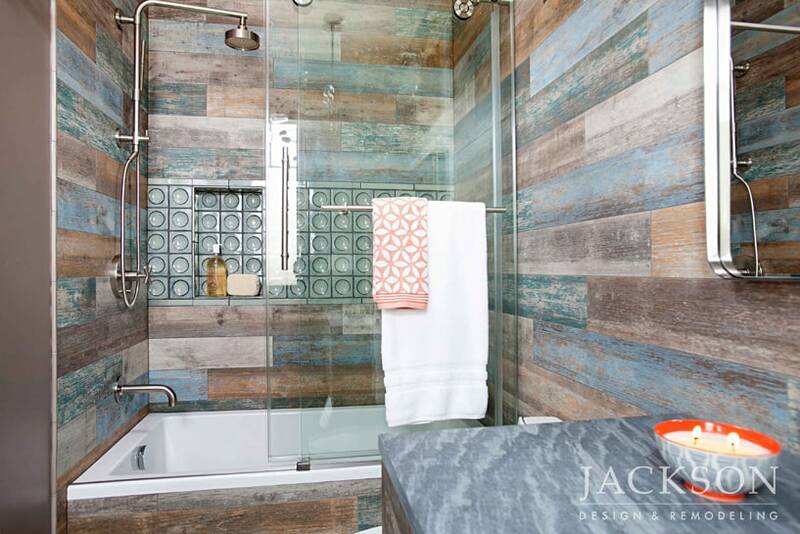 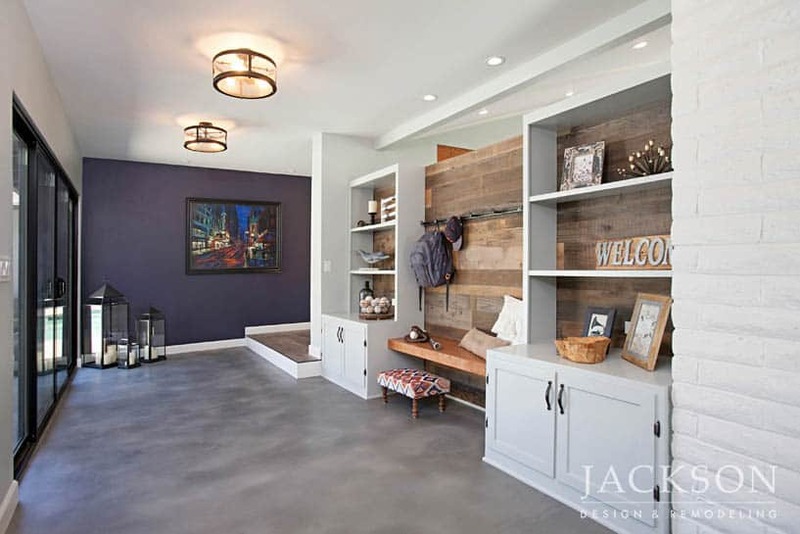 Color, texture, and materials are combined throughout this charming home in a creative blend of rustic and polished concepts. 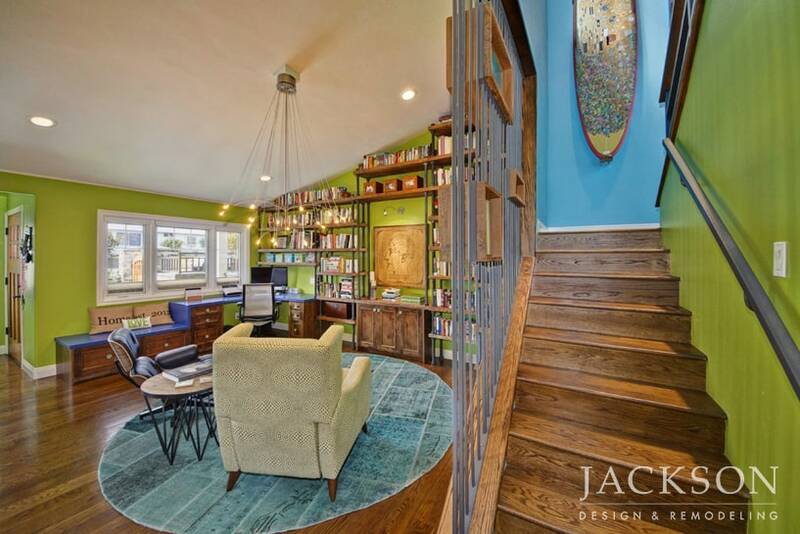 An artistic world traveler wanted to dramatically evolve his ordinary tract home without any structural changes. 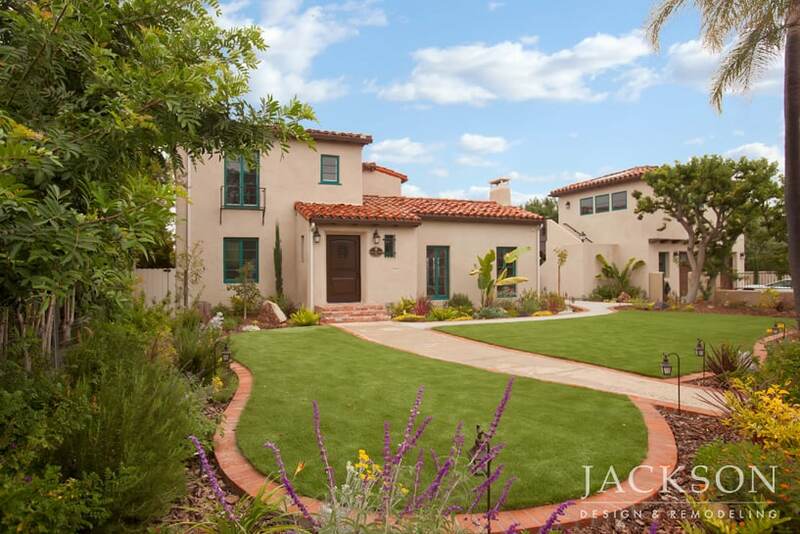 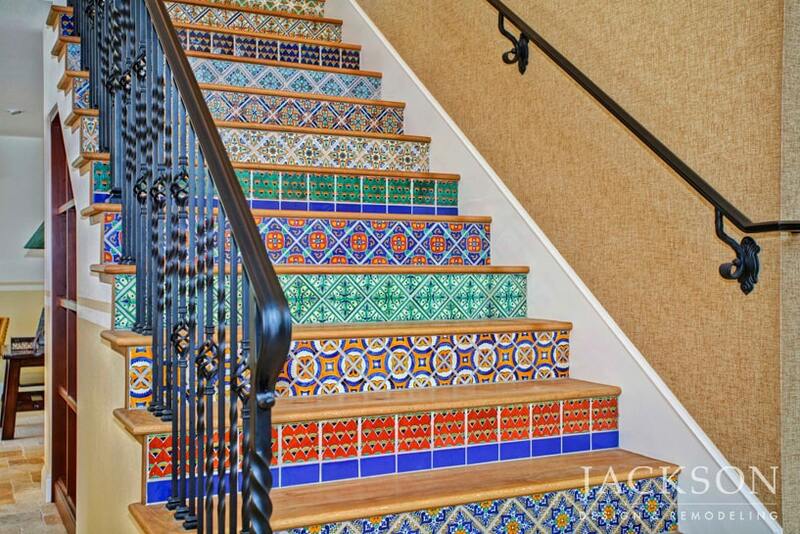 This award-winning home is now rich in character with an Old World Spanish-influenced aesthetic. 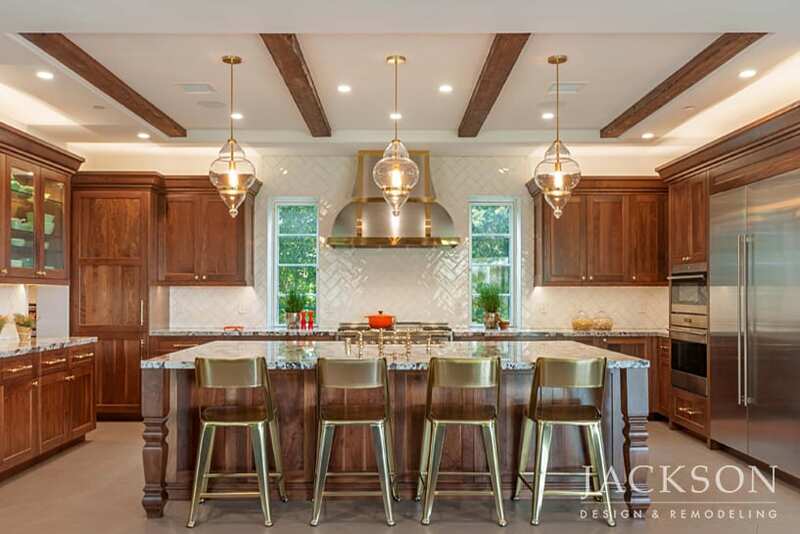 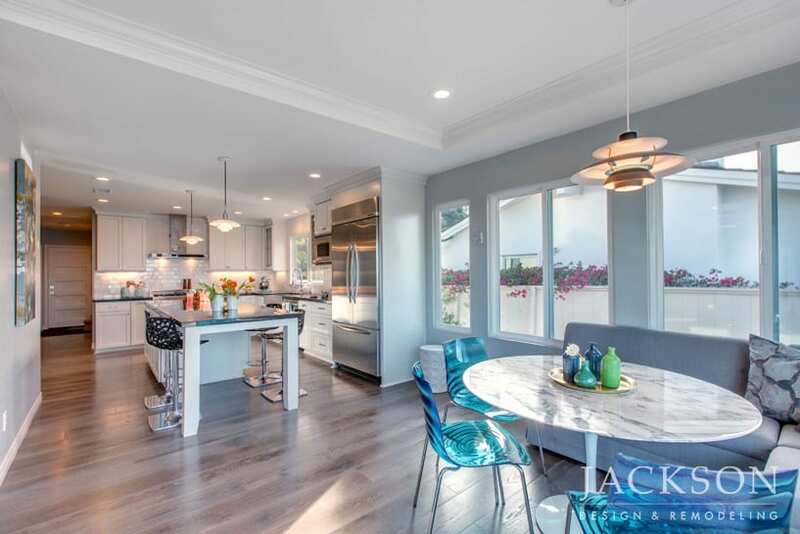 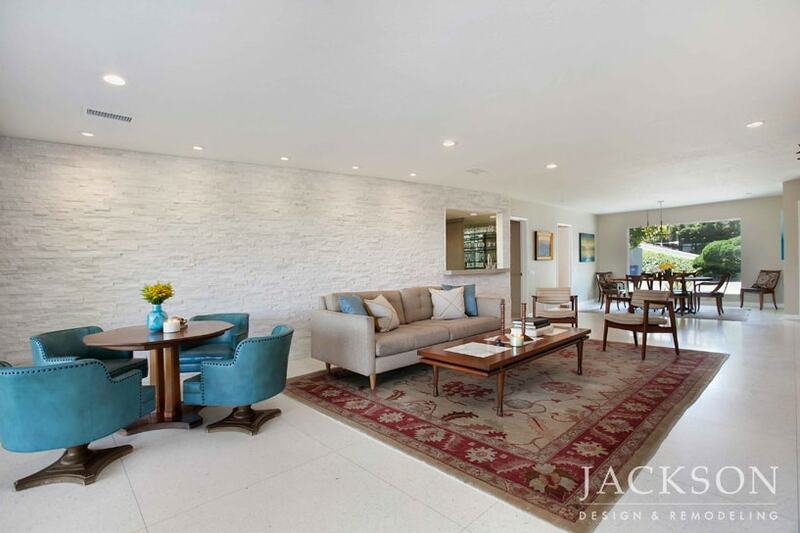 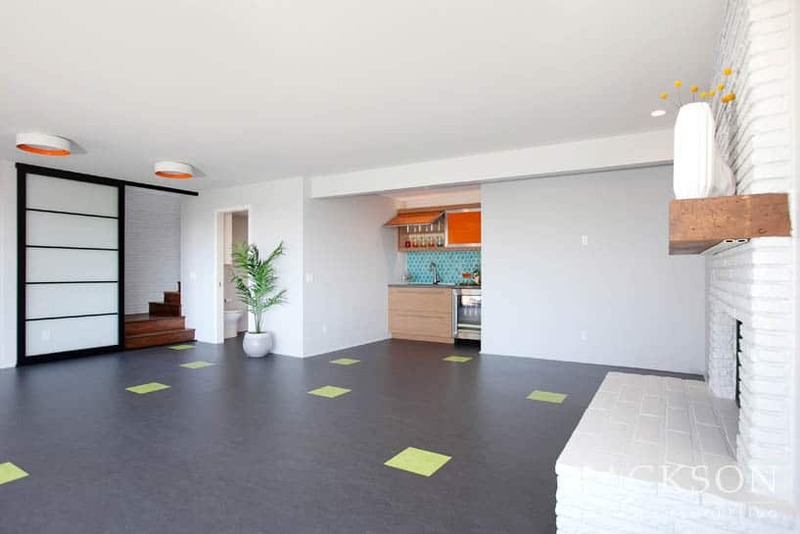 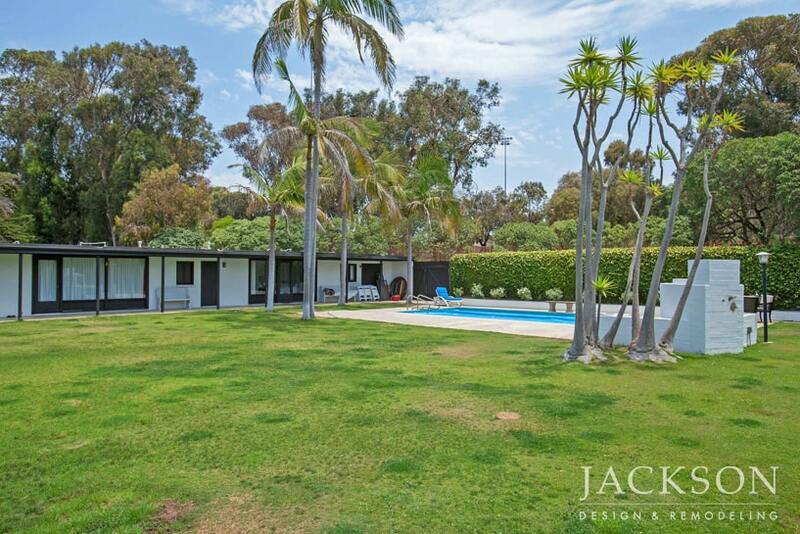 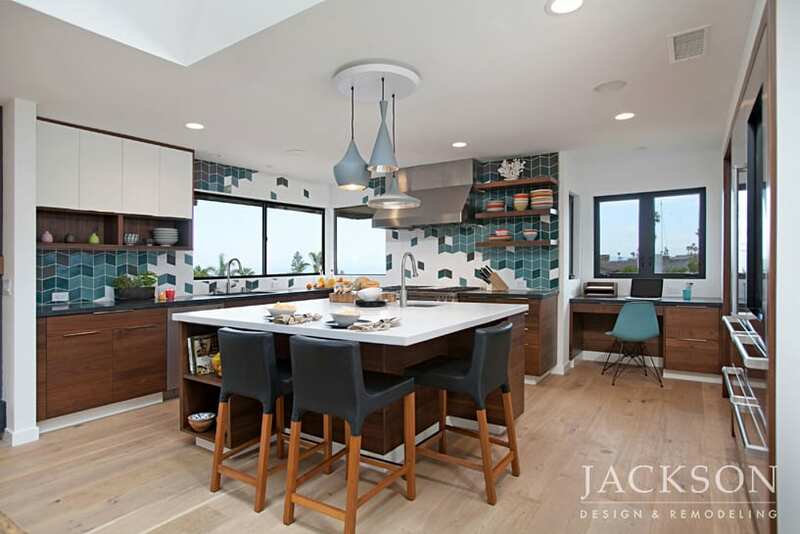 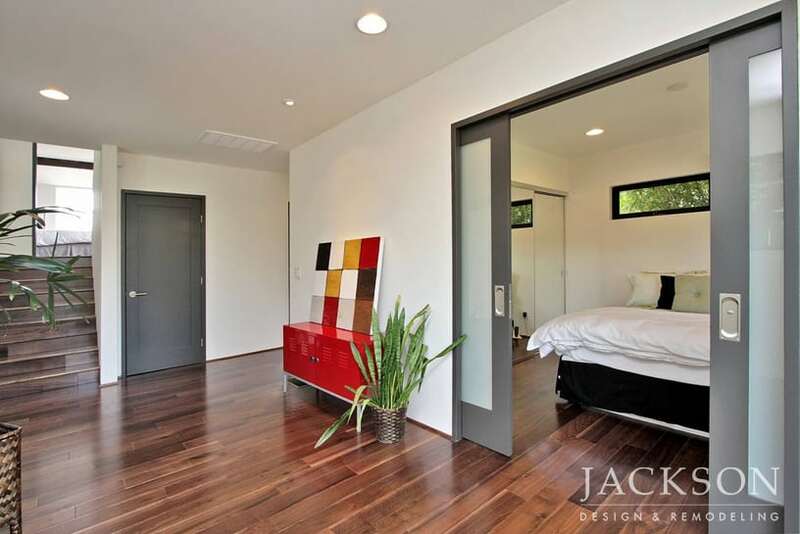 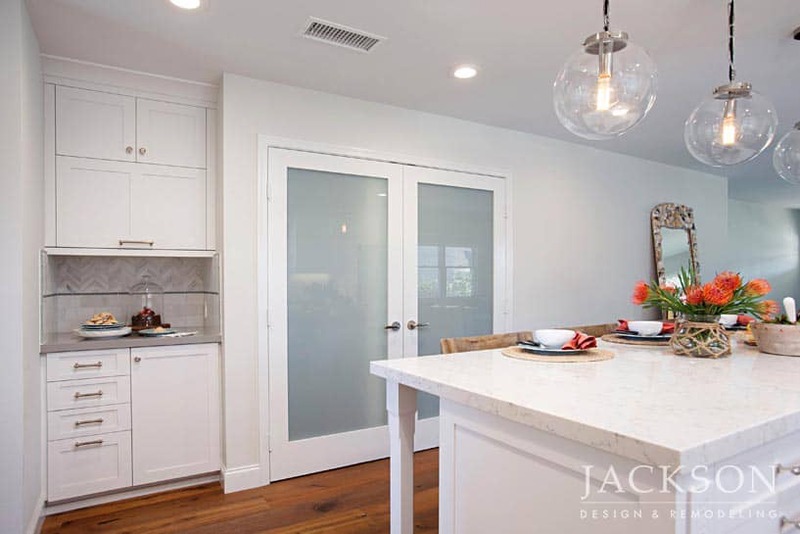 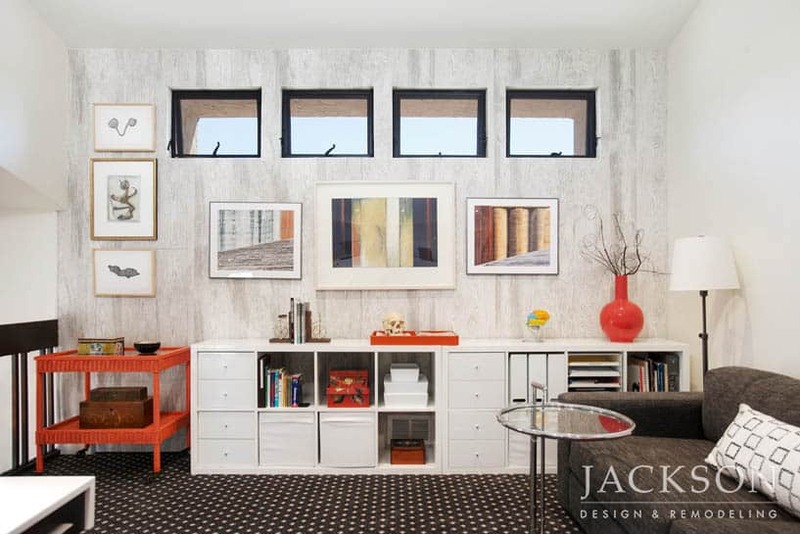 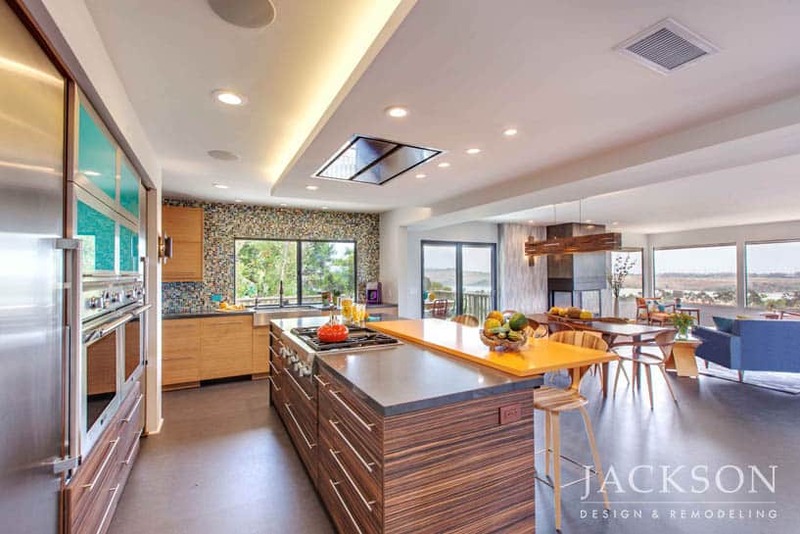 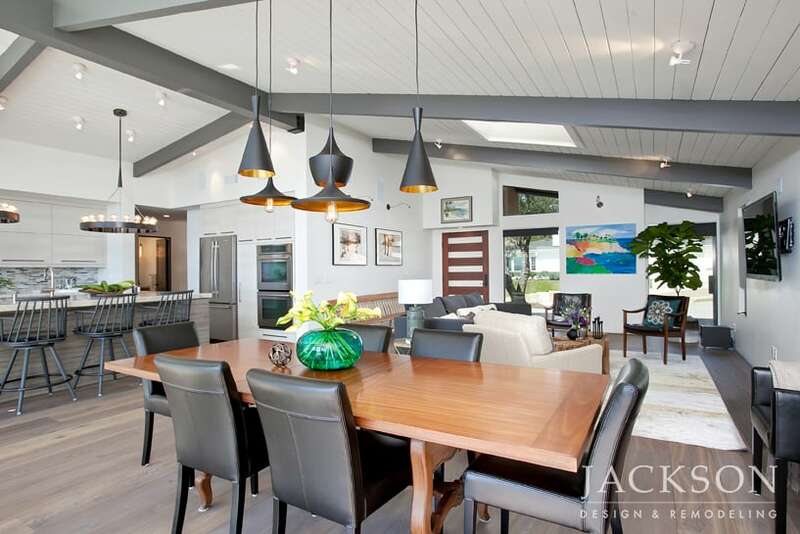 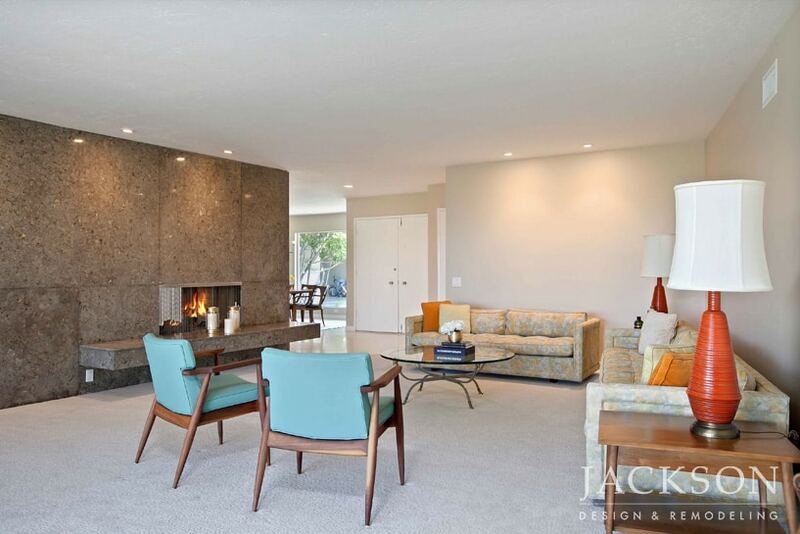 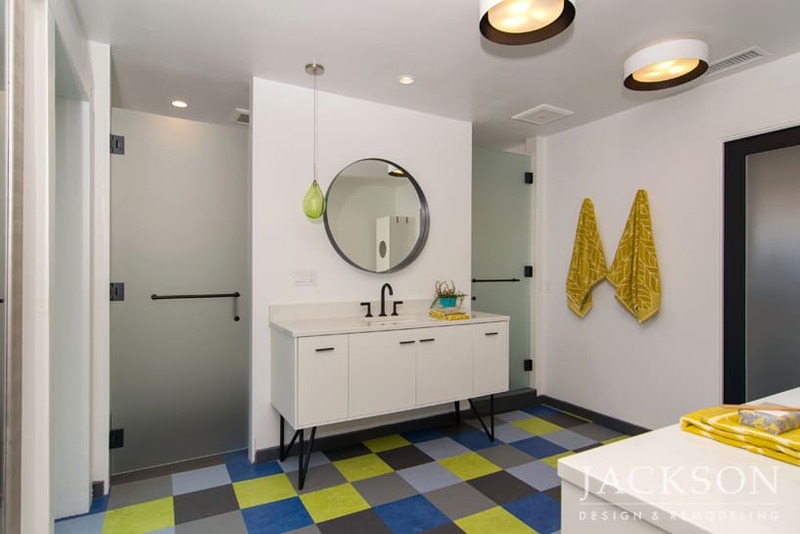 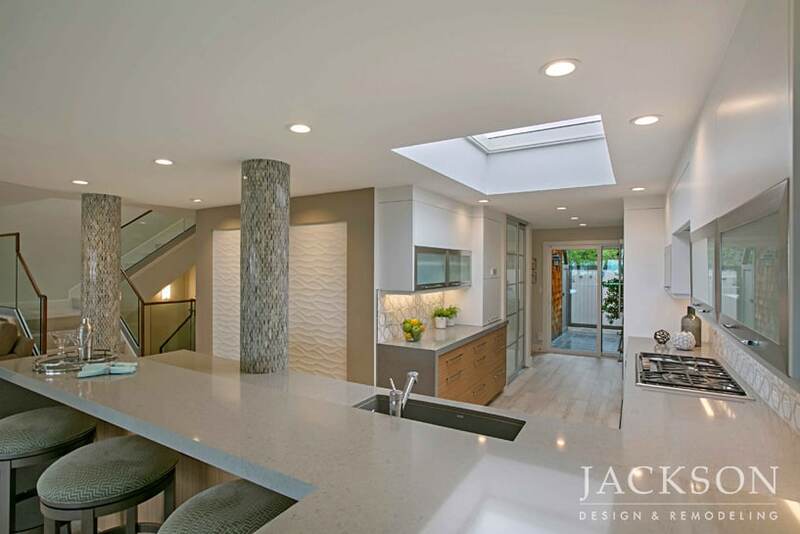 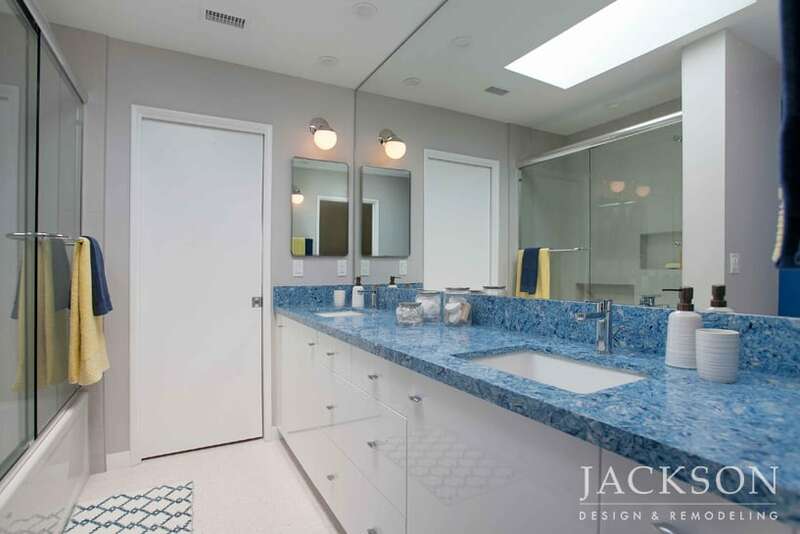 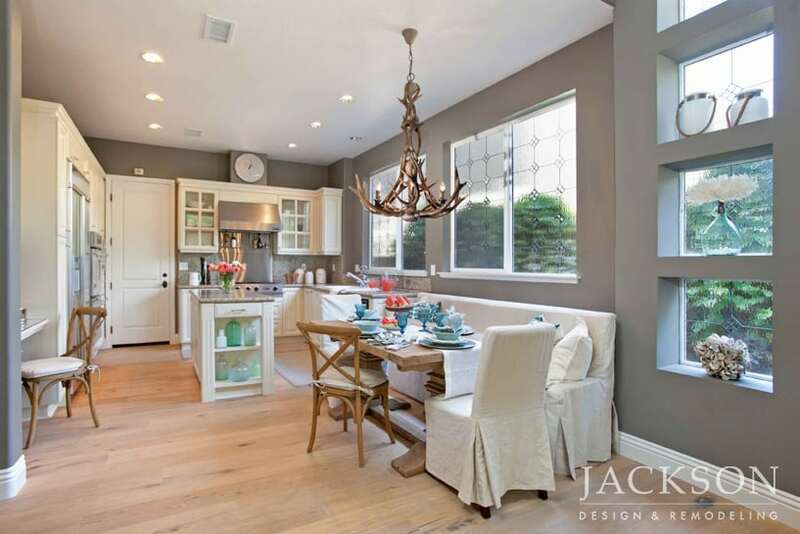 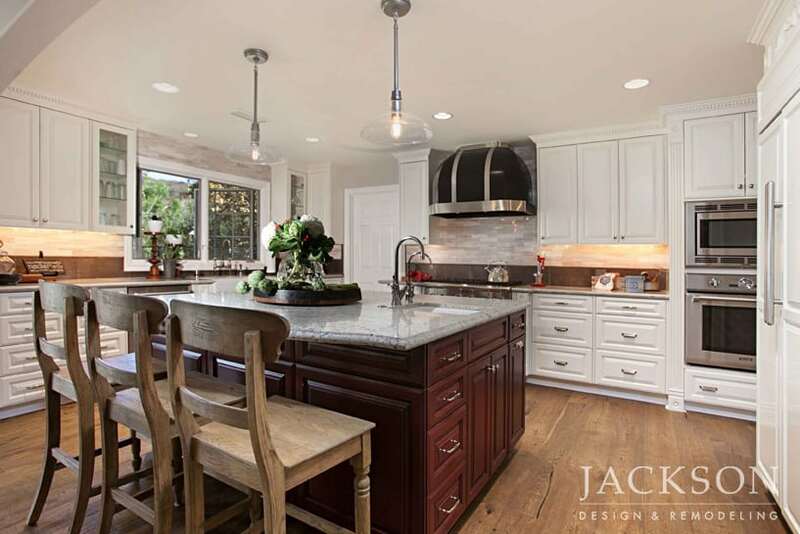 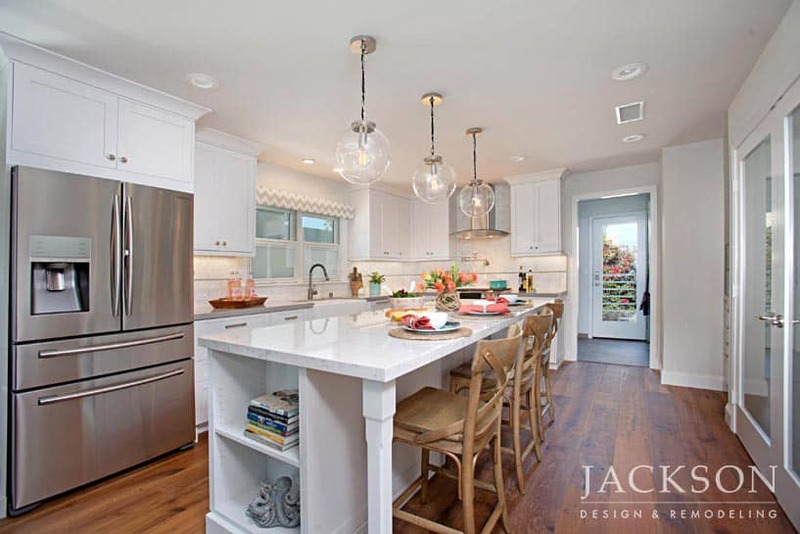 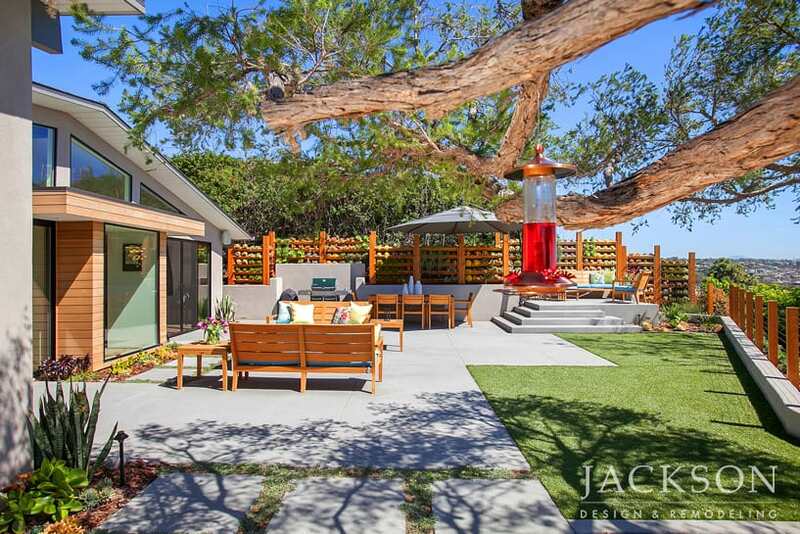 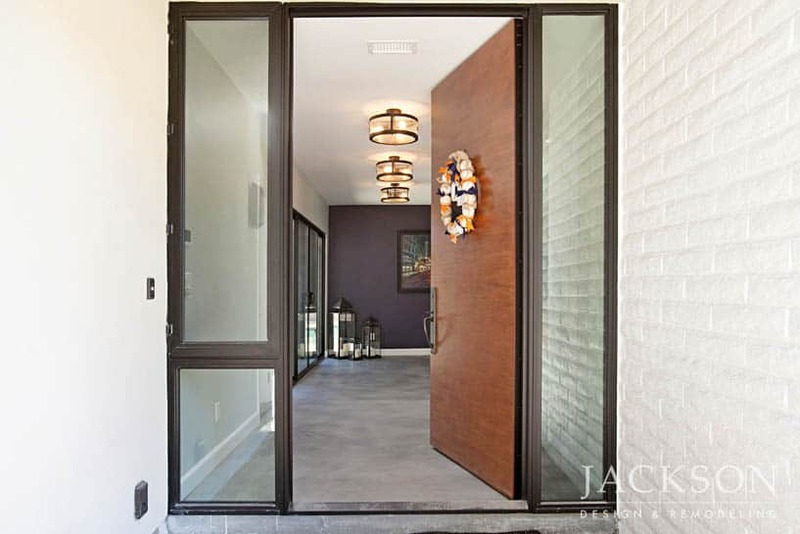 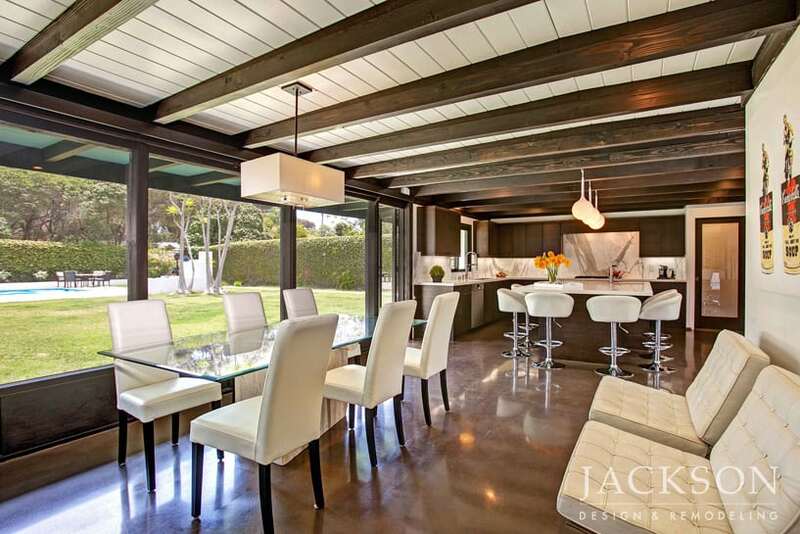 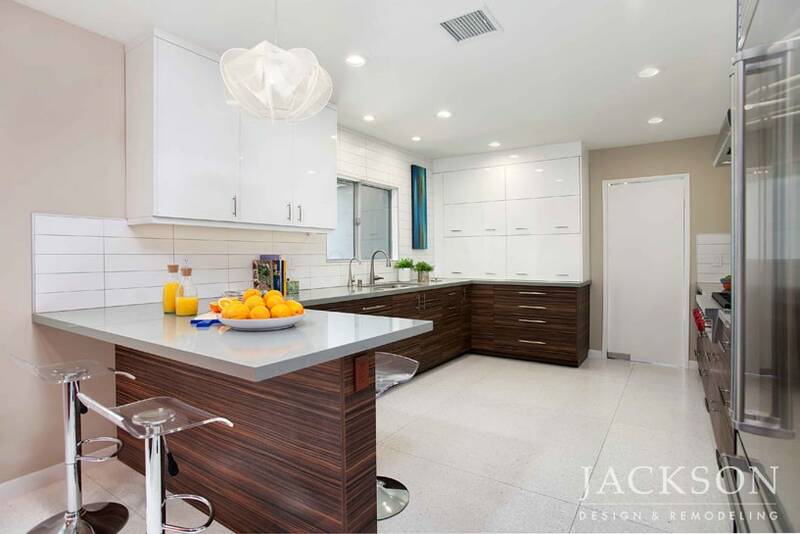 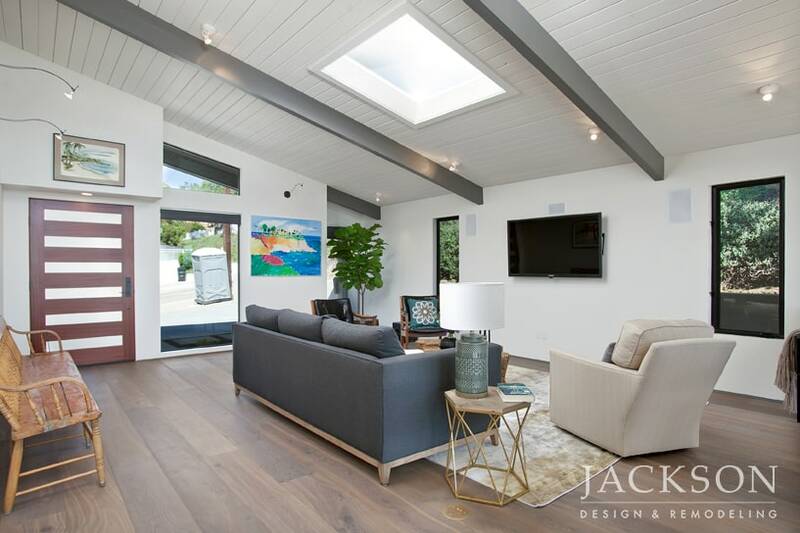 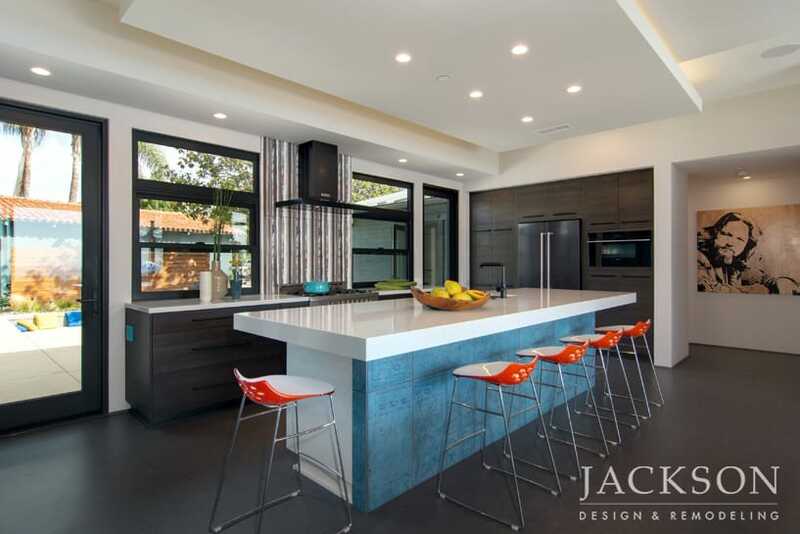 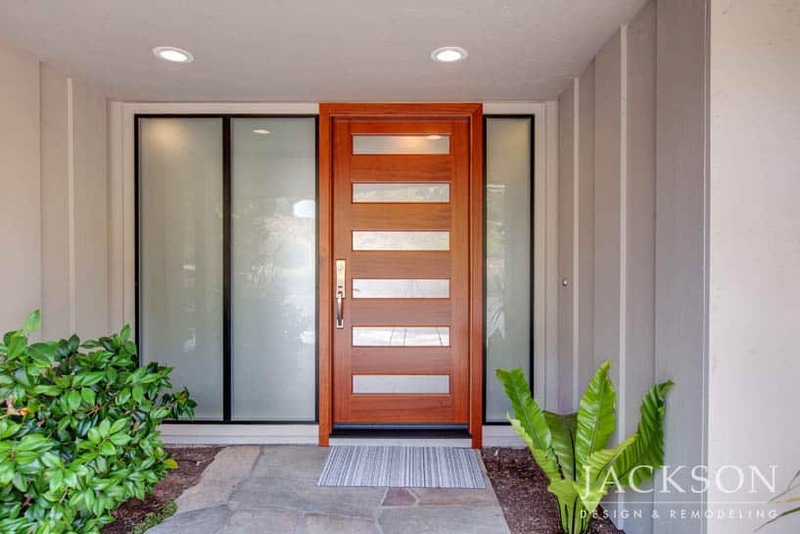 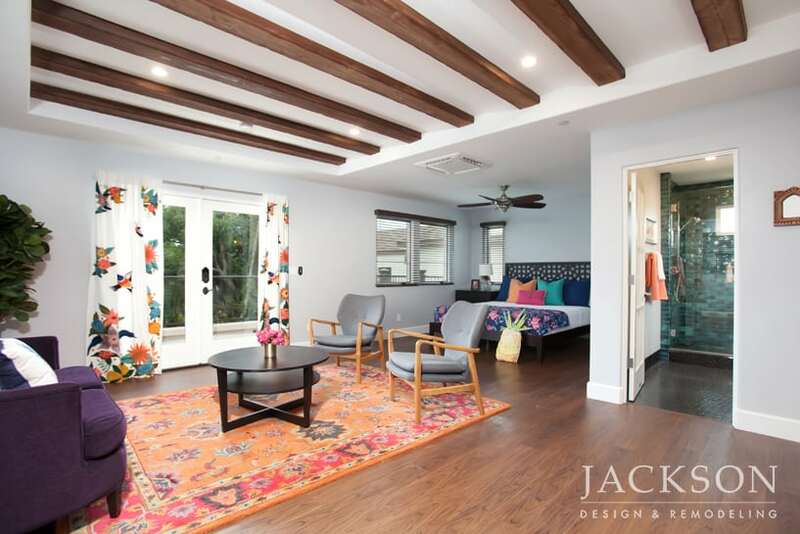 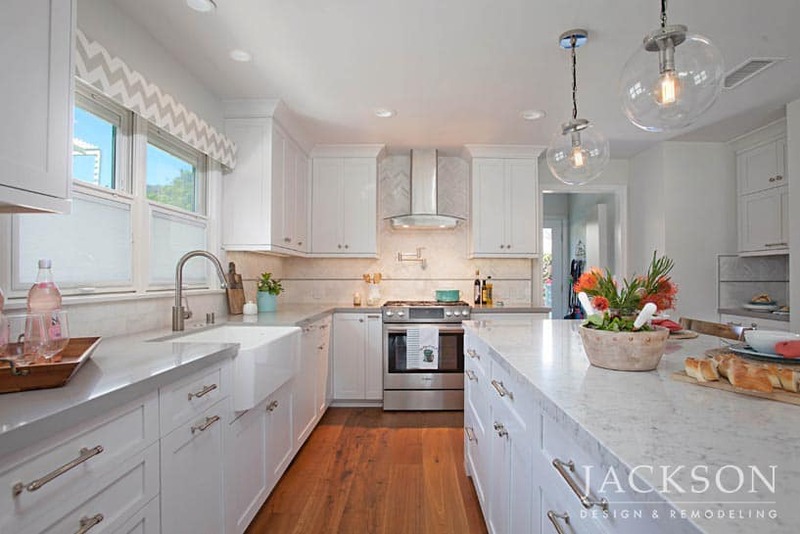 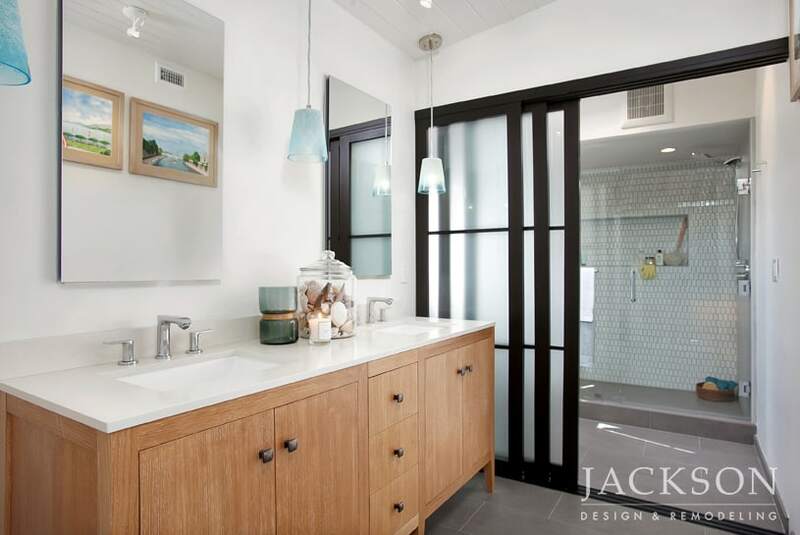 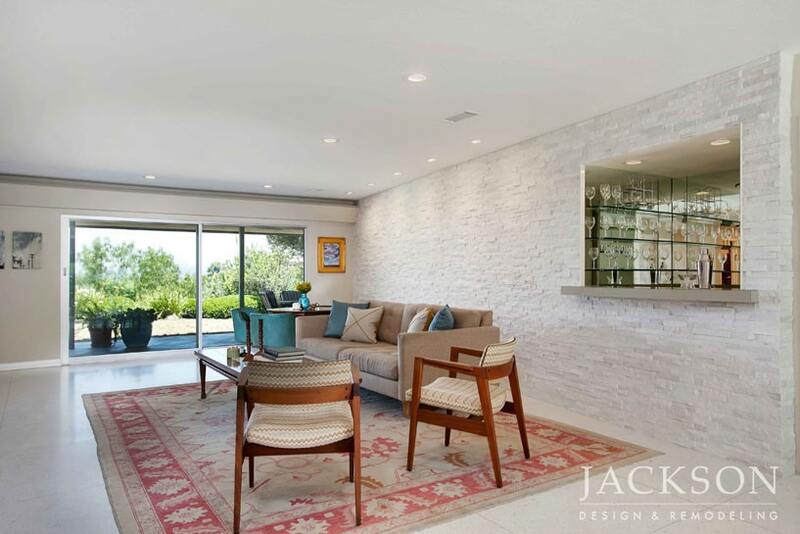 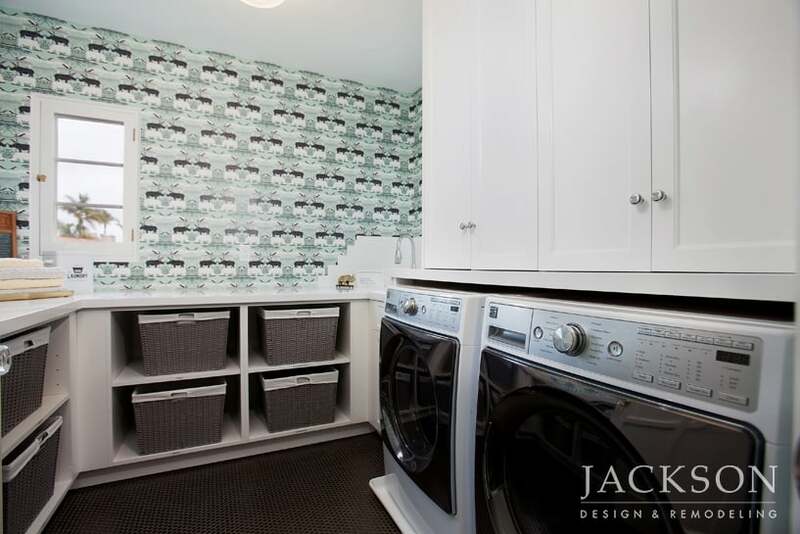 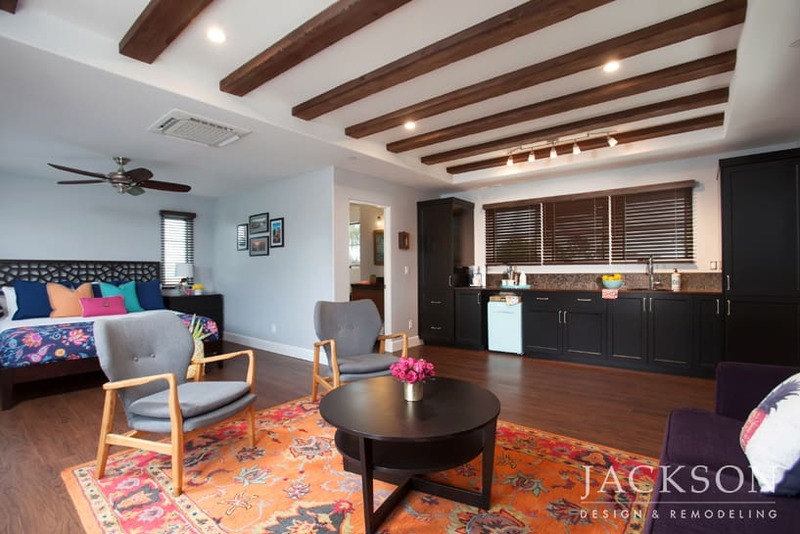 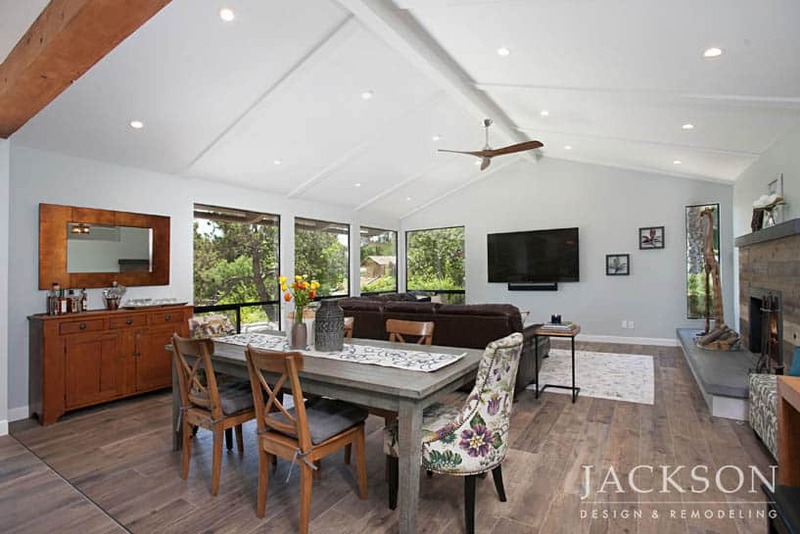 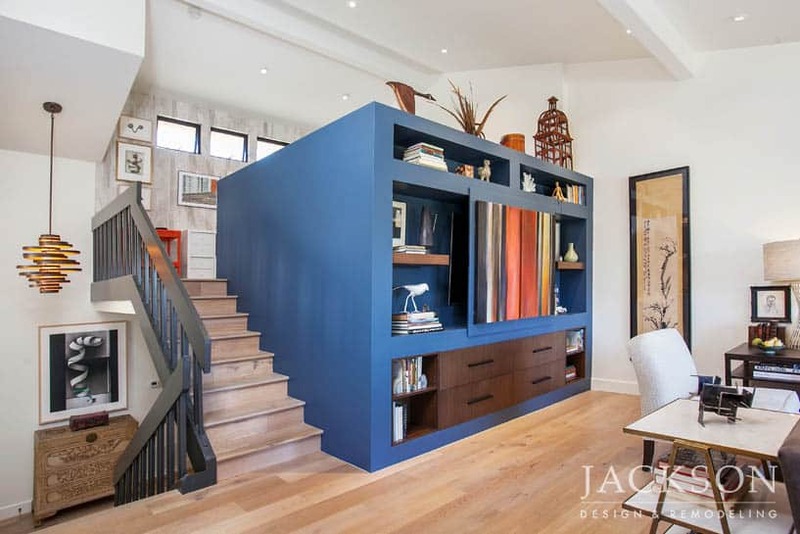 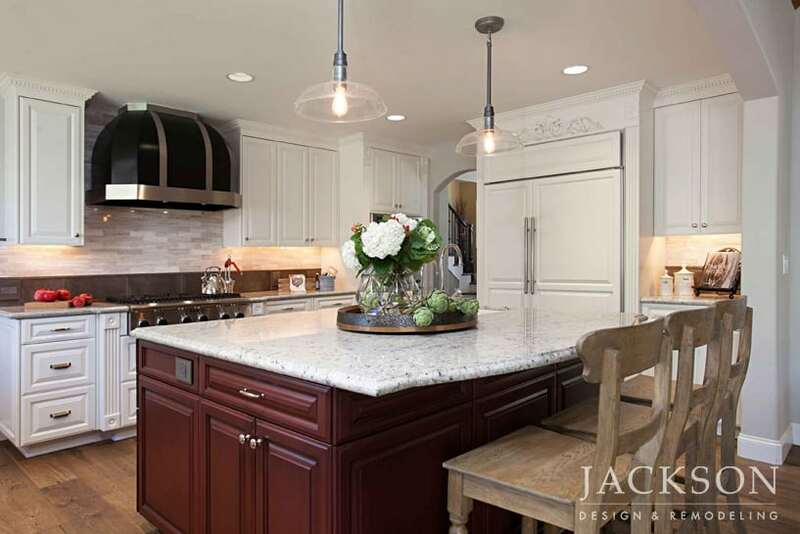 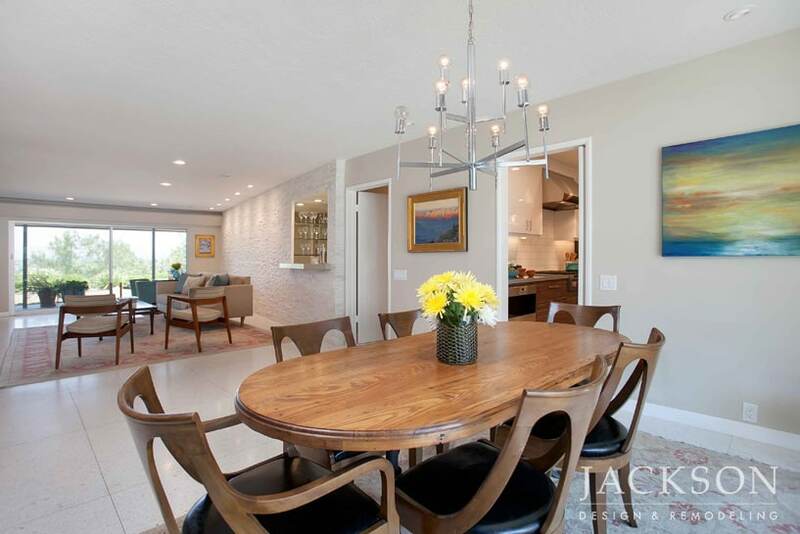 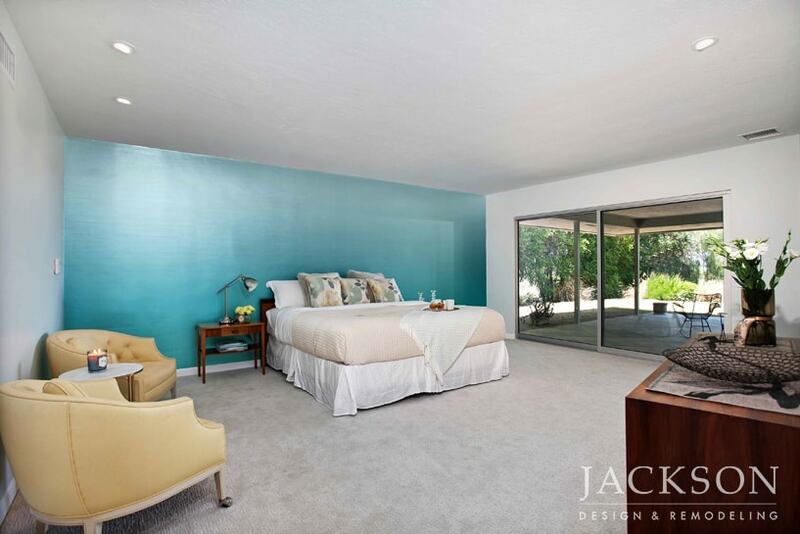 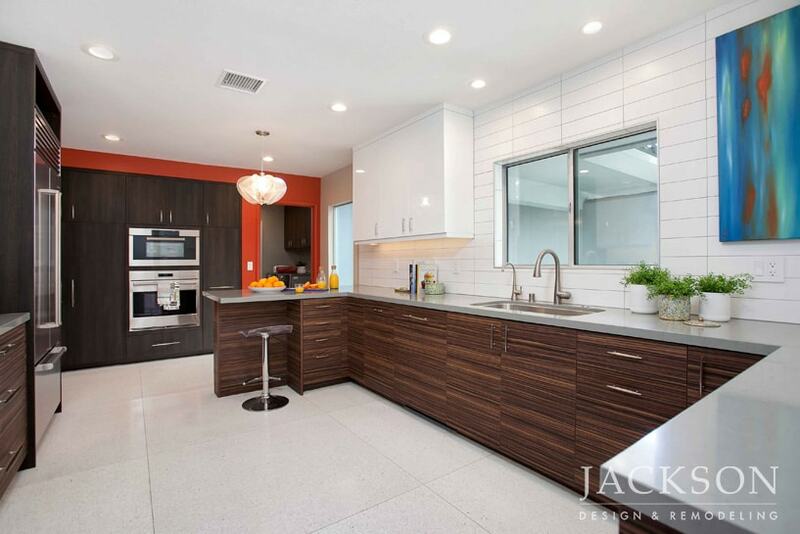 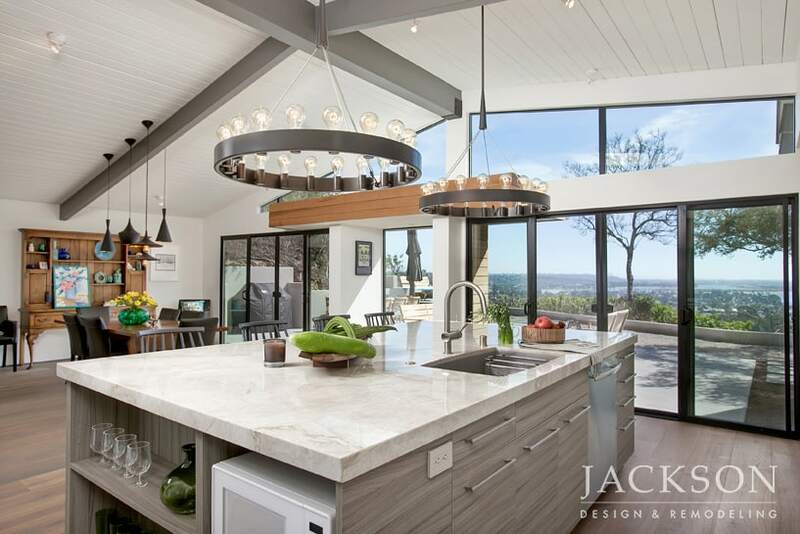 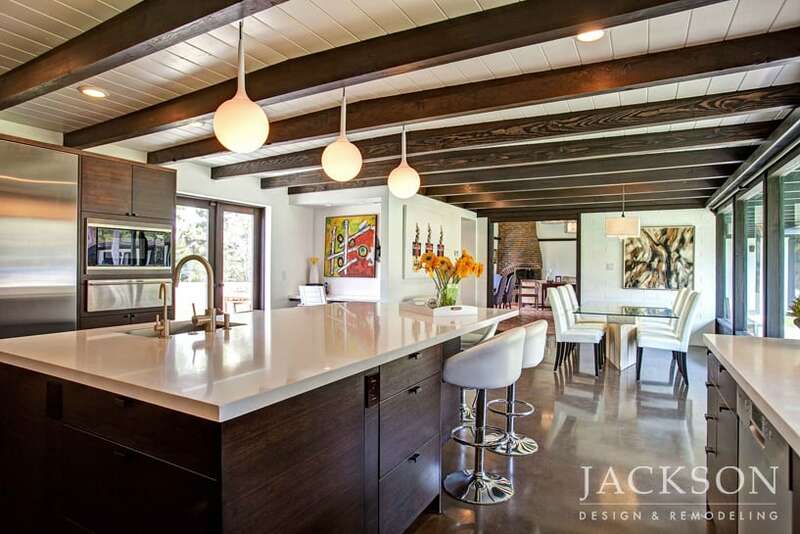 For a family with a passionate appreciation for mid-century modern design, this whole home remodel honors the mid-century period with meticulous detail while retaining an original point of view. 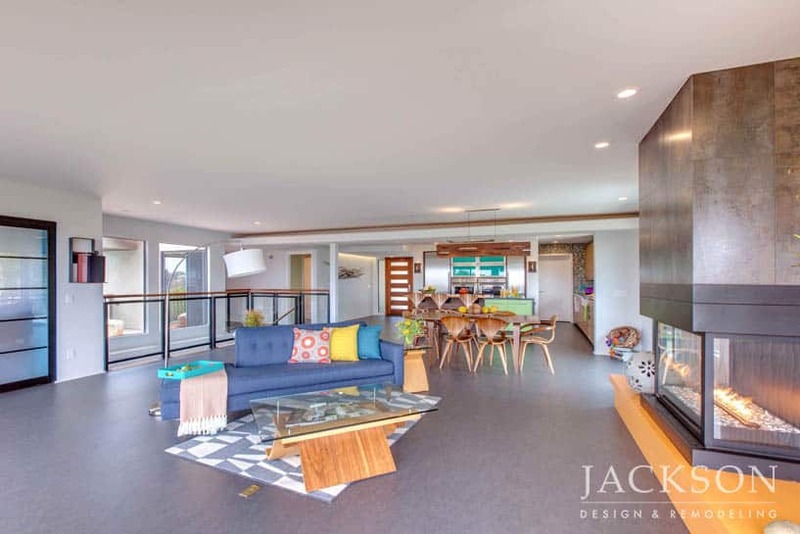 For a young couple with a small child, this Mid-Century Modern home with stunning views was significantly transformed to meet the needs of a modern family, including a private and comfortable space for visiting parents. 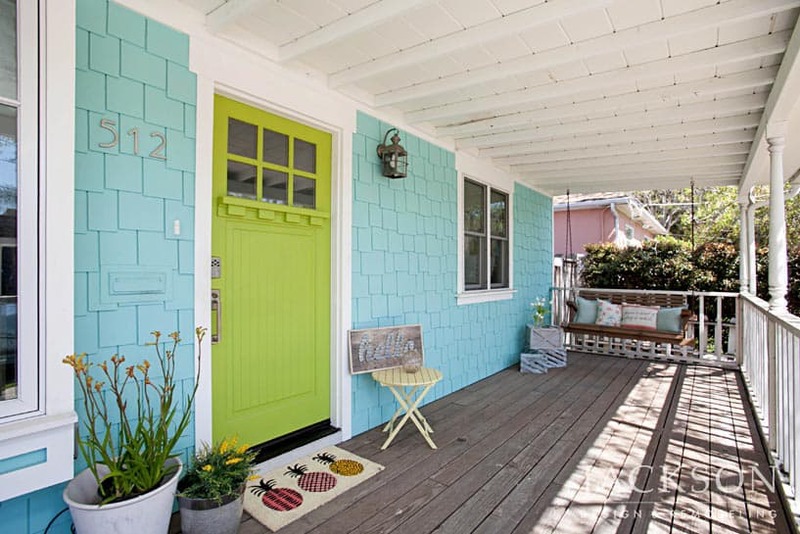 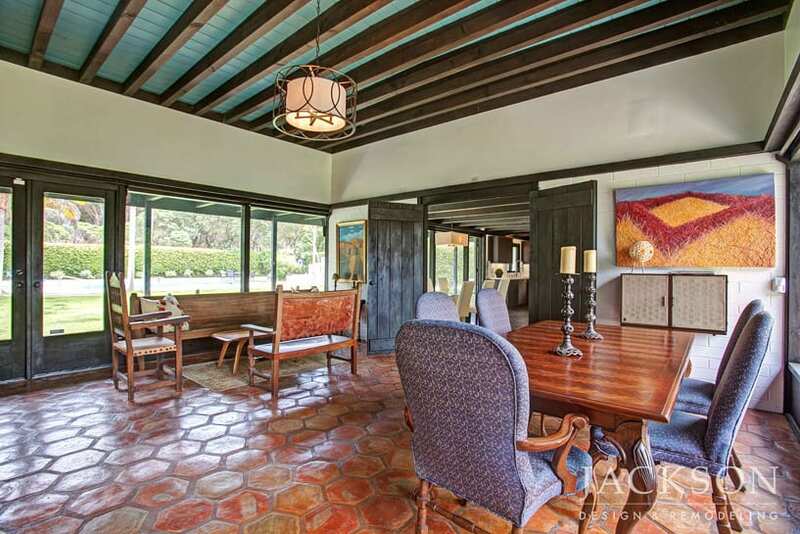 This cottage near the beach is the home of a woman who wanted to transform her outdated space. 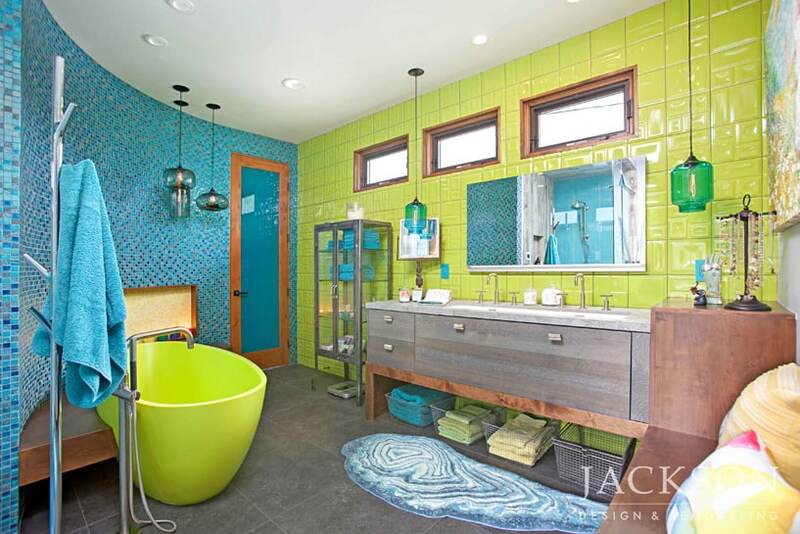 Rather than a traditional beach aesthetic, she wanted a bright design expressing her artistic personality and her interest in all things crafty and repurposed. 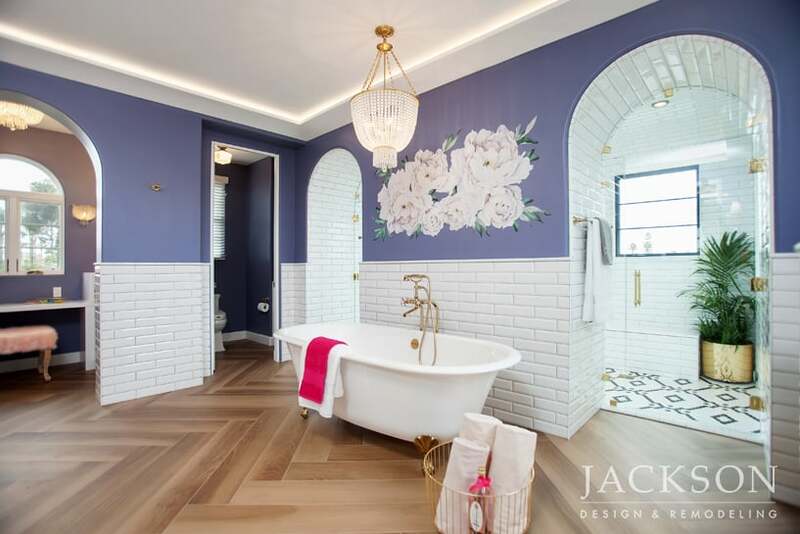 This large home was transformed for a client who wanted to live in a meticulous space with a feminine approach, embracing romance and luxury. 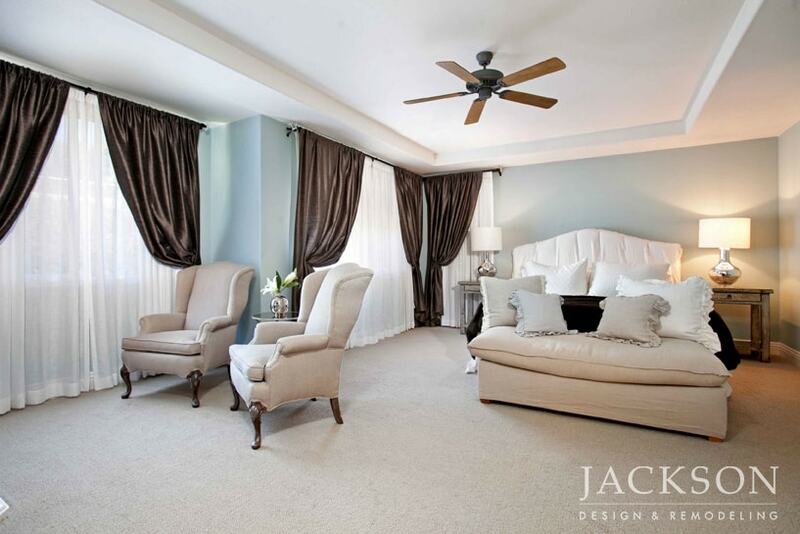 The new style defines romantic glamour with a soothing color palette, sumptuous materials and impeccable details. 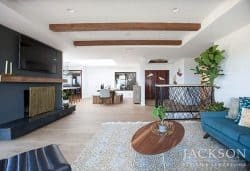 A young professional couple wanted to respect the original architecture and intention of their 1960s home while transforming the space to enhance their modern lifestyle. 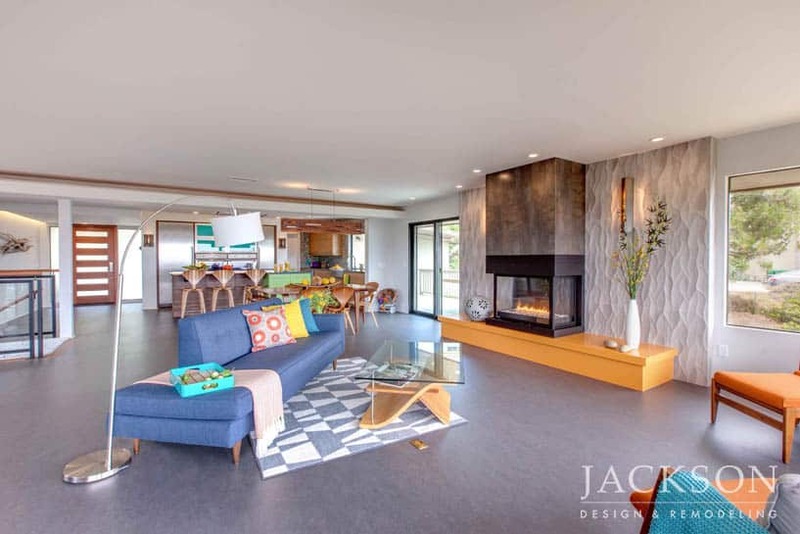 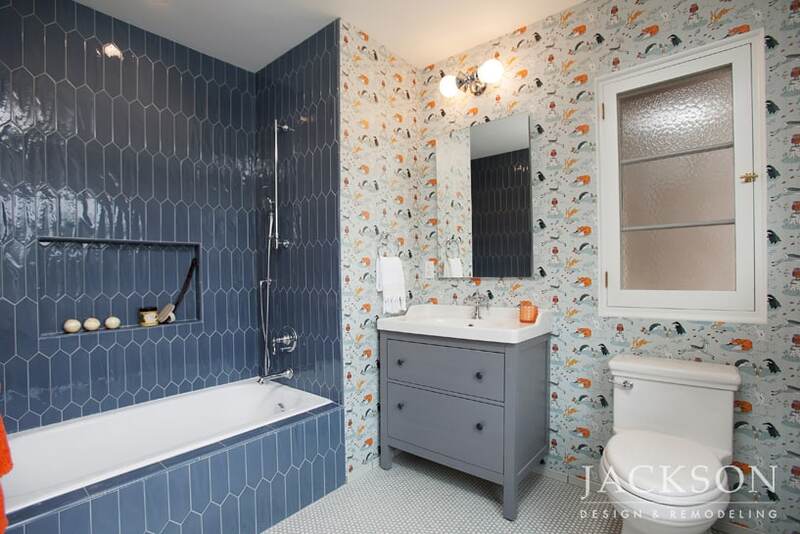 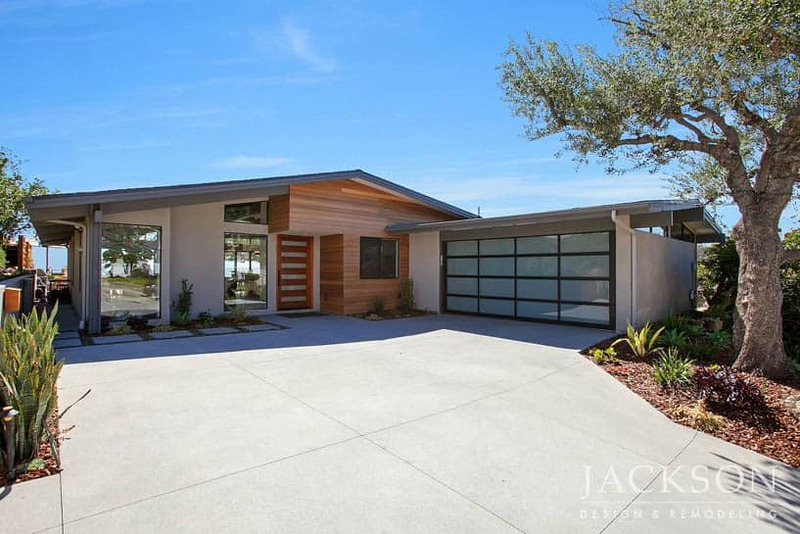 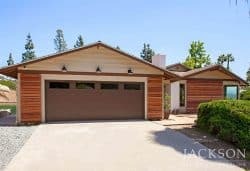 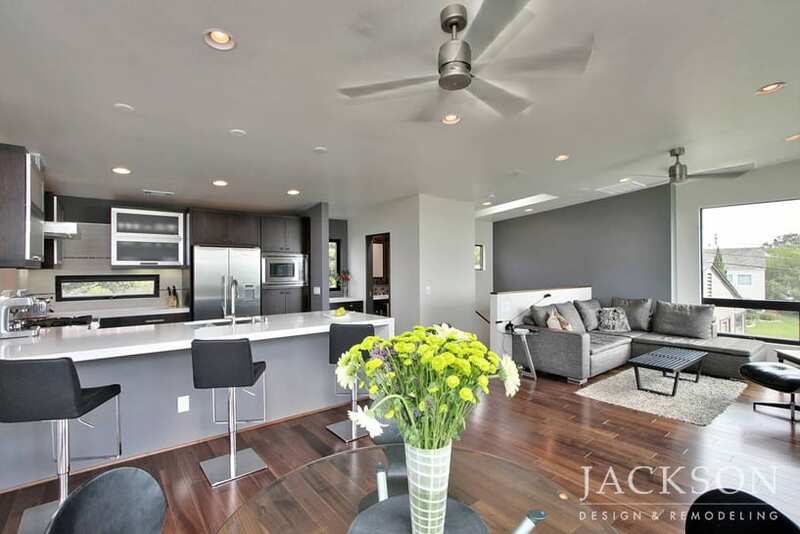 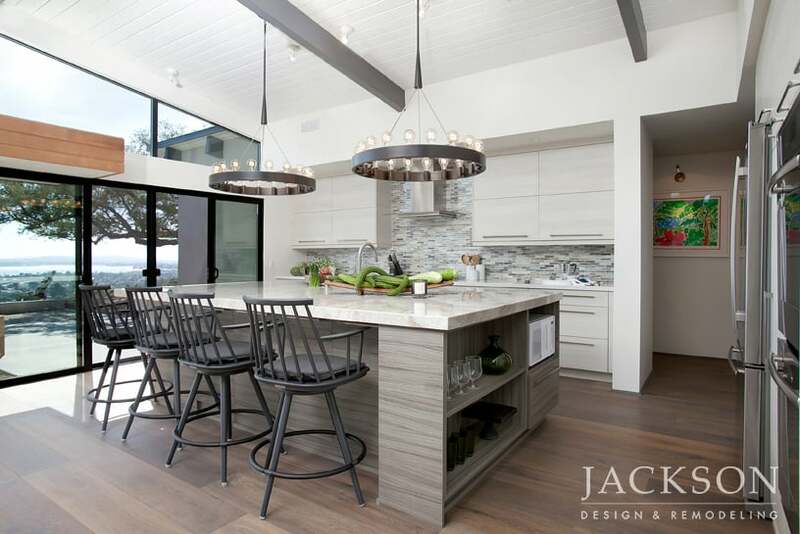 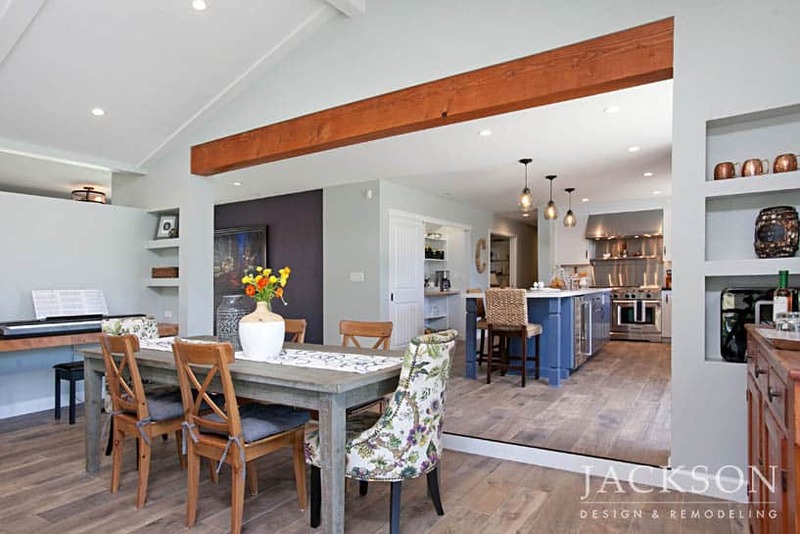 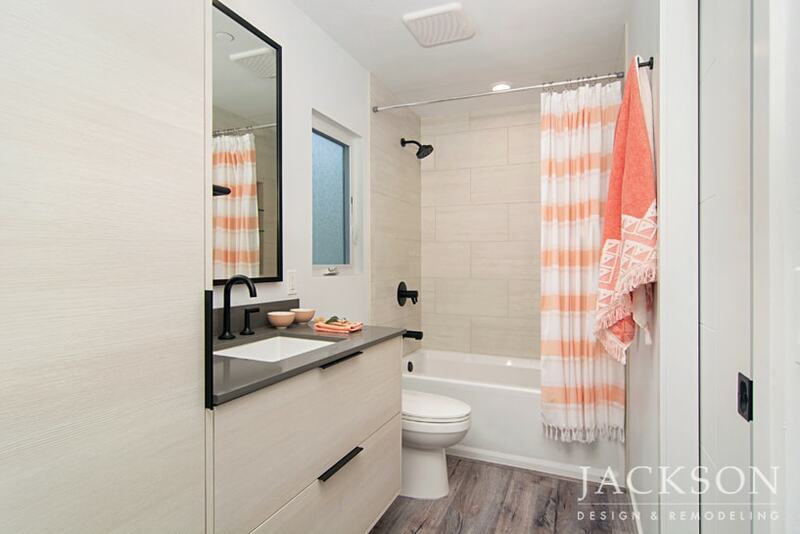 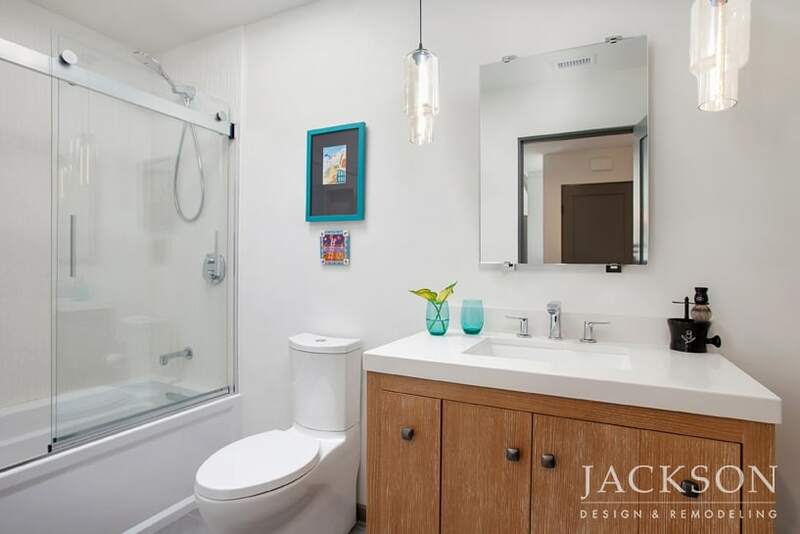 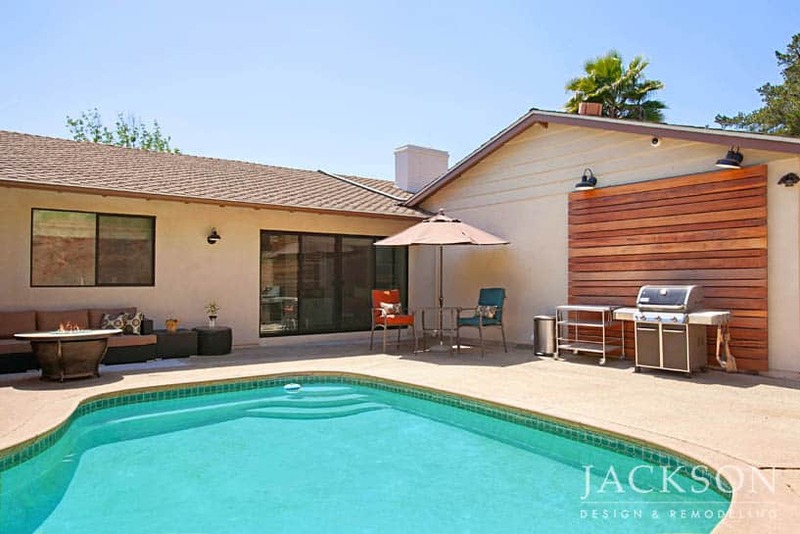 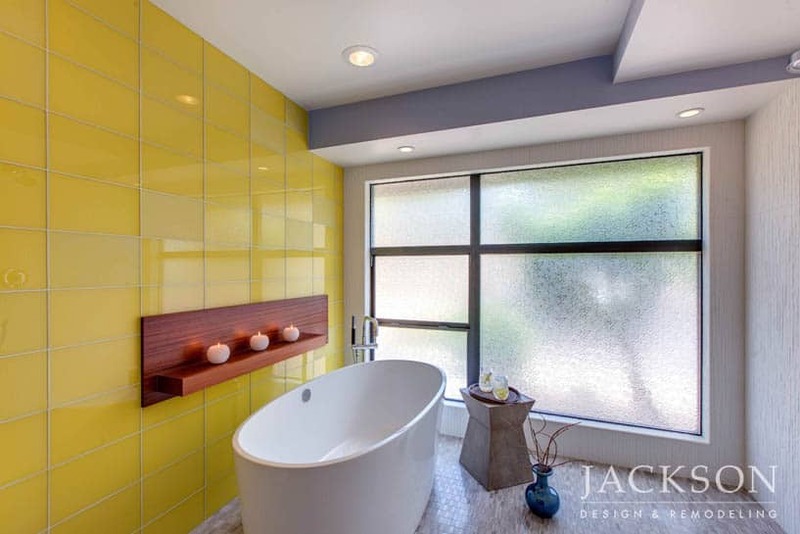 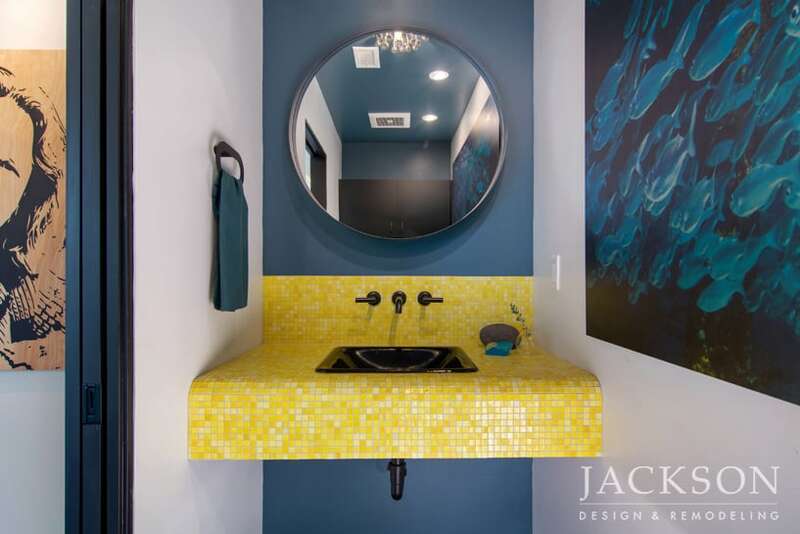 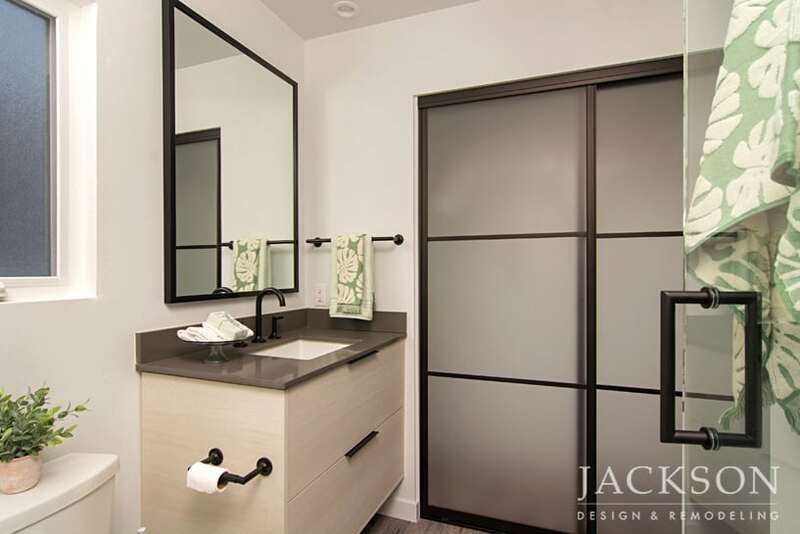 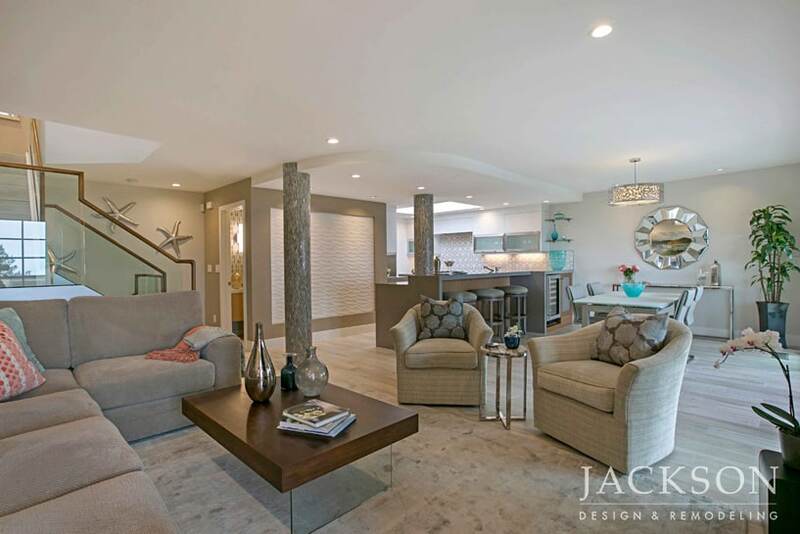 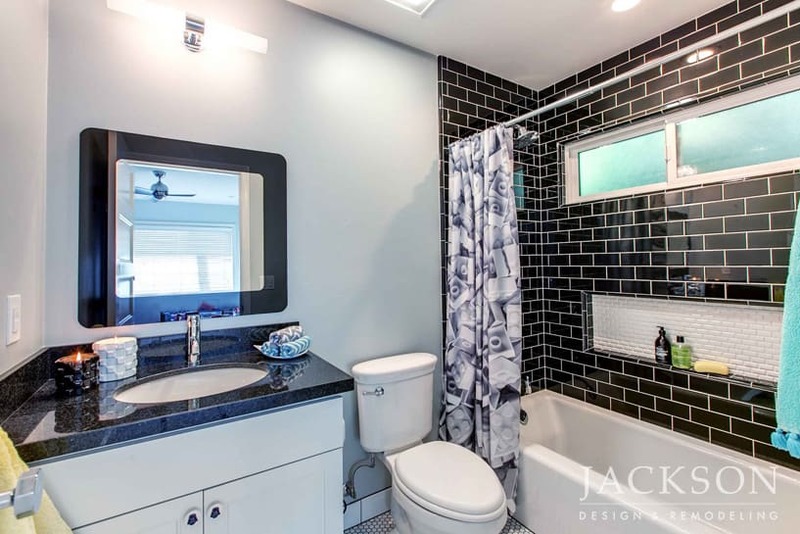 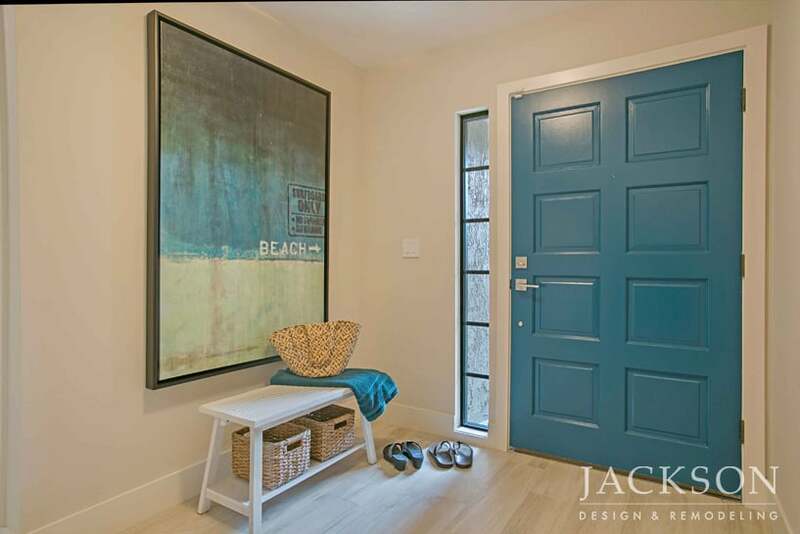 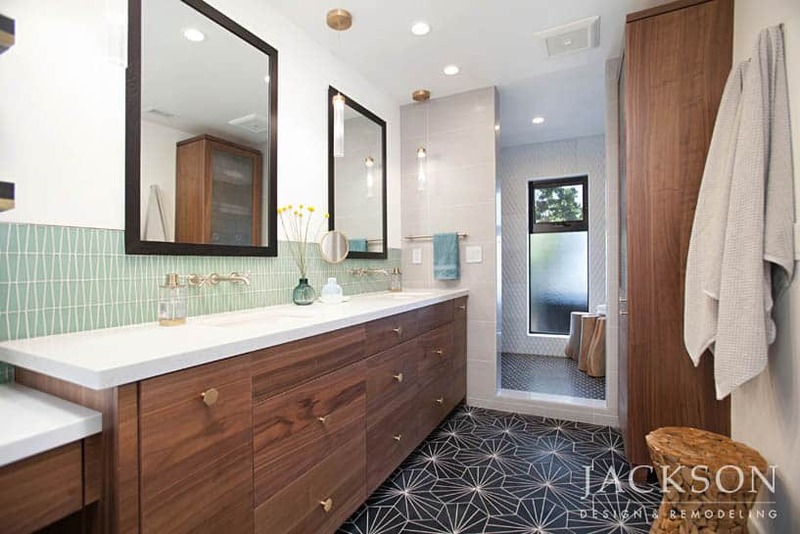 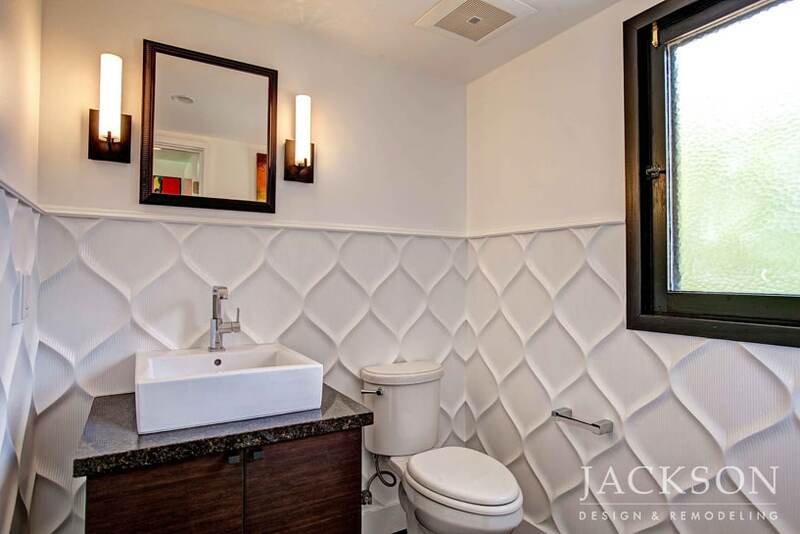 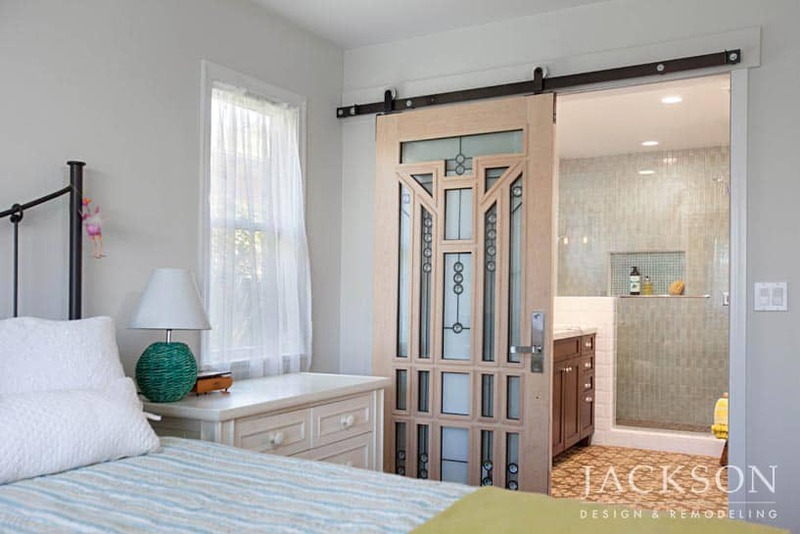 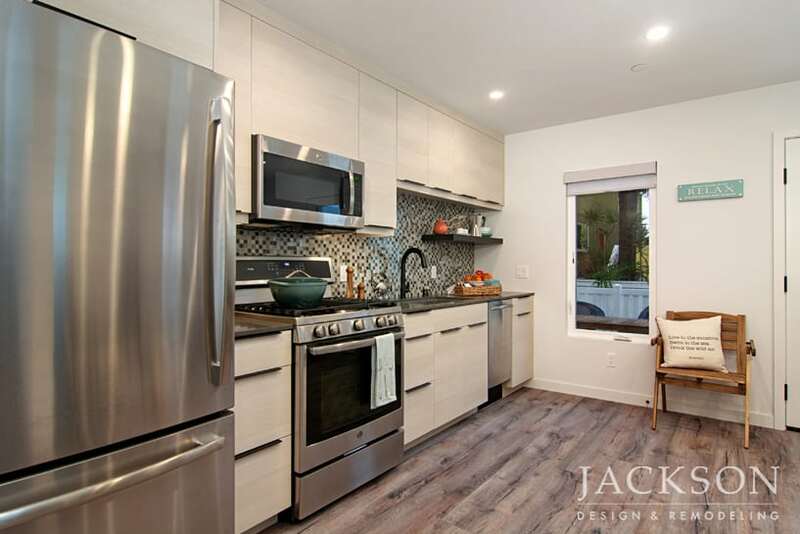 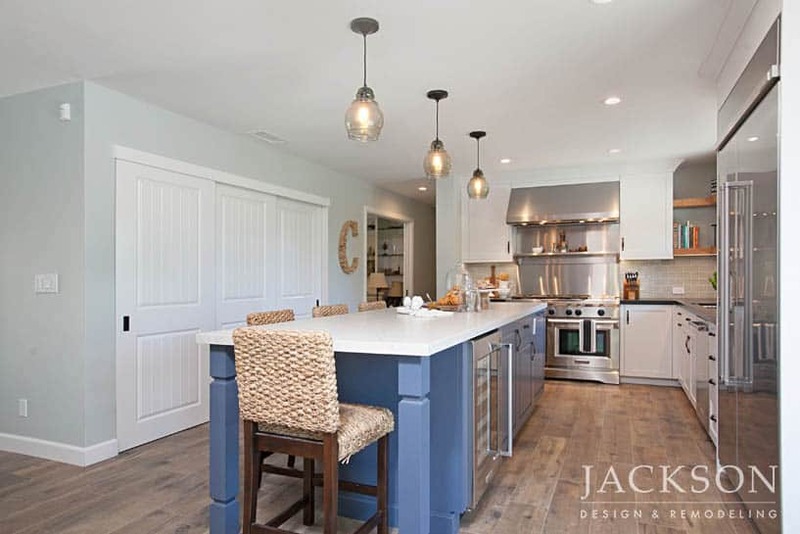 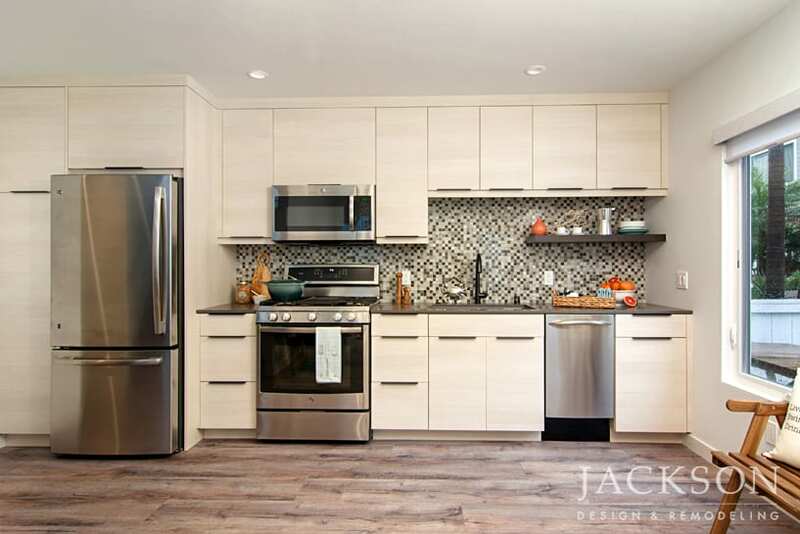 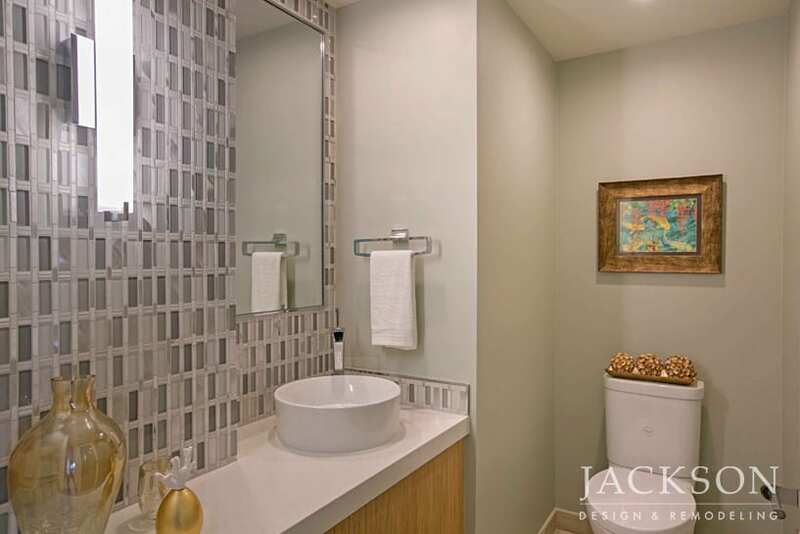 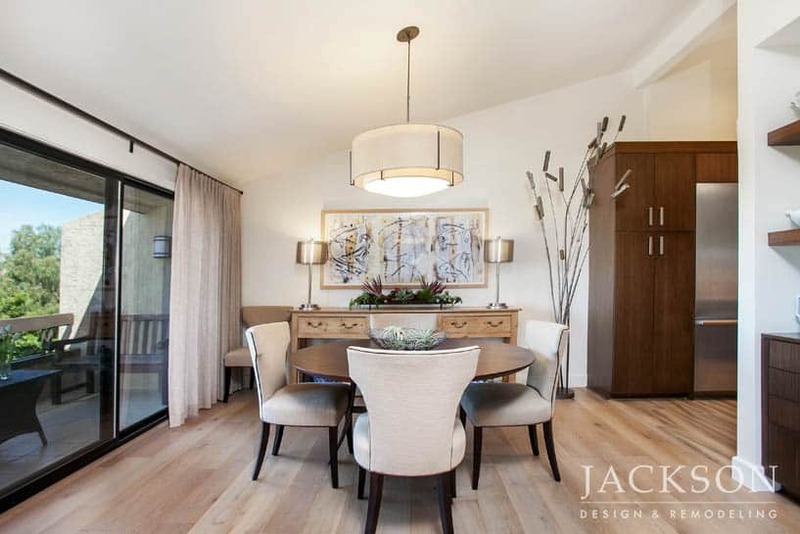 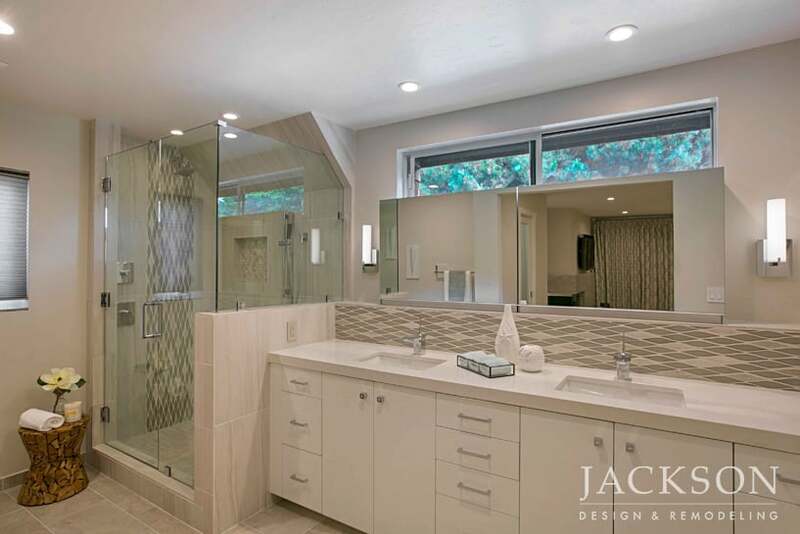 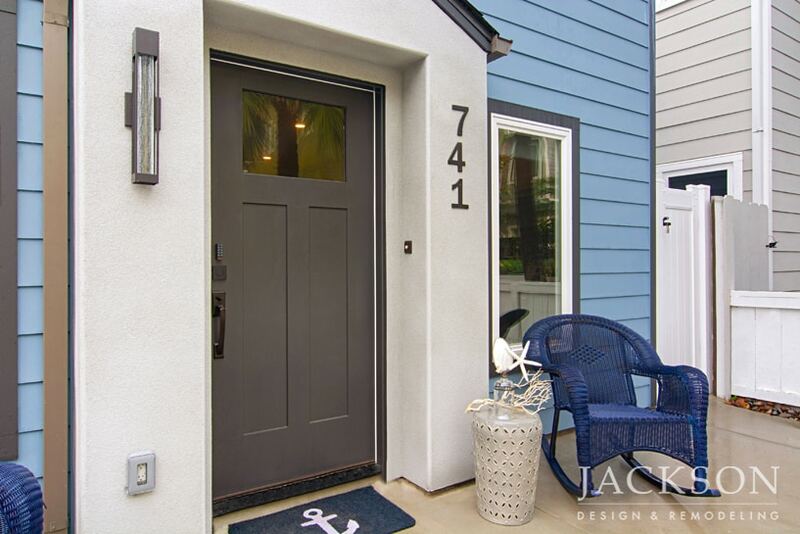 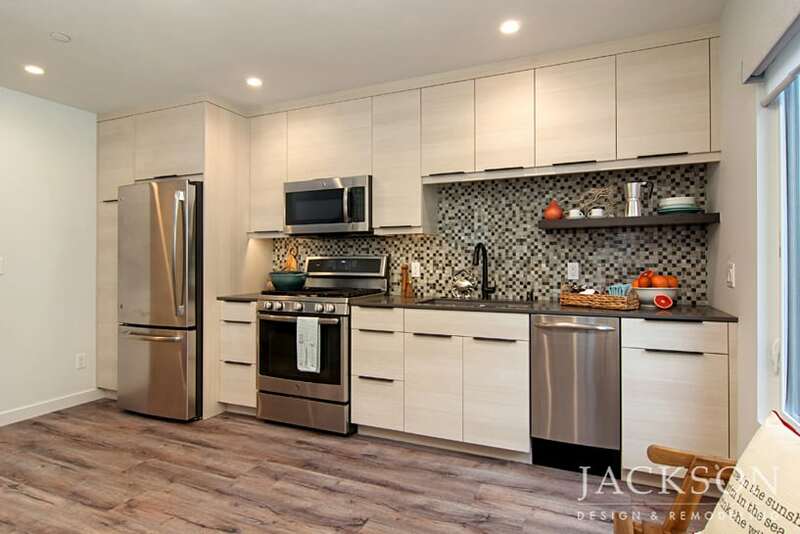 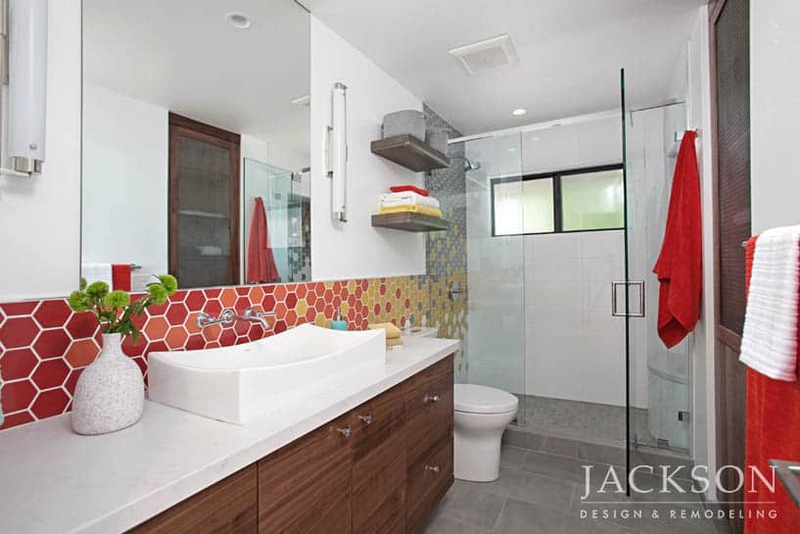 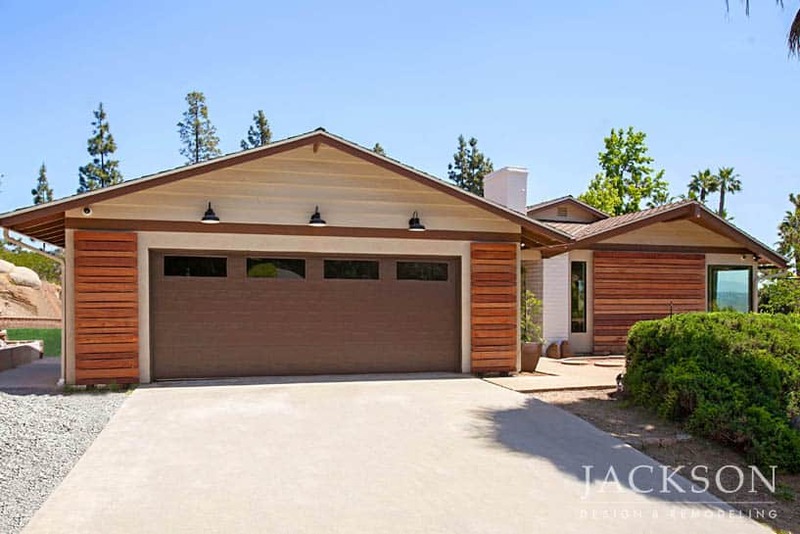 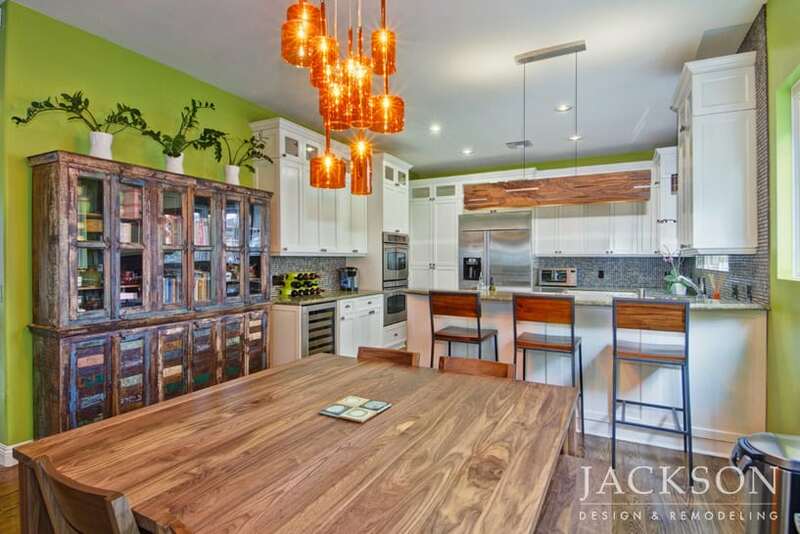 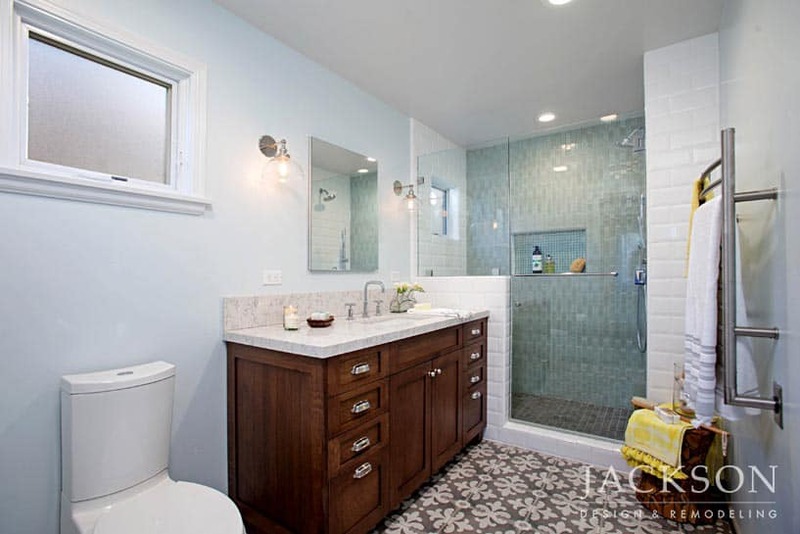 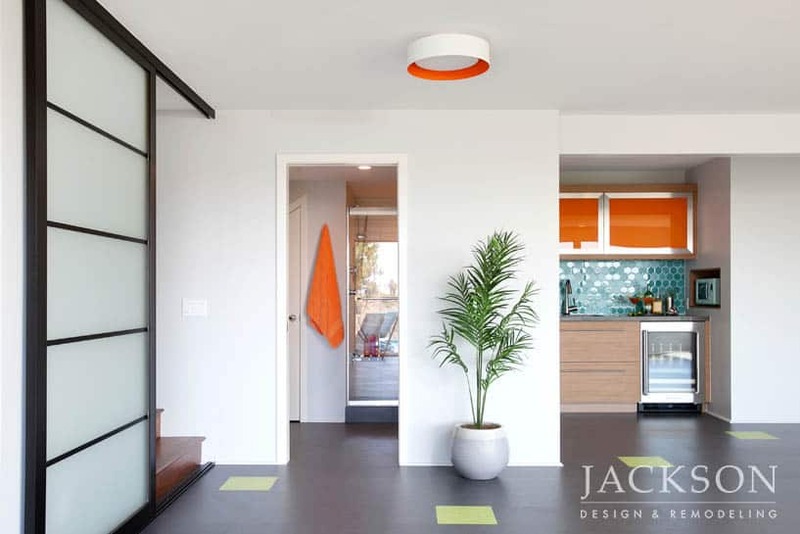 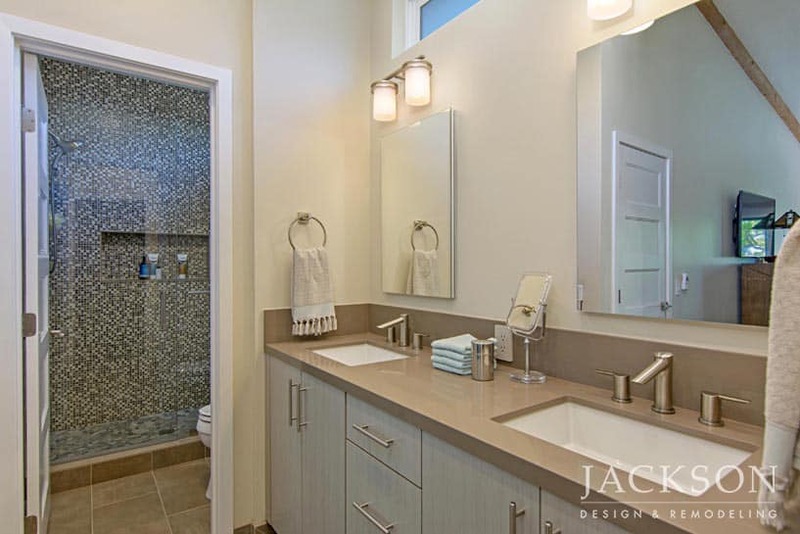 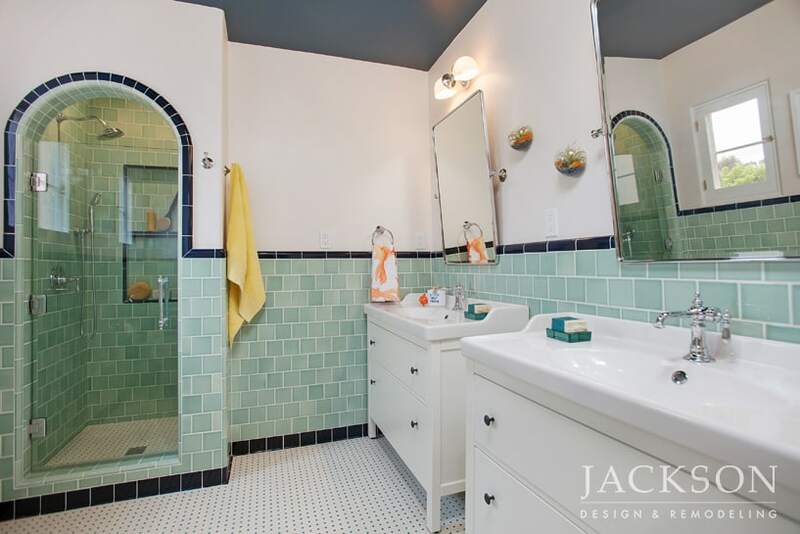 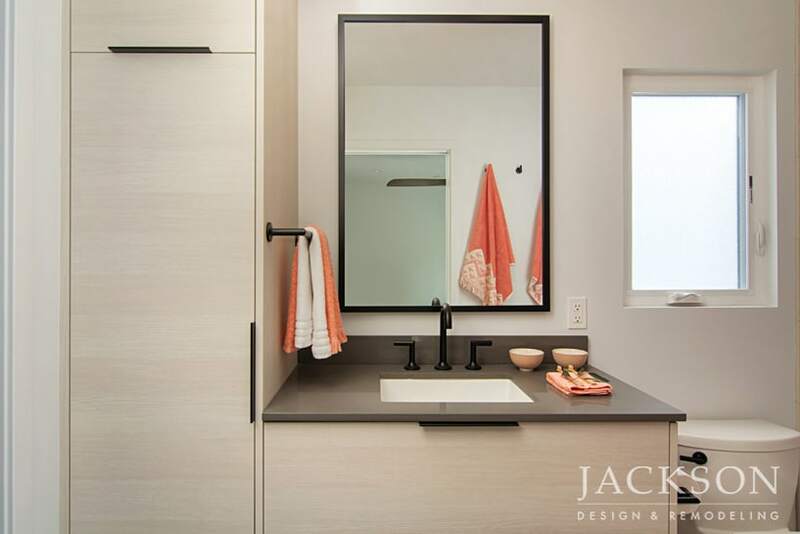 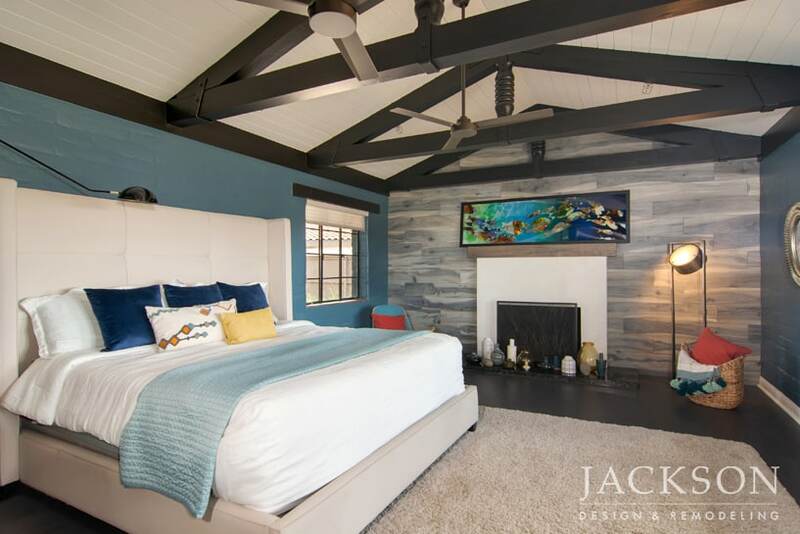 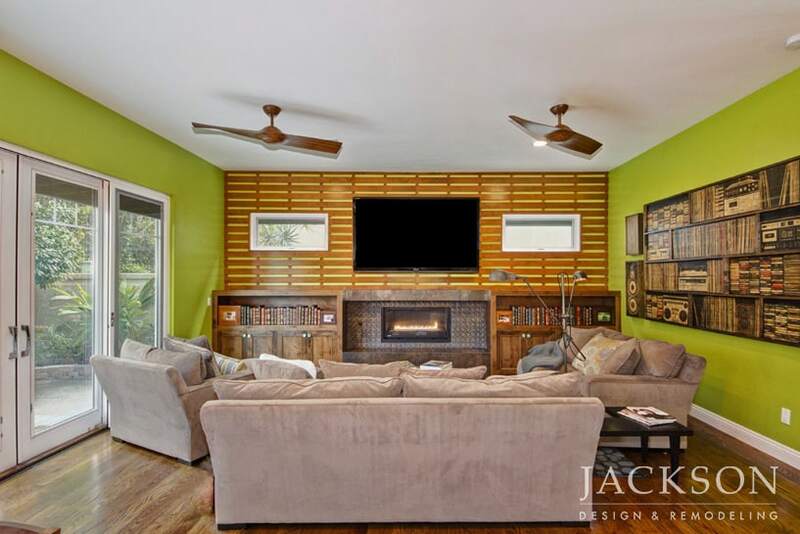 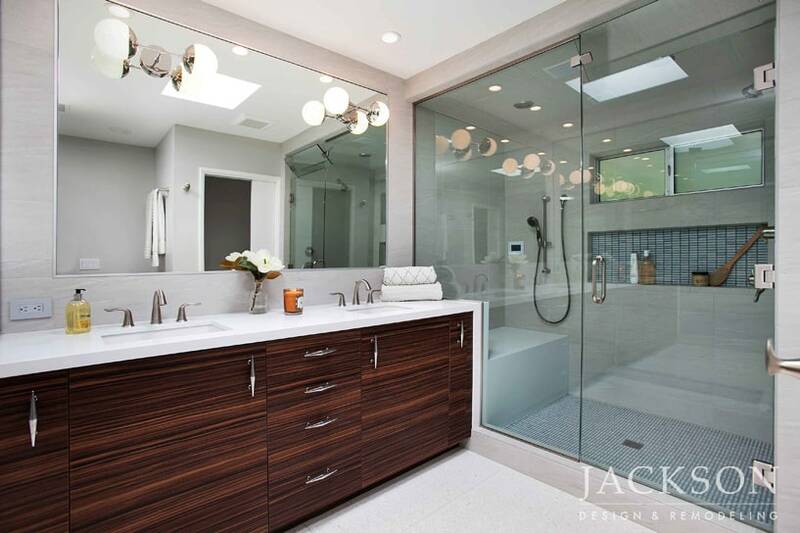 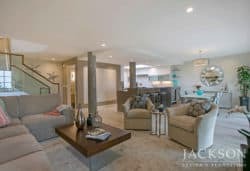 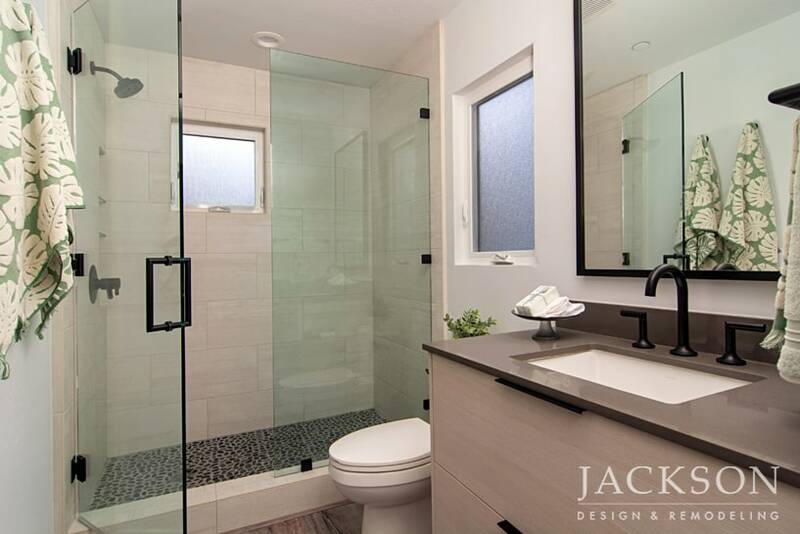 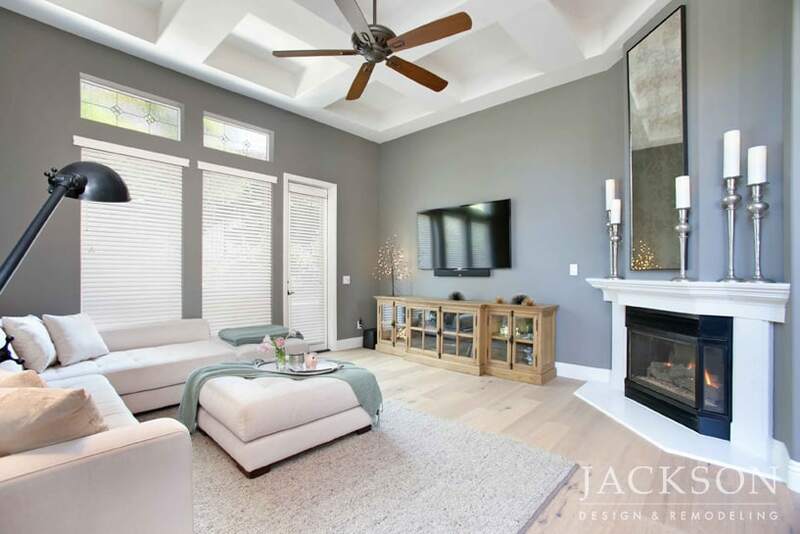 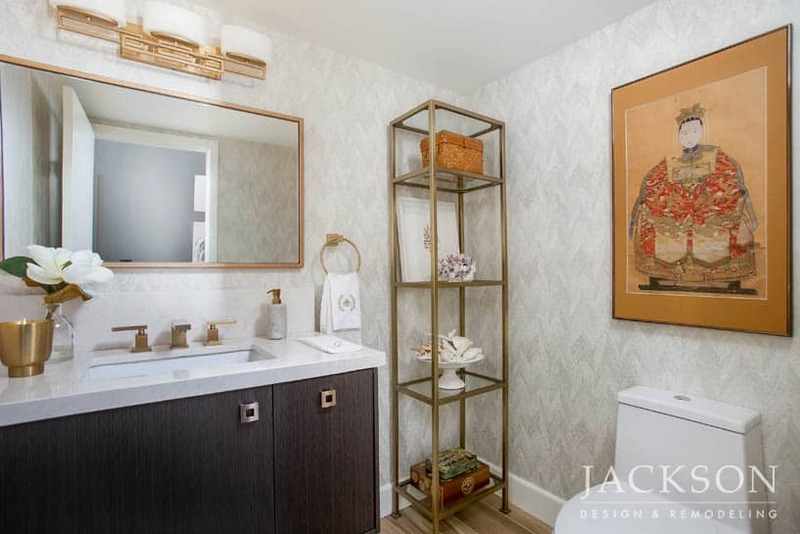 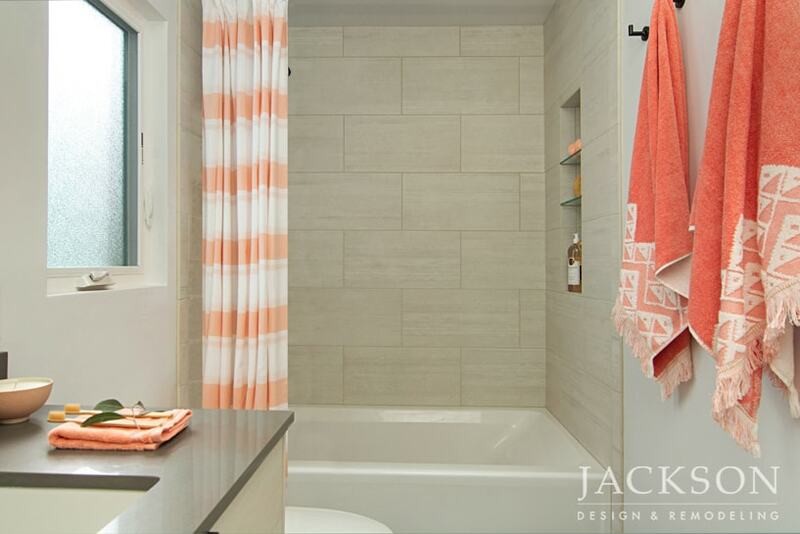 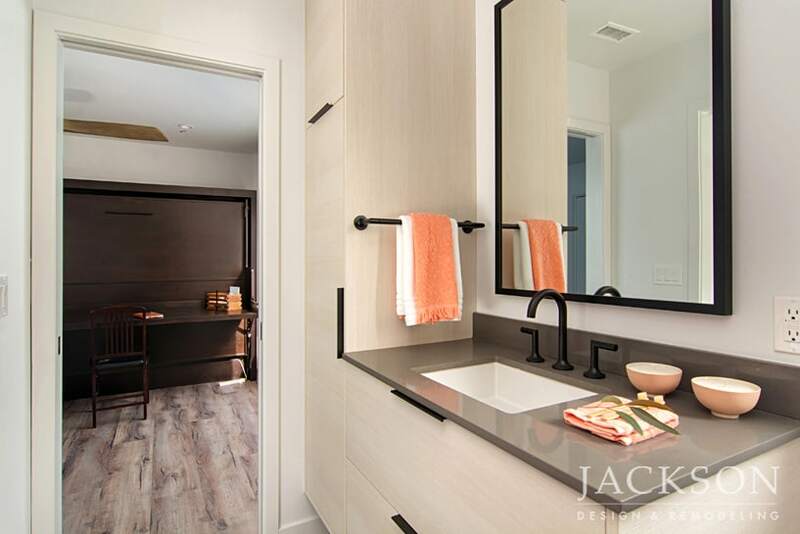 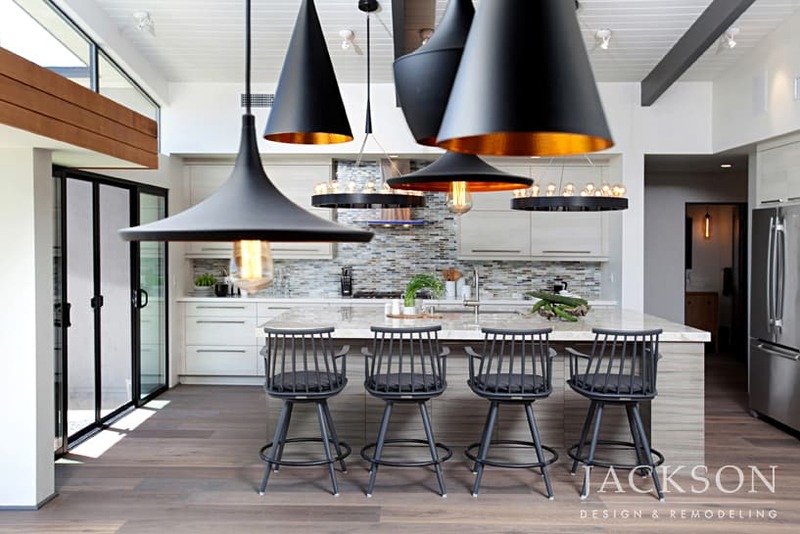 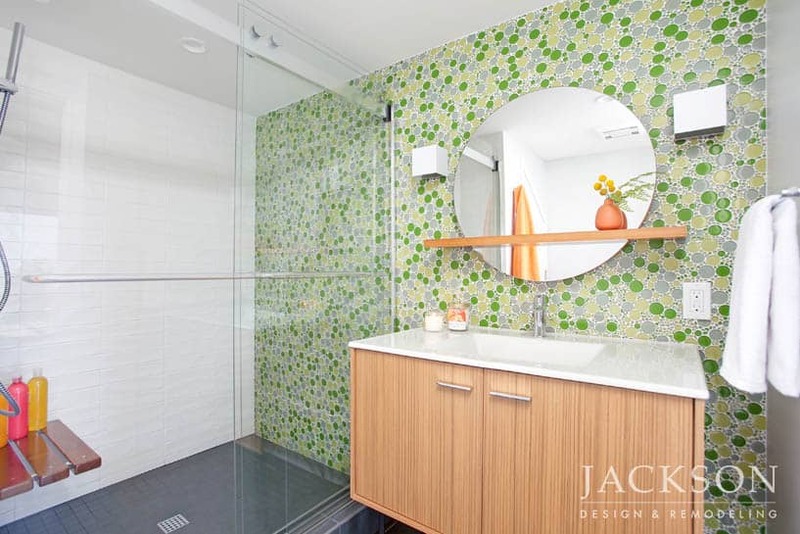 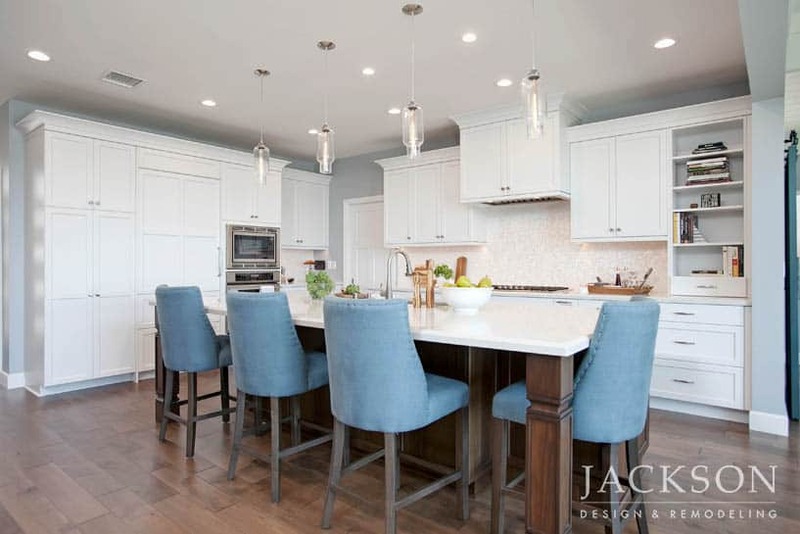 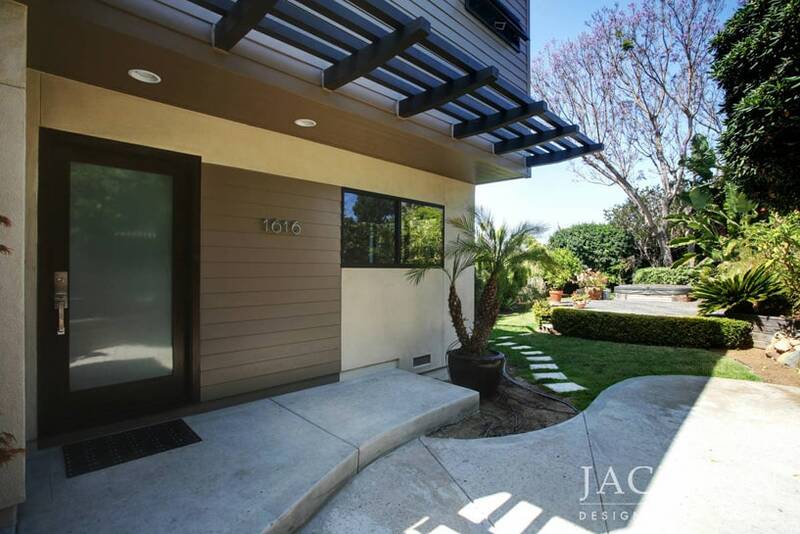 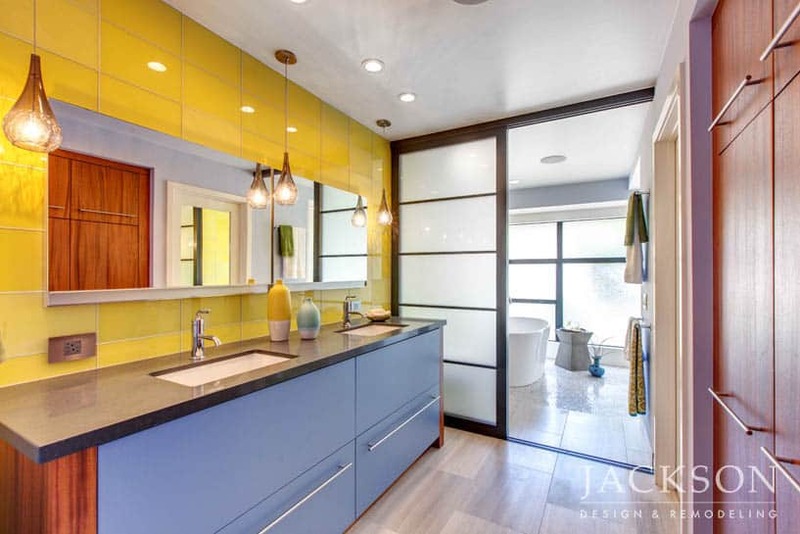 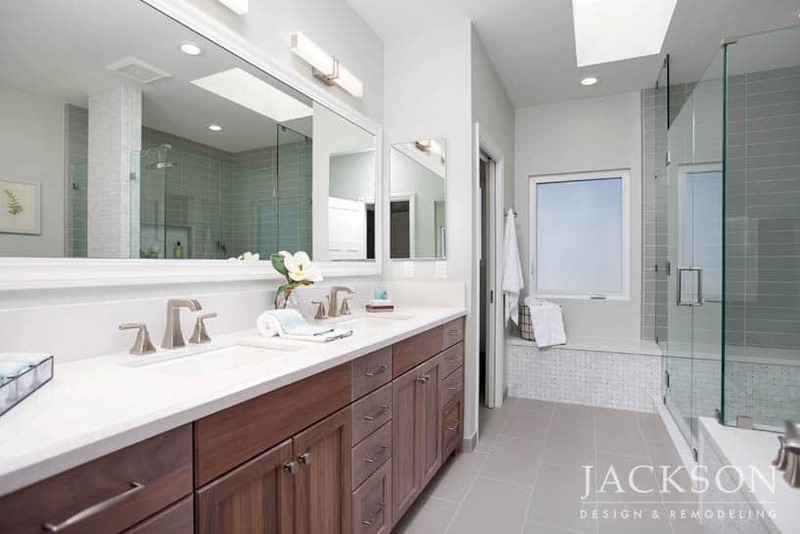 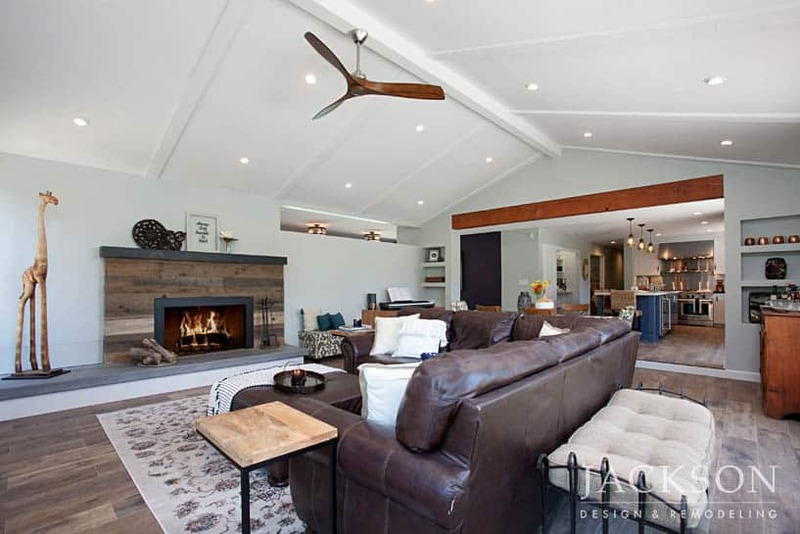 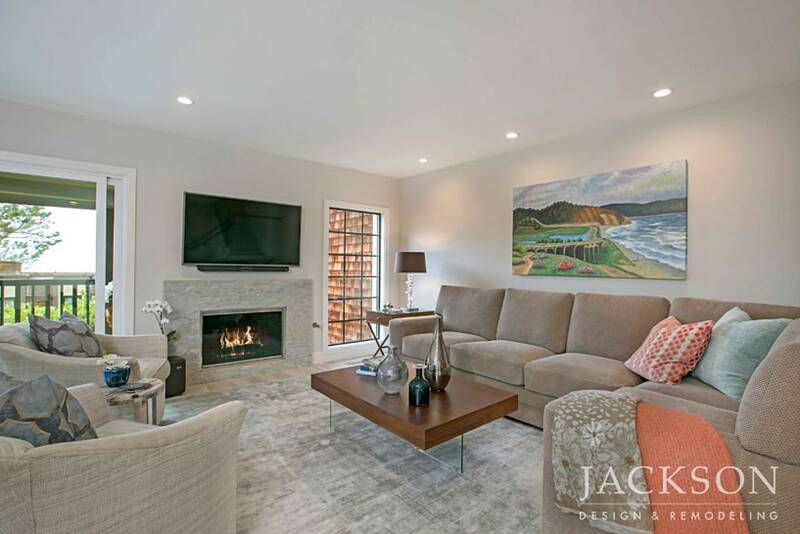 The new design brings their home to life with new color, texture, and balance while retaining original elements that appeal to a couple with a passion for Mid-Century Modern design. 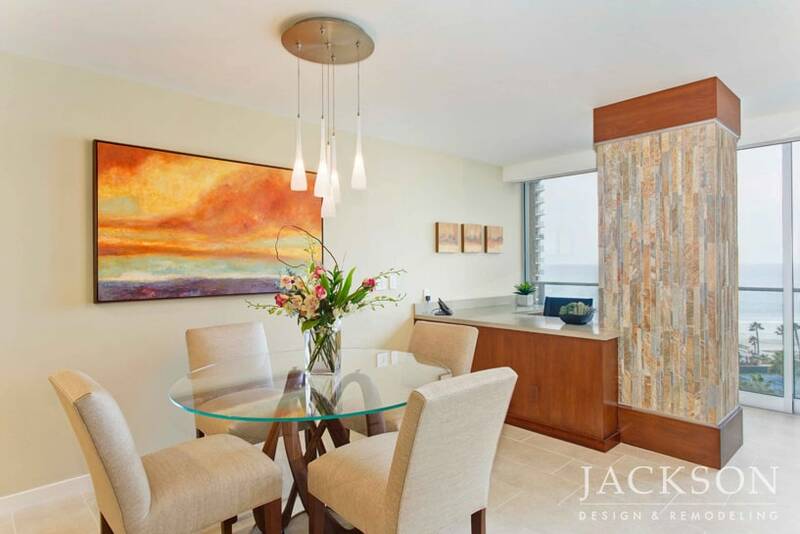 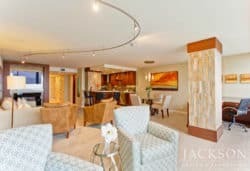 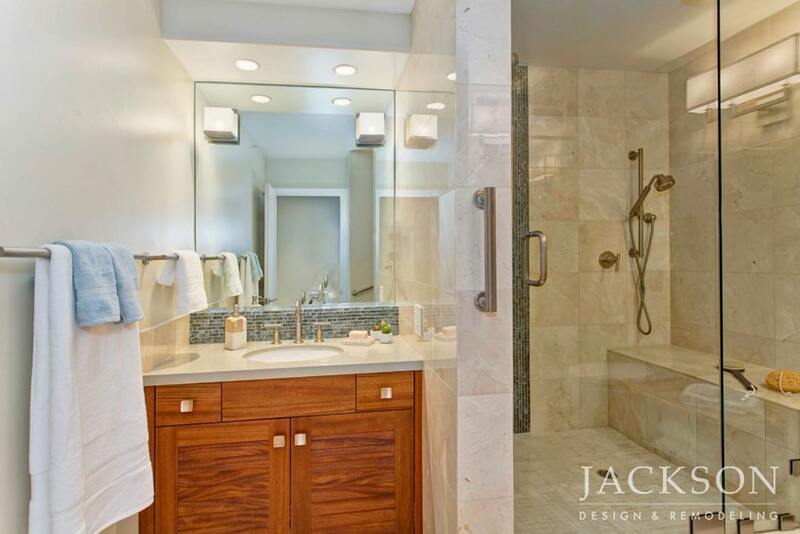 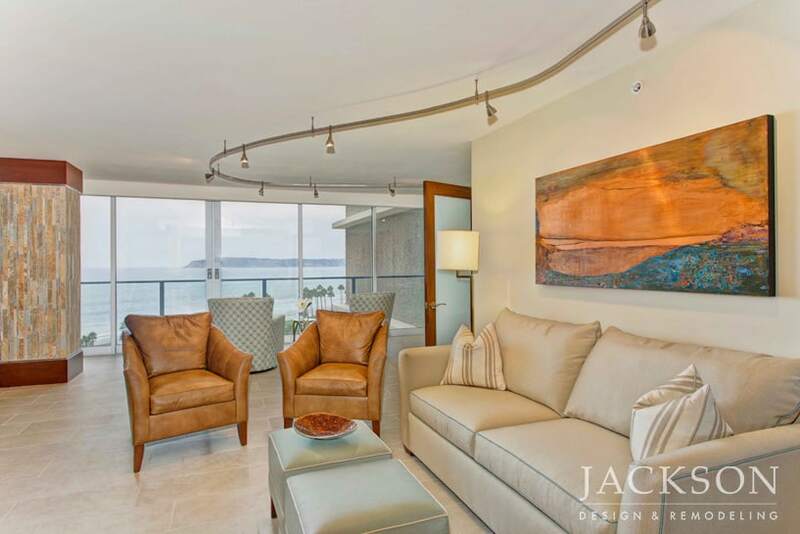 A stunning view of the Pacific Ocean is the natural focal point of this waterfront condo. 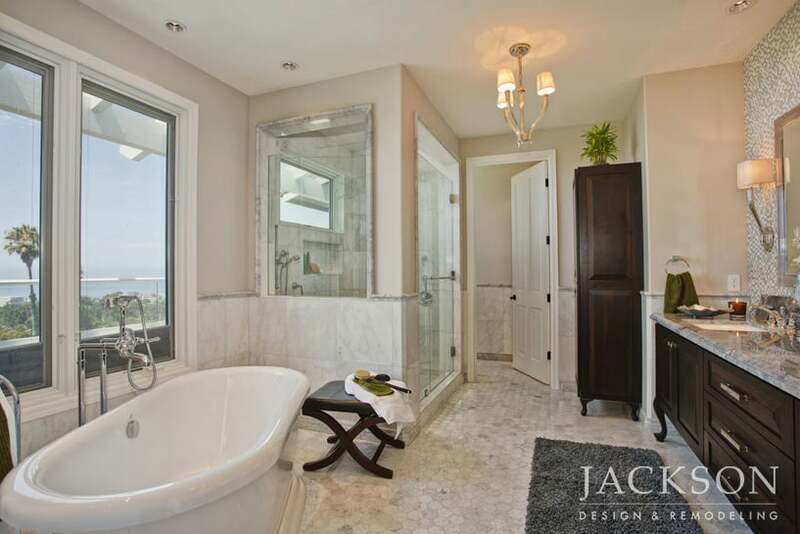 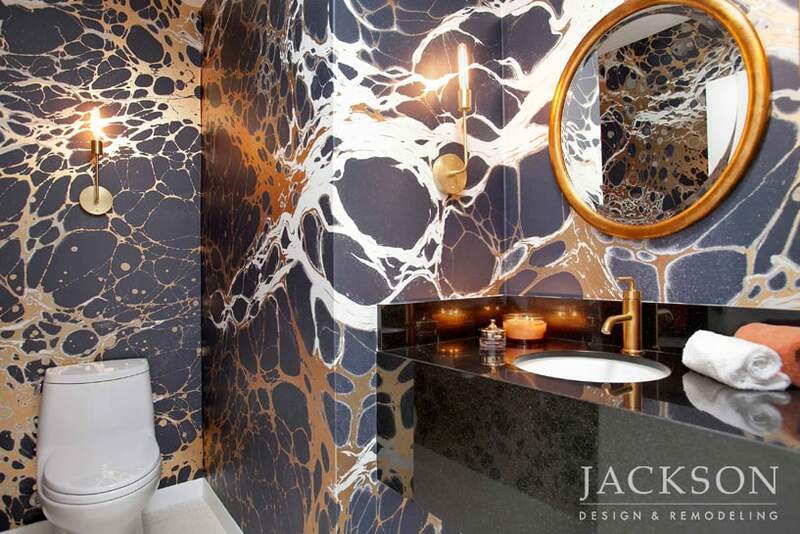 The design combines innovation and restraint to embrace the surroundings and create a sense of seaside luxury. 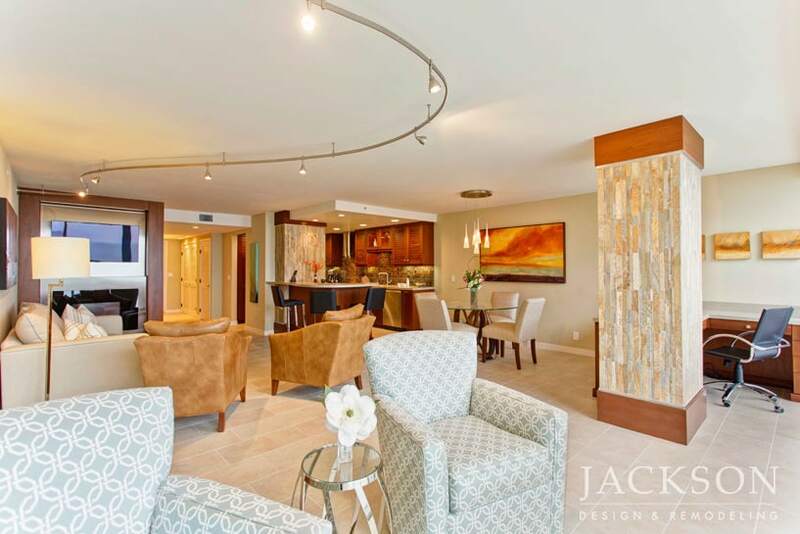 This three-level town home near the beach is a second home for a retired couple. 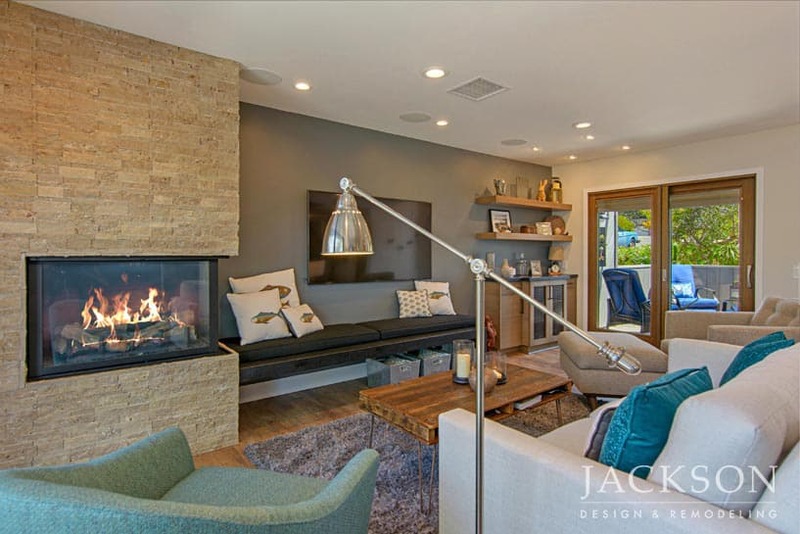 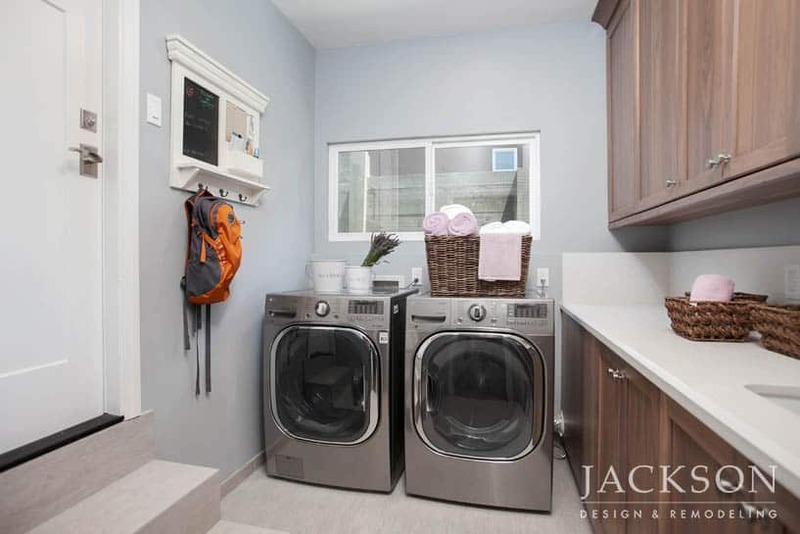 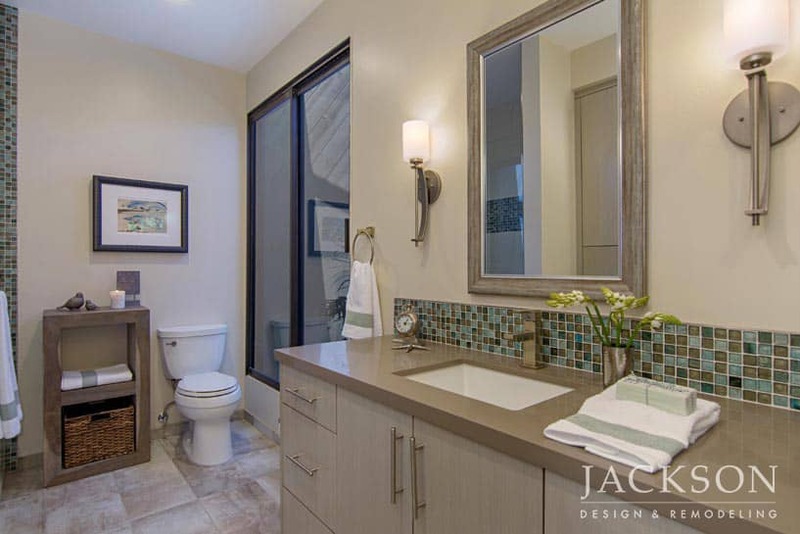 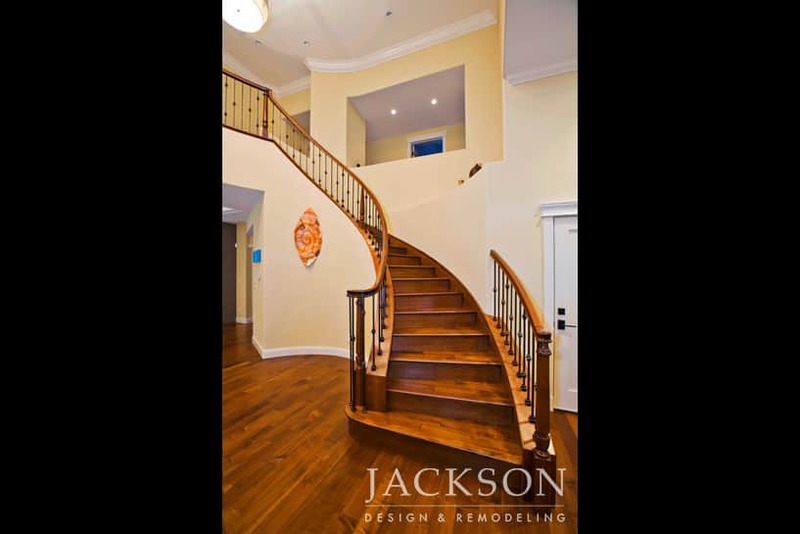 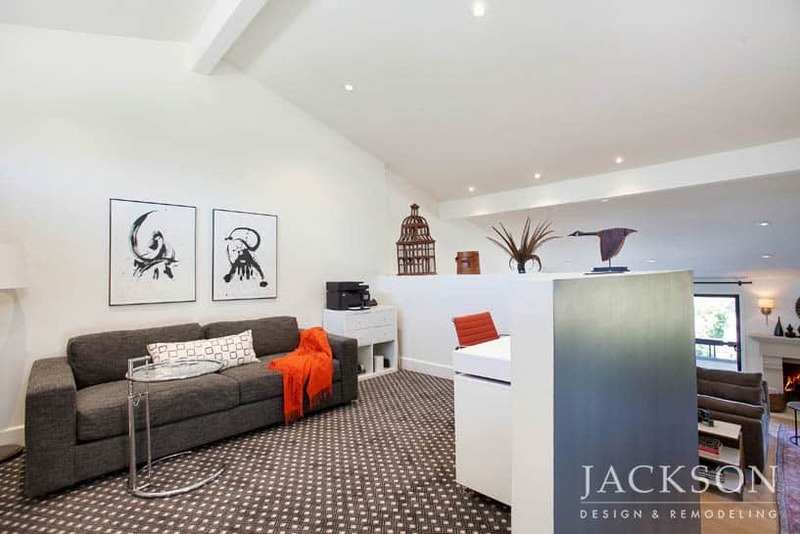 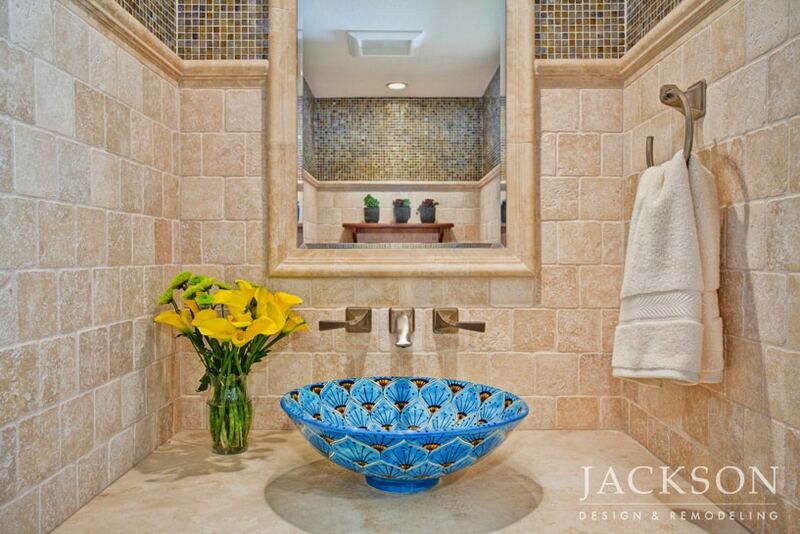 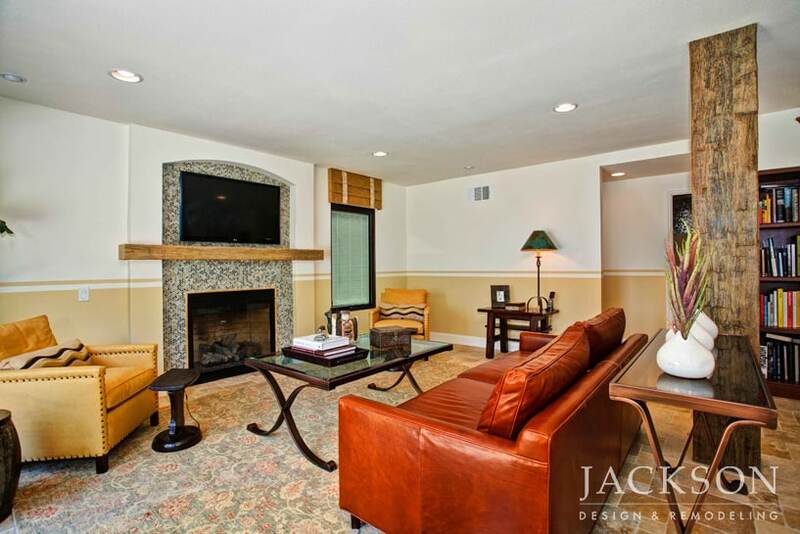 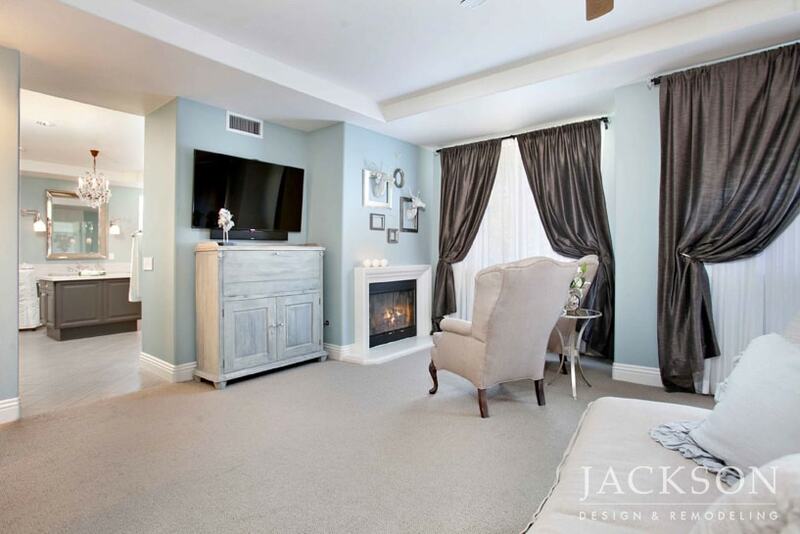 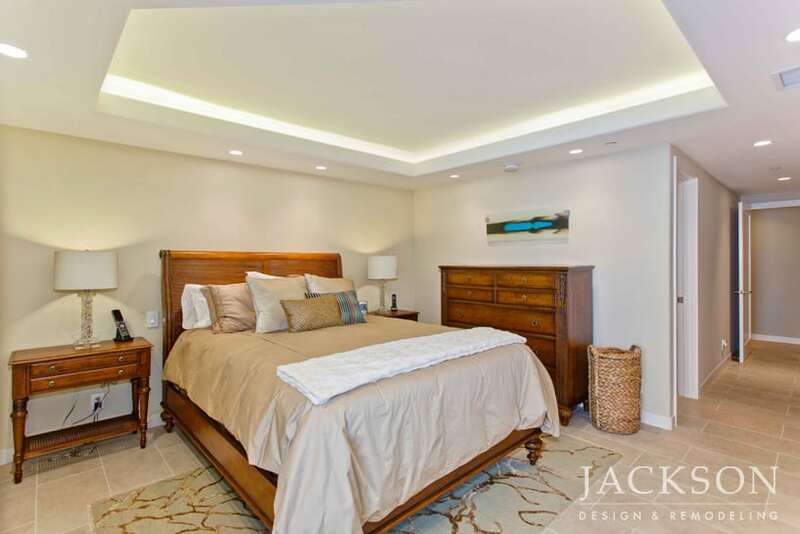 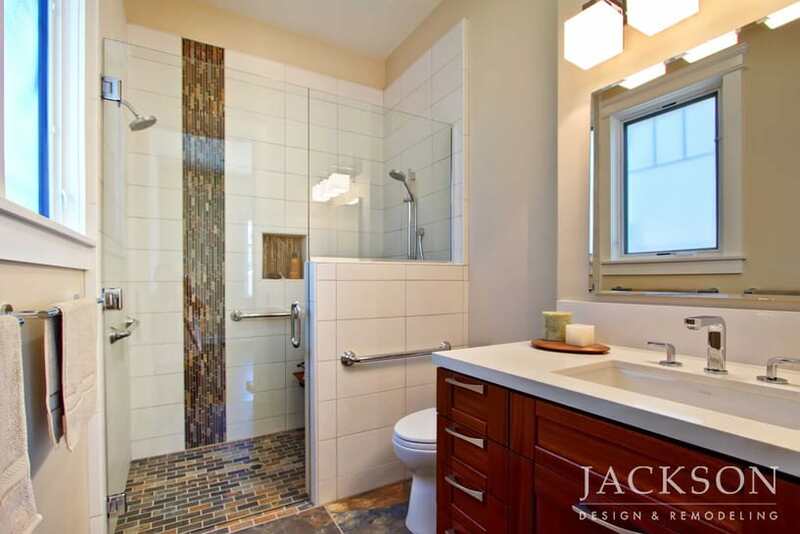 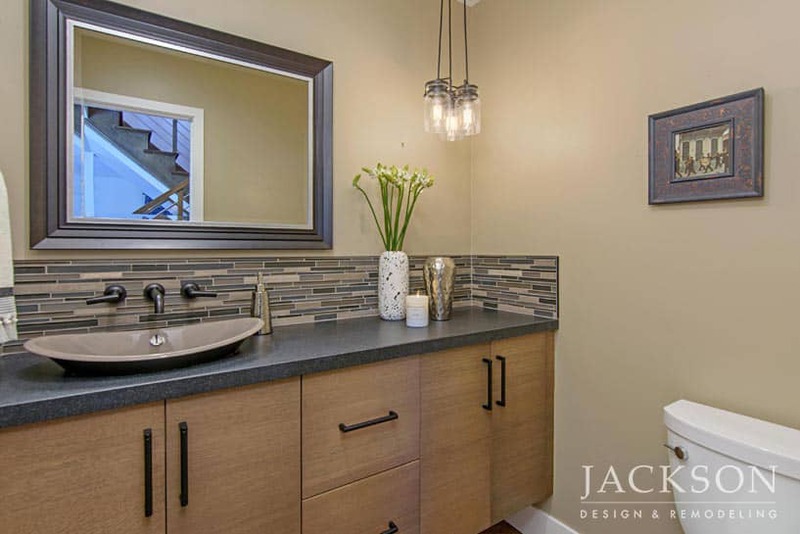 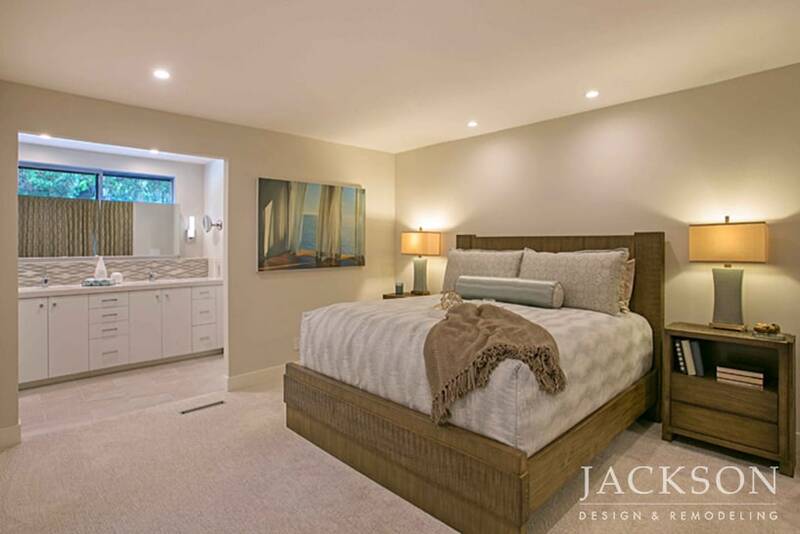 They wanted to make their space more welcoming for family, while significantly enhancing the overall look and feel. 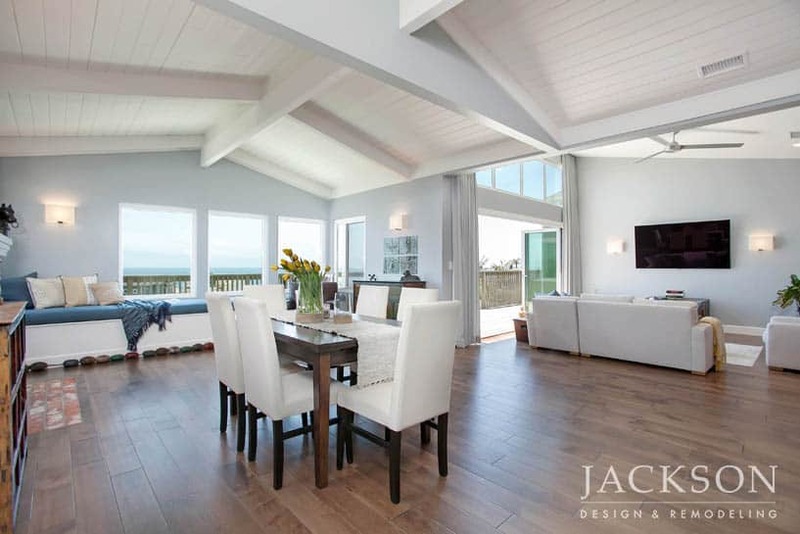 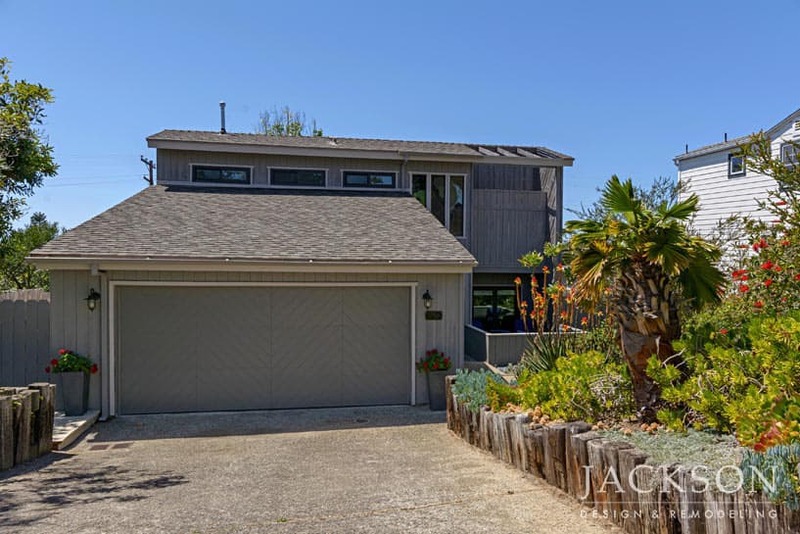 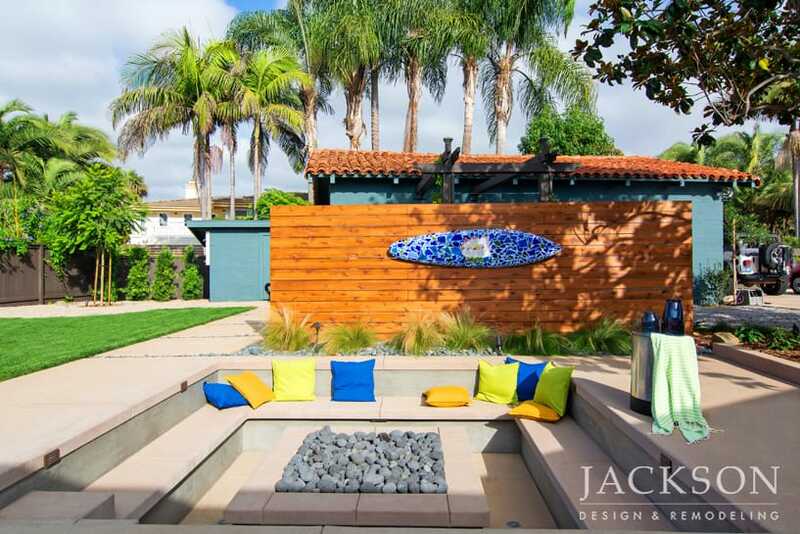 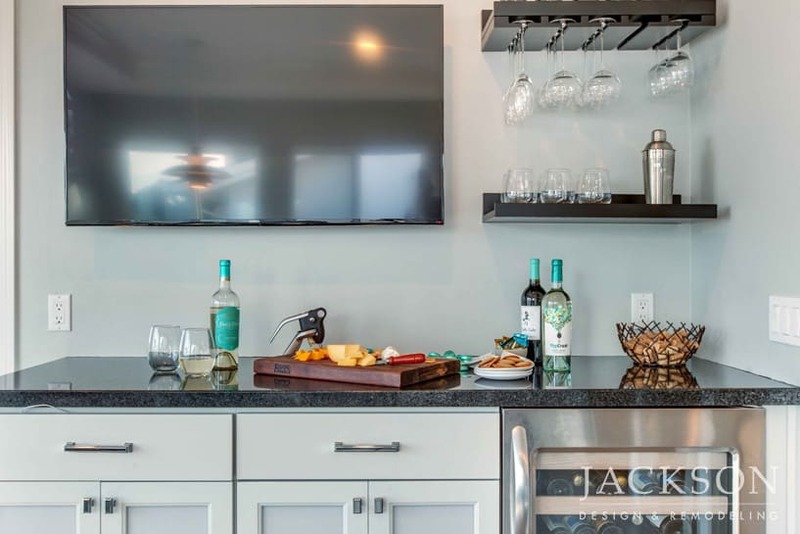 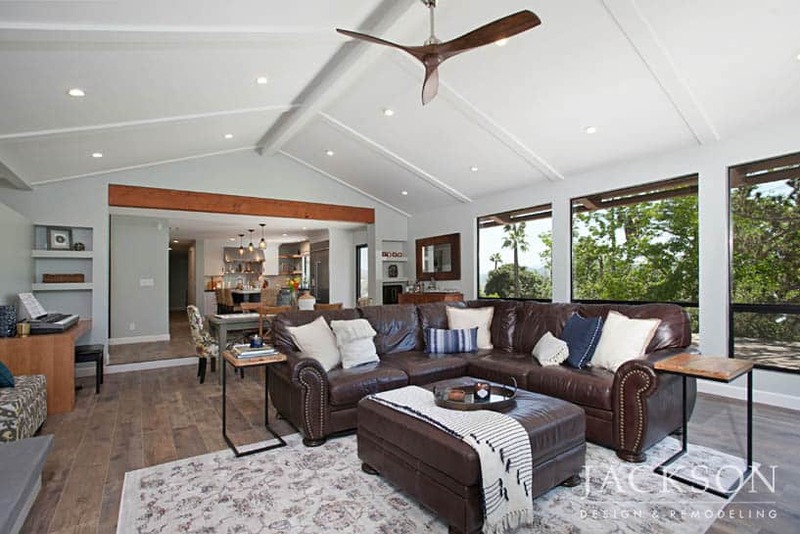 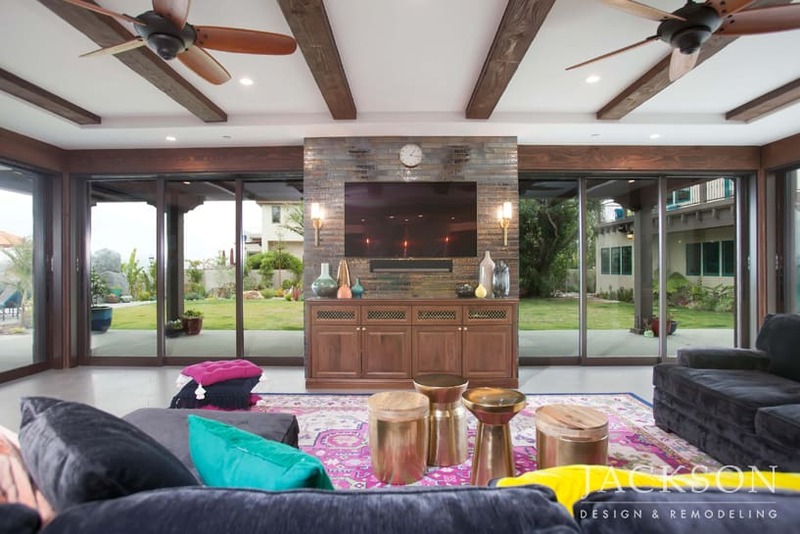 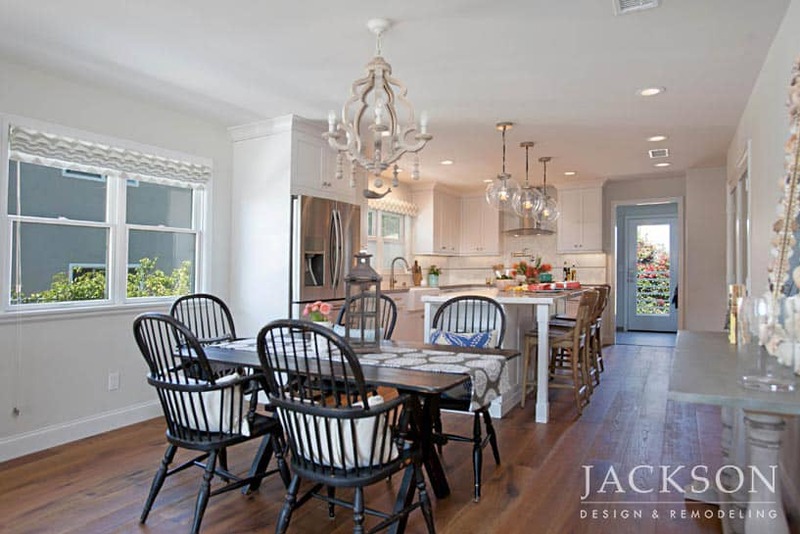 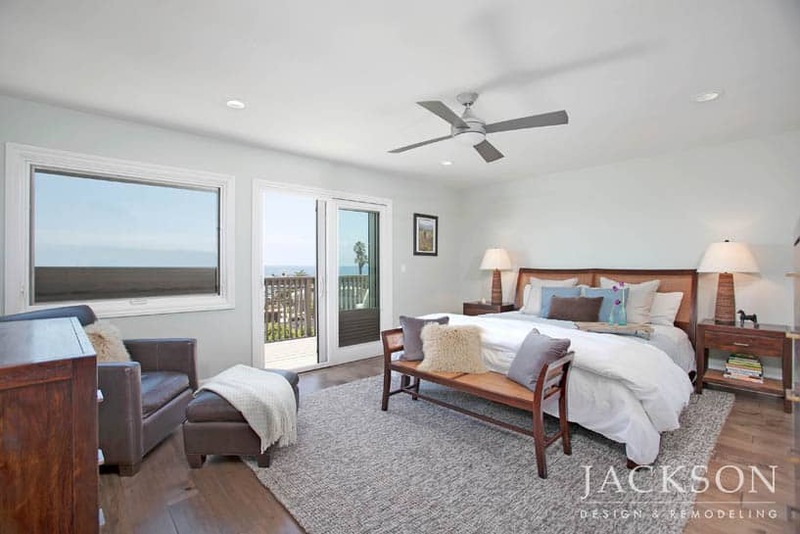 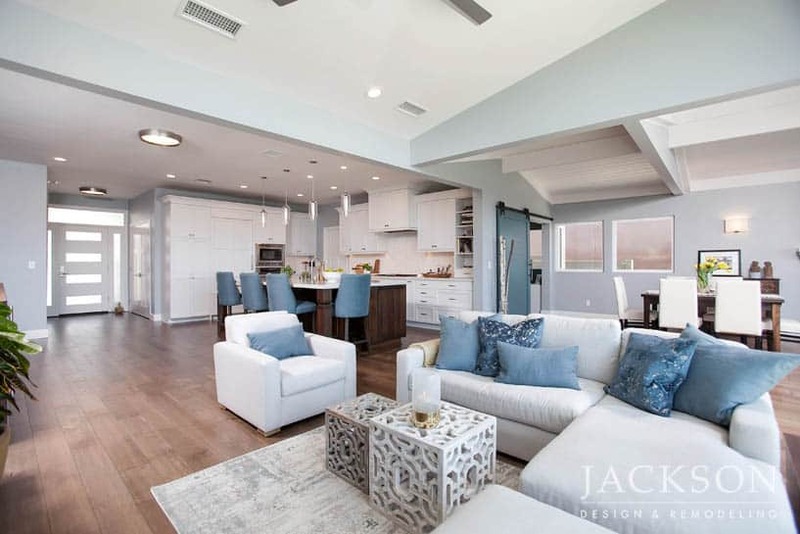 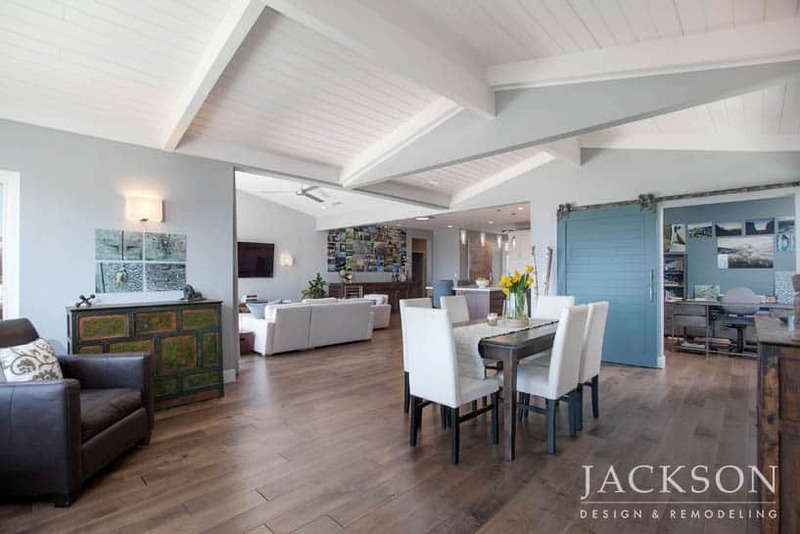 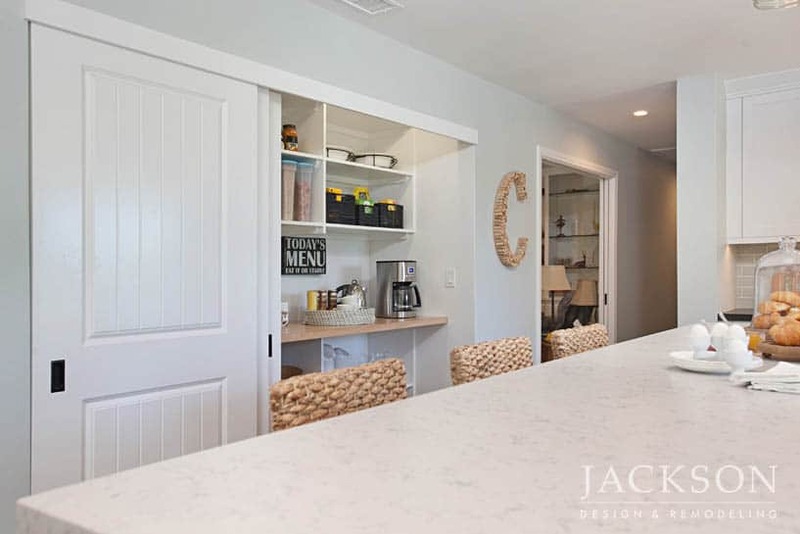 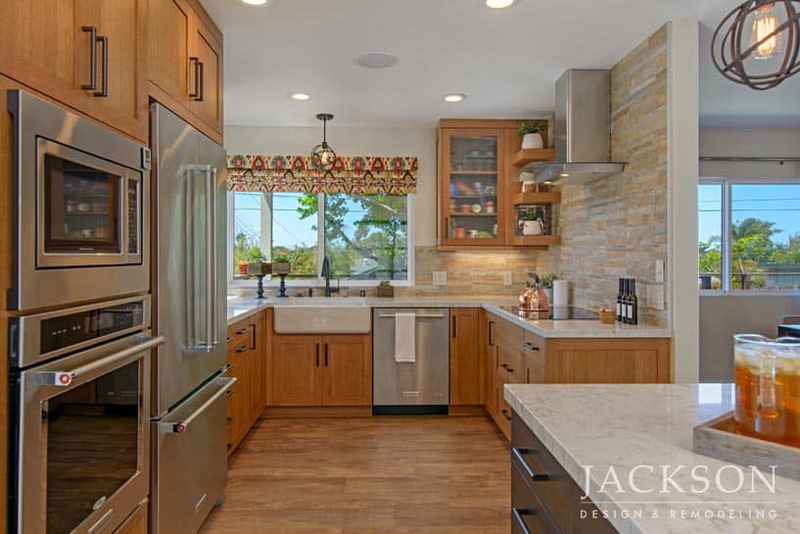 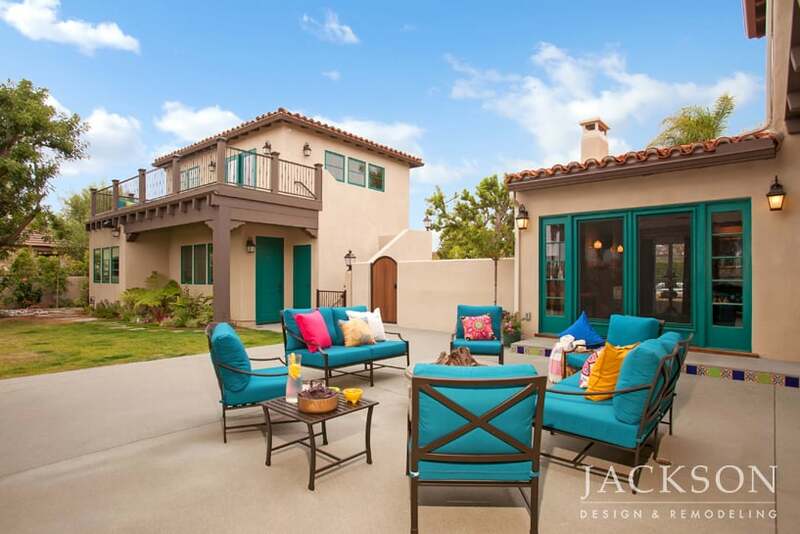 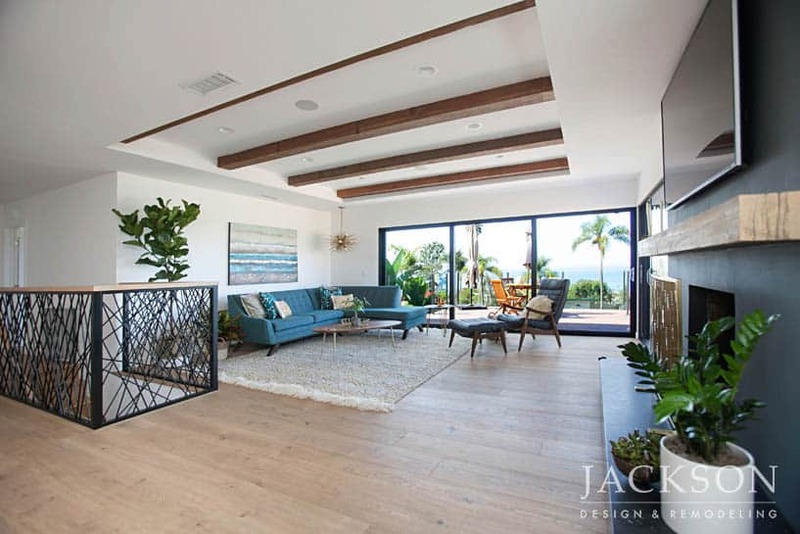 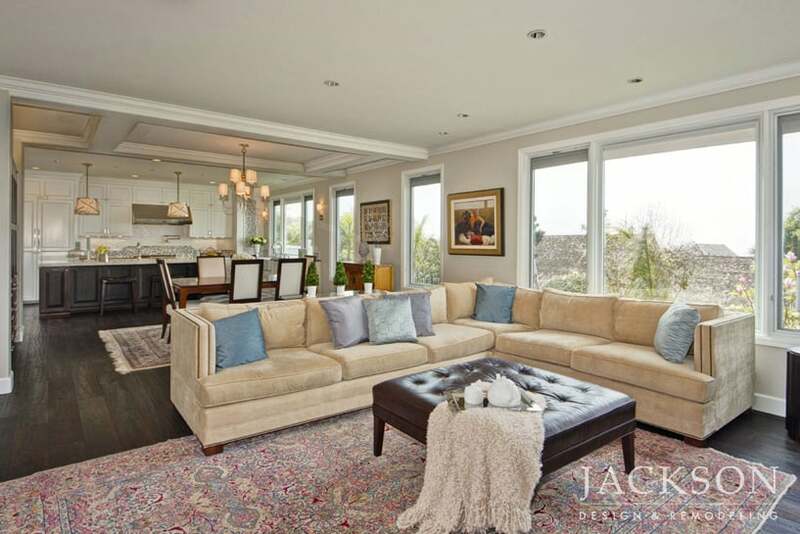 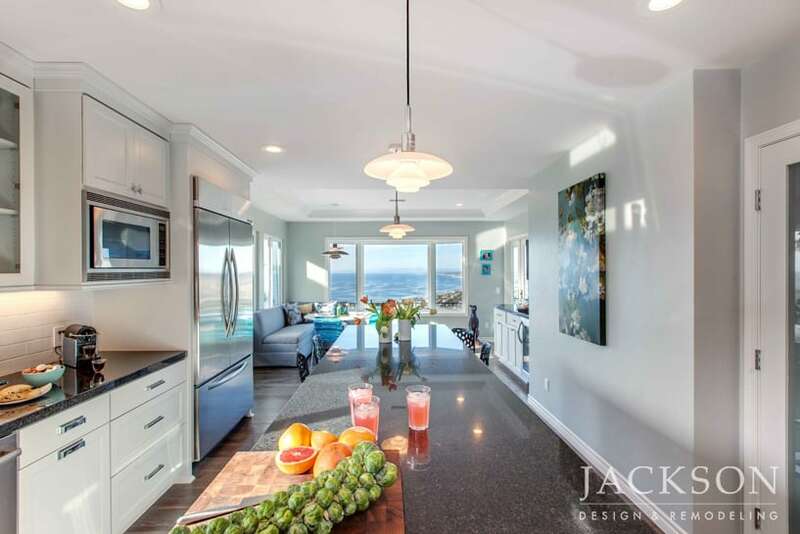 After their whole home remodel, the clients now feel as comfortable playing with their grandkids as they do entertaining friends, all while appreciating stunning ocean views. 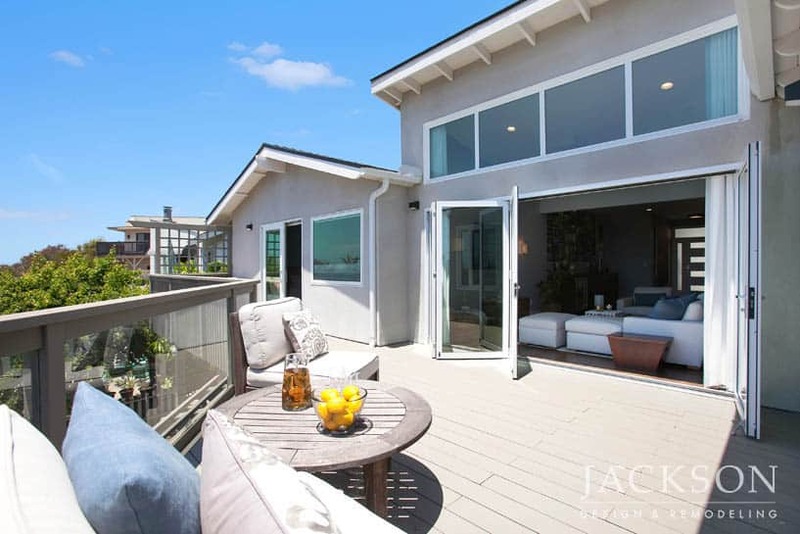 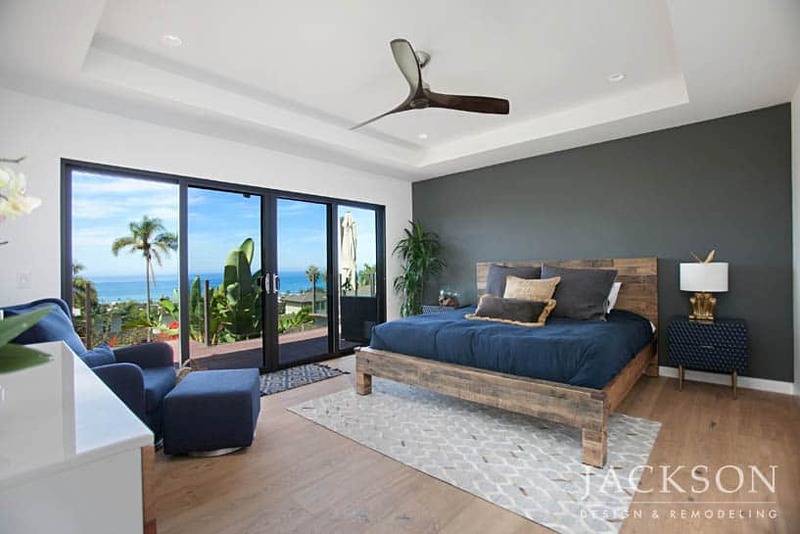 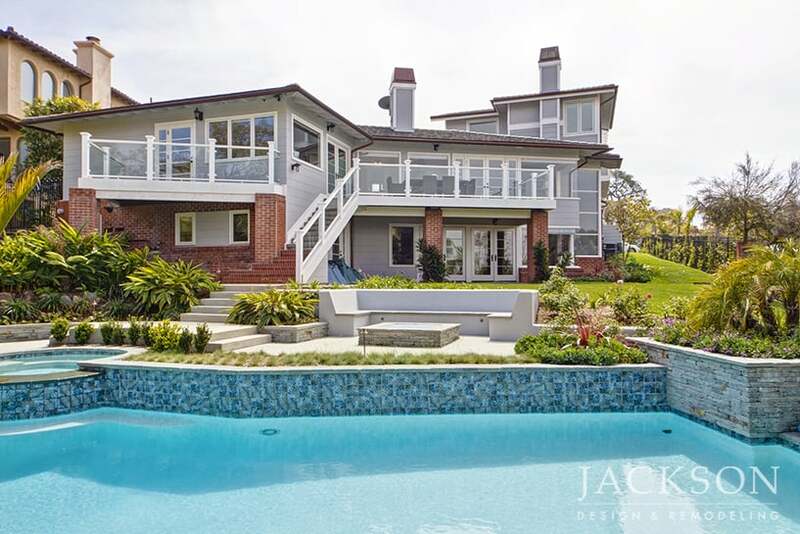 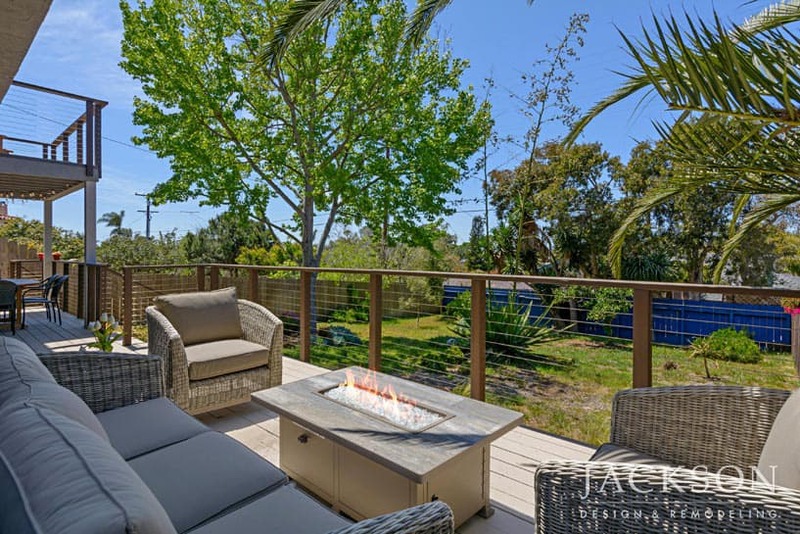 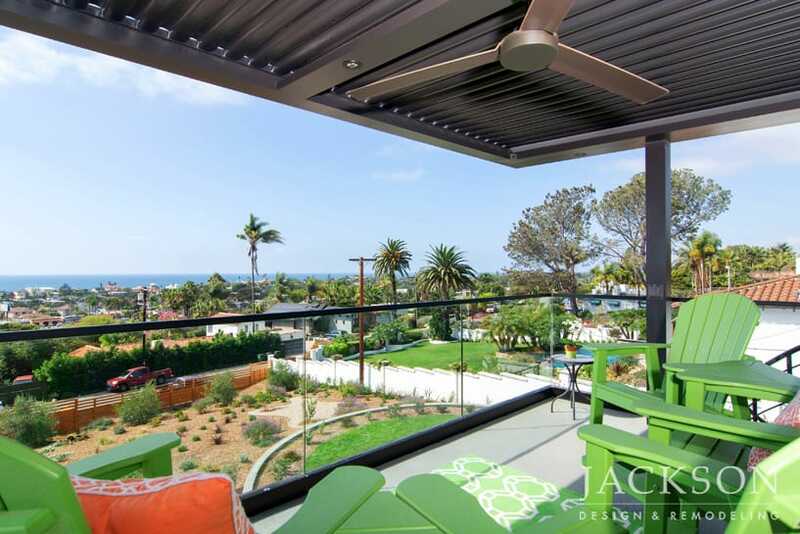 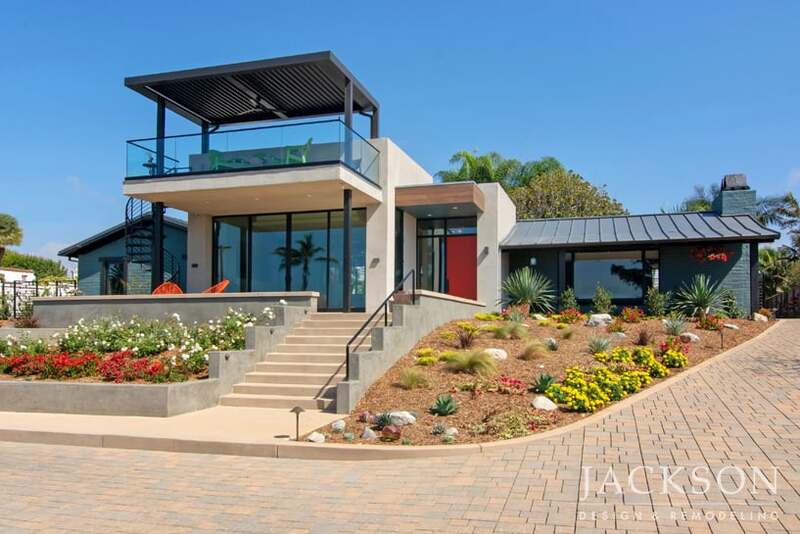 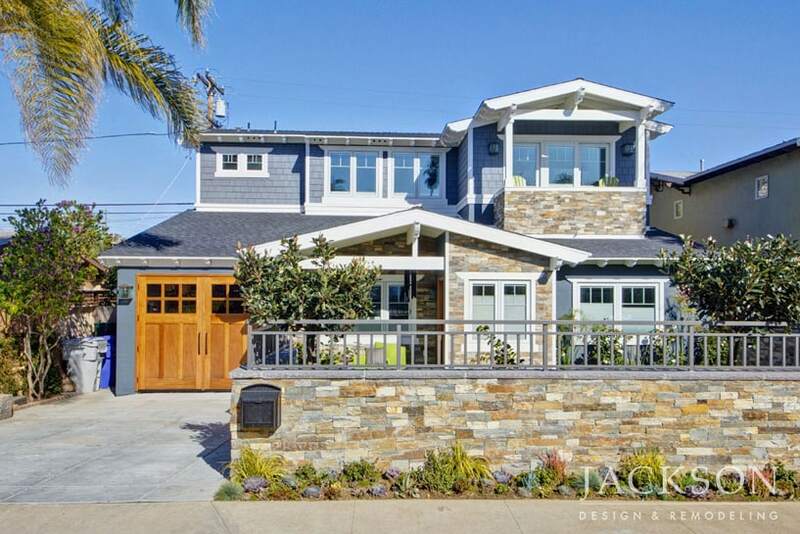 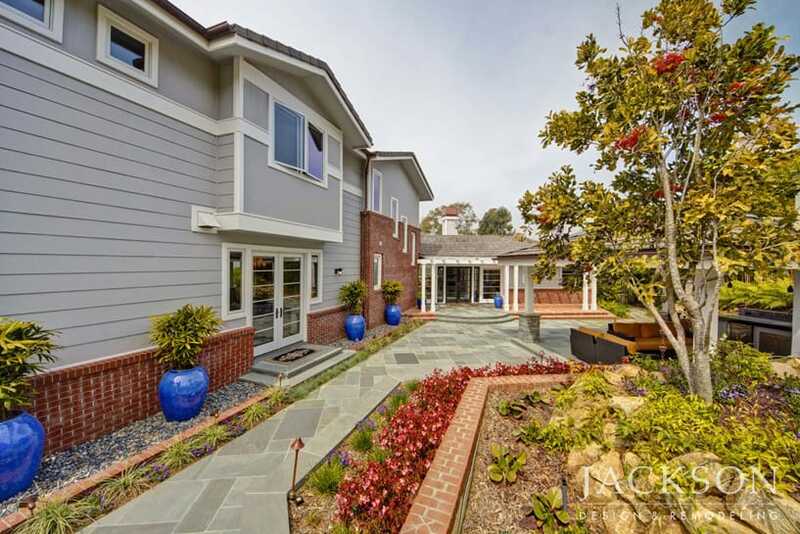 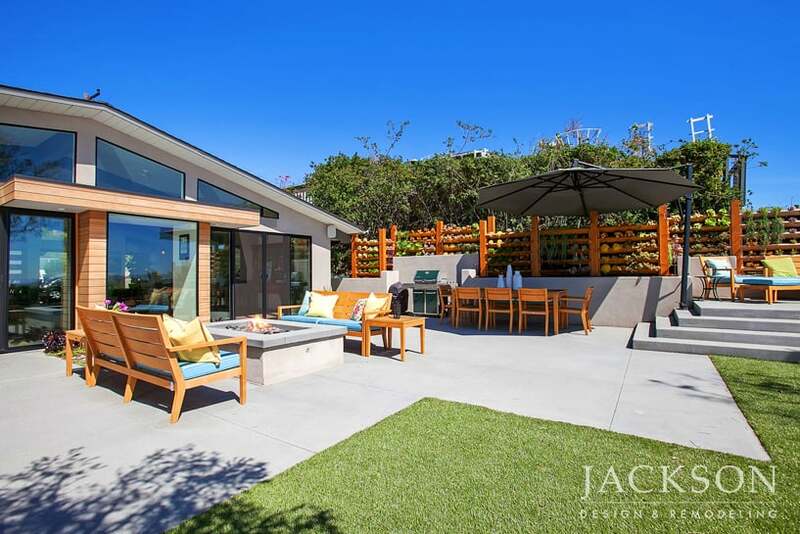 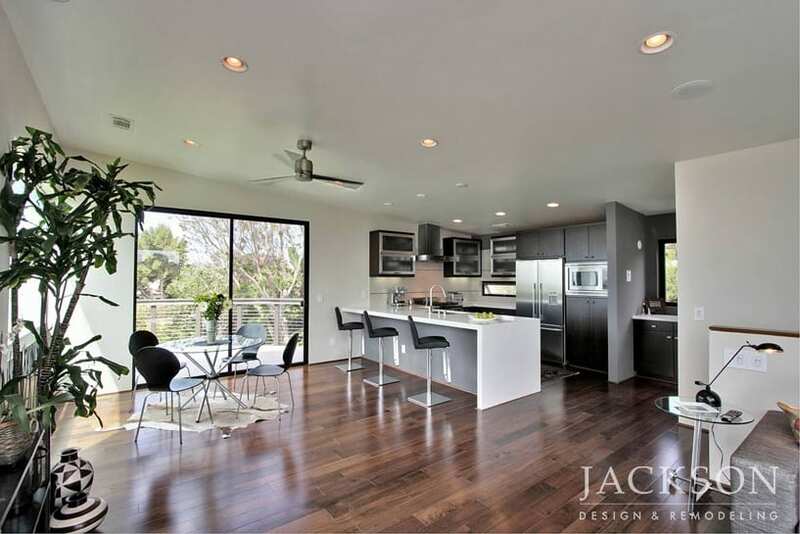 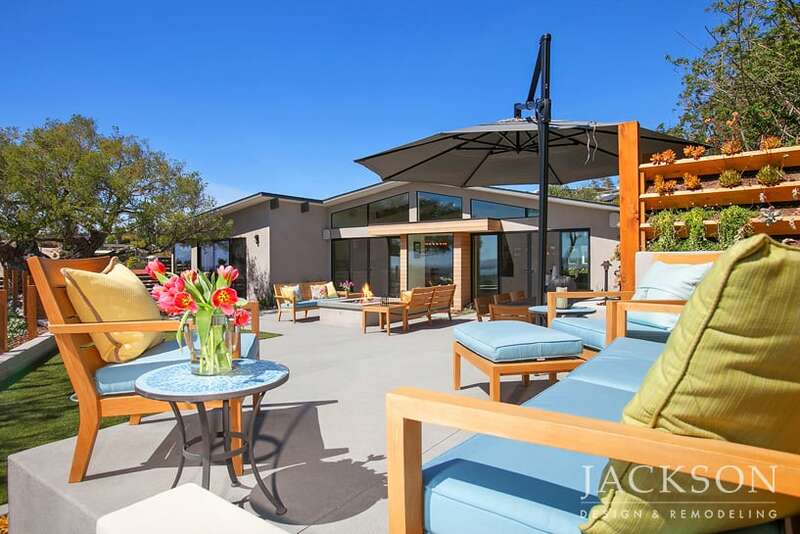 This award-winning Pacific Beach home was ideally located but the panoramic views could only be enjoyed from the roof. 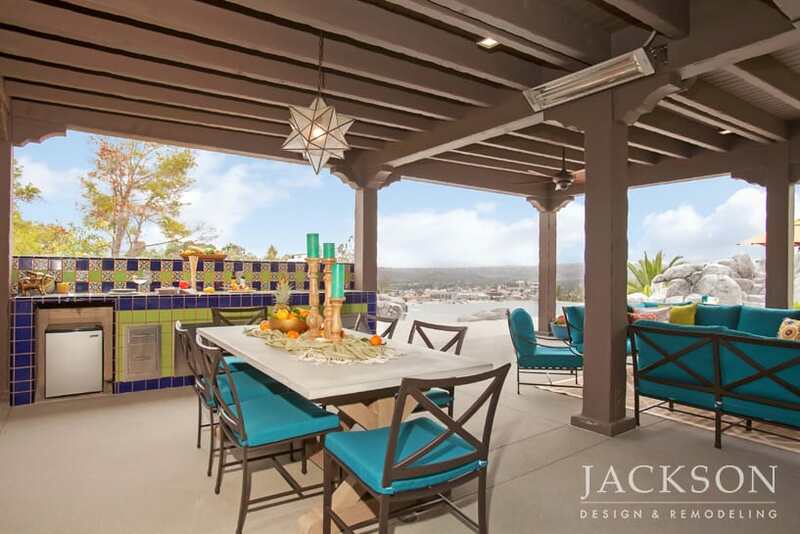 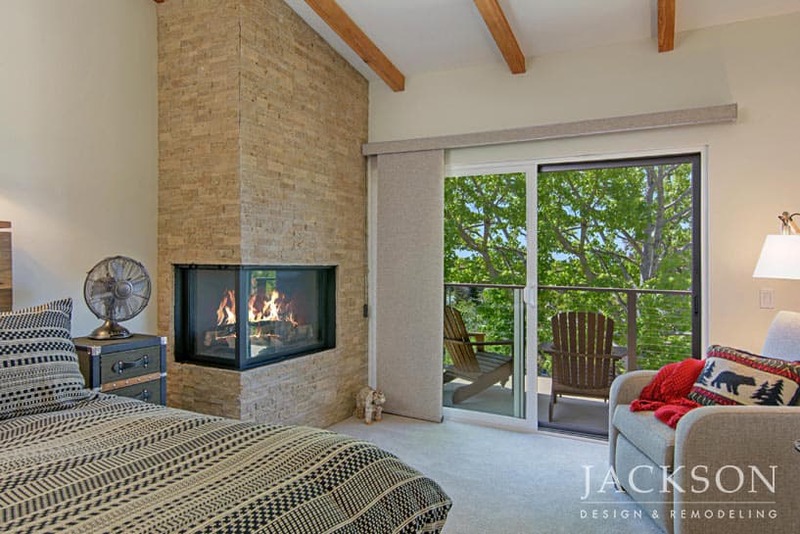 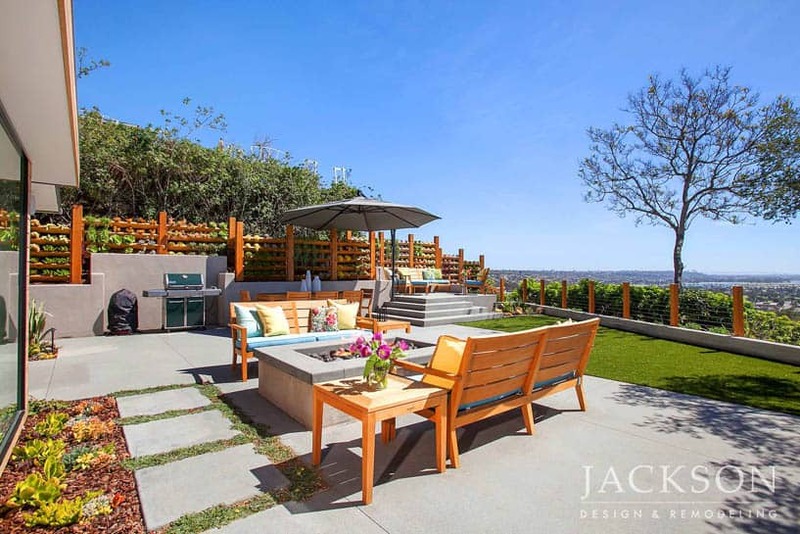 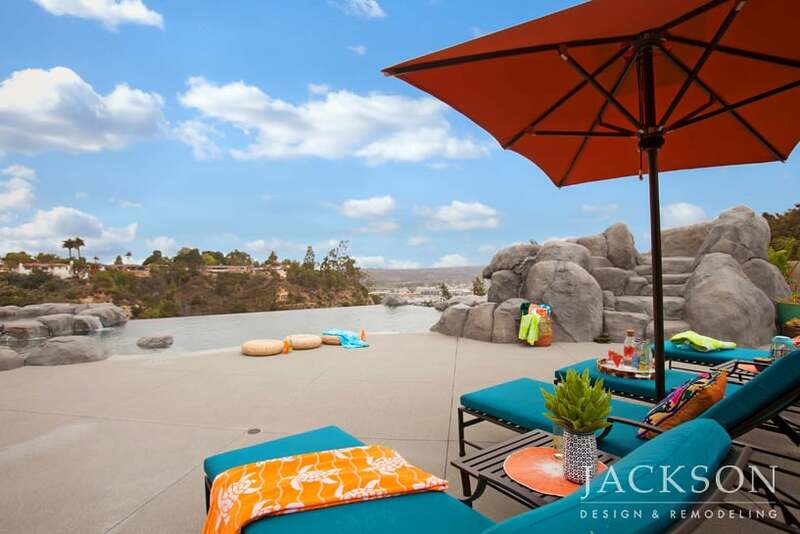 The addition included an expansive deck and a third level to access spectacular new vistas. 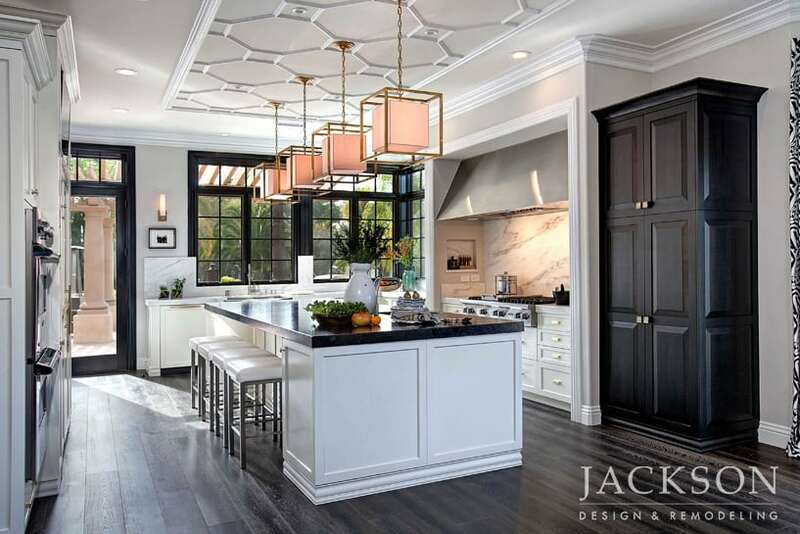 Previously a cramped space with rooms positioned to ignore its incredible natural surroundings, this magnificent home now balances striking classical and contemporary elements in an expression of graceful chic that fully embraces the outdoors. 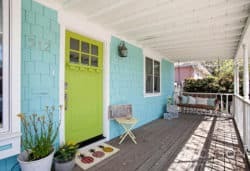 Designed for a couple while they planned their wedding, this colorful and welcoming home blends their tastes with harmonious style. 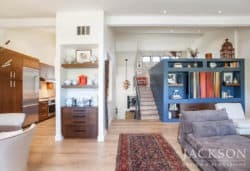 Rather than moving into a new home, the couple decided to make the husbands current home their own. 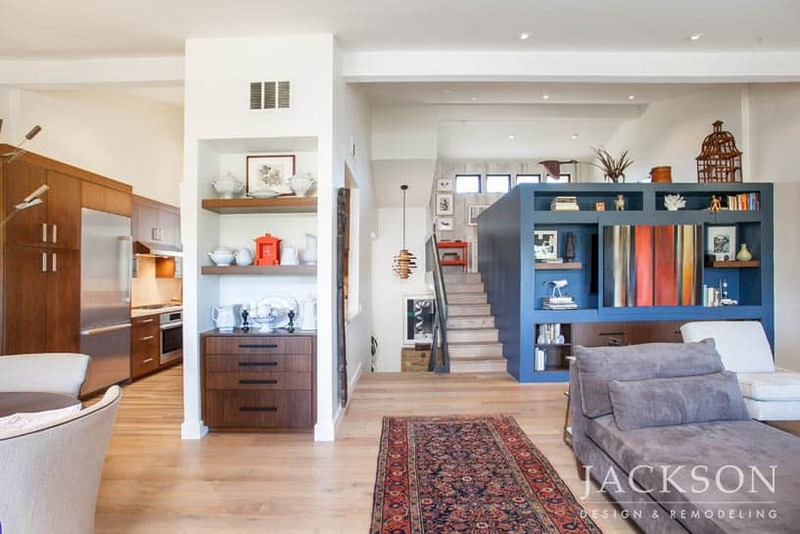 The space now truly embodies them as a couple, with a marriage of their styles. 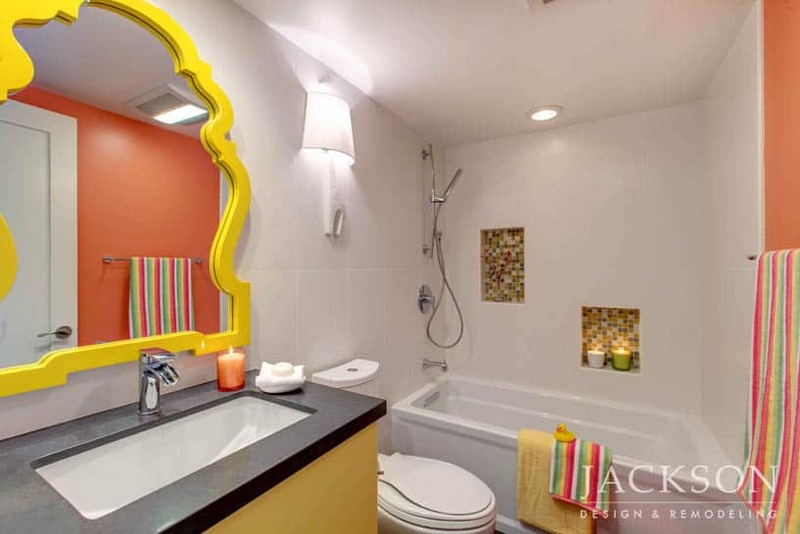 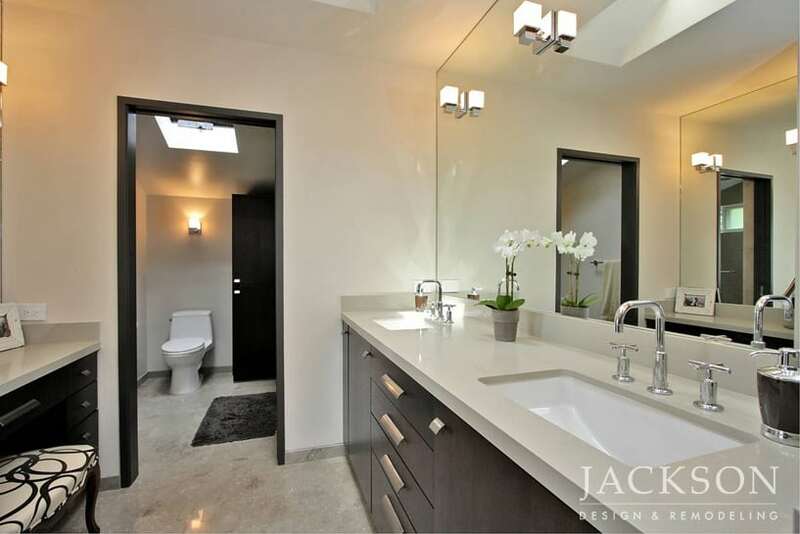 Each individual and family has very specific needs and desires for their whole house renovation. 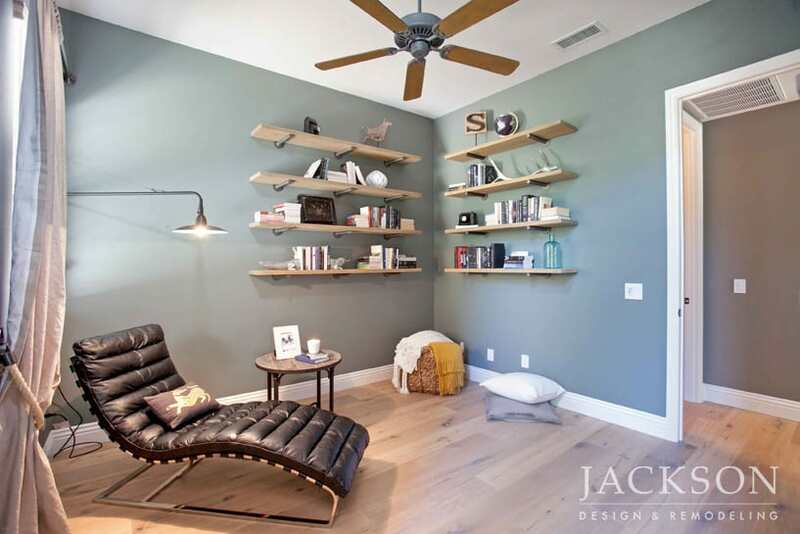 We guide you to choices that will make your space feel authentically personal, while achieving the practical functionality you need.